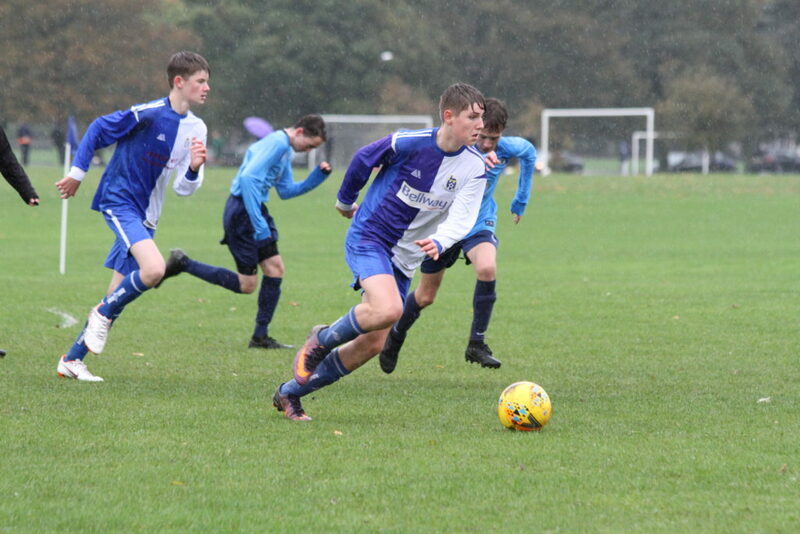 Storm Deirdre came out on top this weekend, Saturday's heavy rain causing the cancellation of most of our scheduled matches. 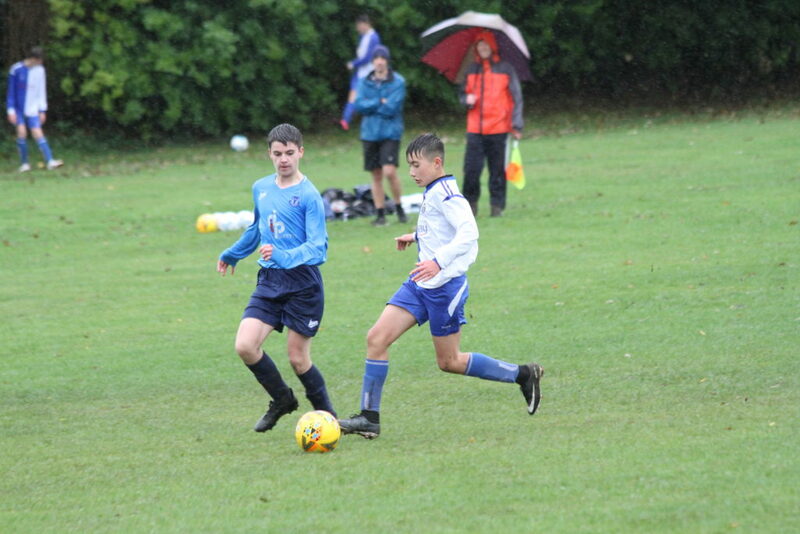 U15s managed to get a game in on Saturday morning before the heavens opened; unfortunately many of our players would have rather stayed in bed, and we were deservedly thrashed 7-0 by Brayton, an especially disappointing result given we had drawn 2-2 with the same team a week earlier. 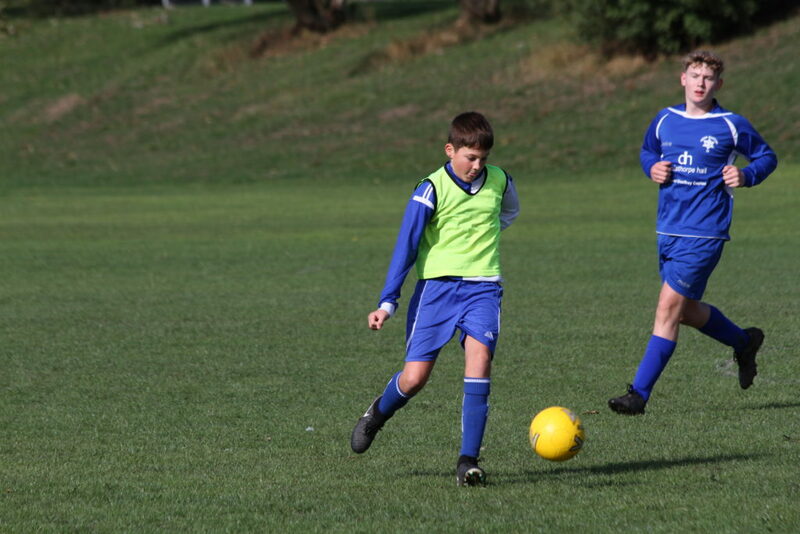 On Sunday U7s travelled to a sunny Roundhay Park to face Wigton Moor. 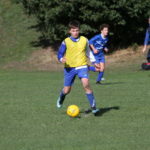 We controlled the game, playing some nice link up play and scoring some lovely goals to record a comfortable win. 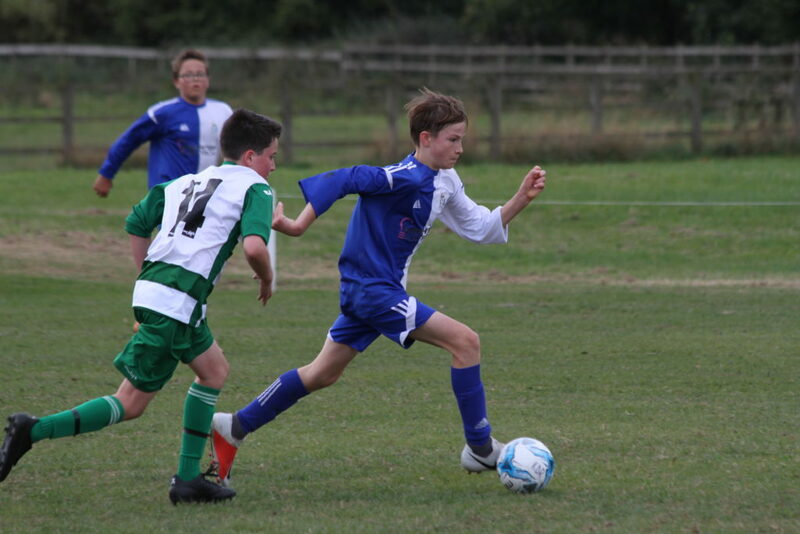 U12s played a league game against Boroughbridge Juniors at home. 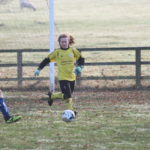 We started well, creating lots of opportunities but the Boroughbridge keeper was in fine form, pulling off a number of great saves. 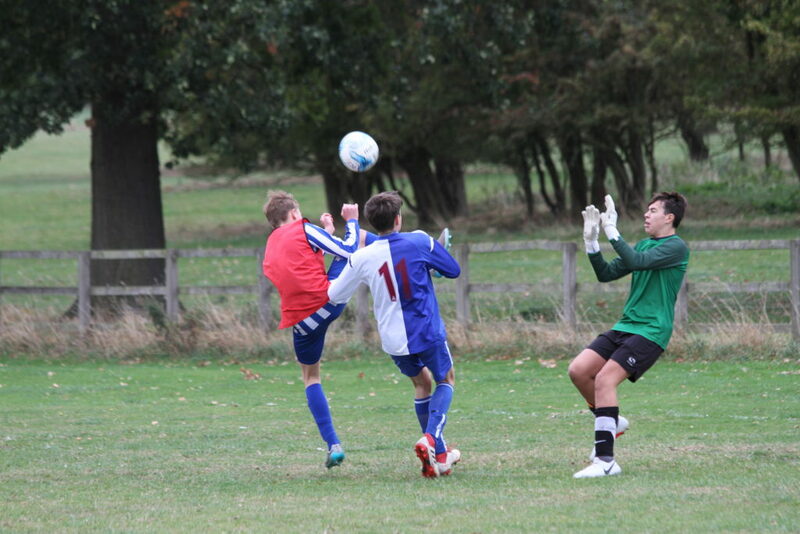 It took around 20 minutes to break the deadlock, and we added two more before the break to go in 3-0 up at half time. 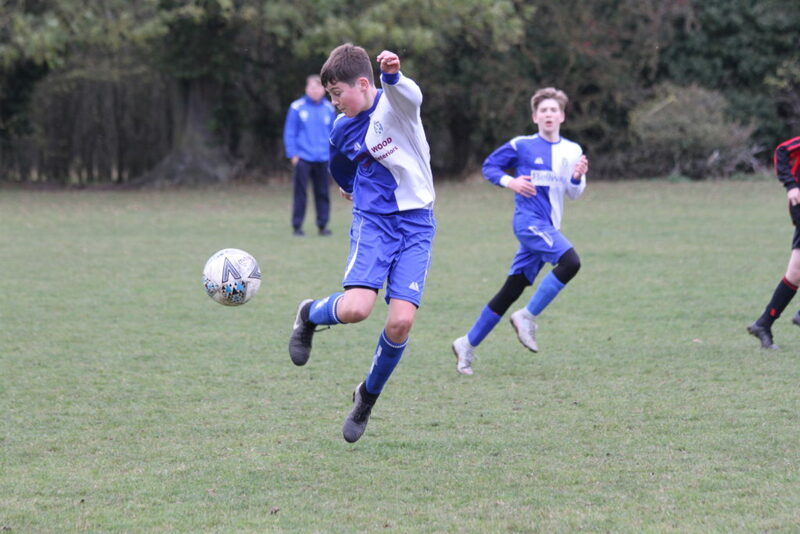 The second half performance was even better, with some good quality defending, three excellent team goals and a couple of stunners from long range. 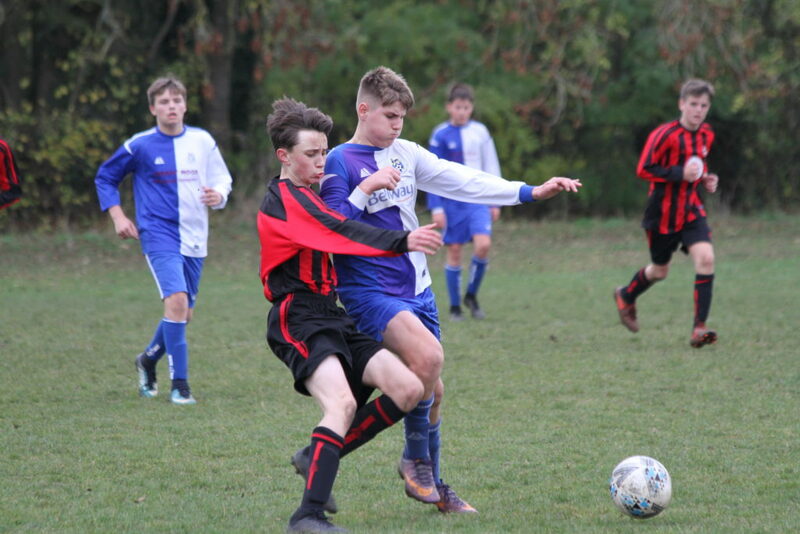 Unfortunately we failed to keep a clean sheet, allowing Boroughbridge to score a consolation goal late on, but all in all a fantastic 8-1 win. 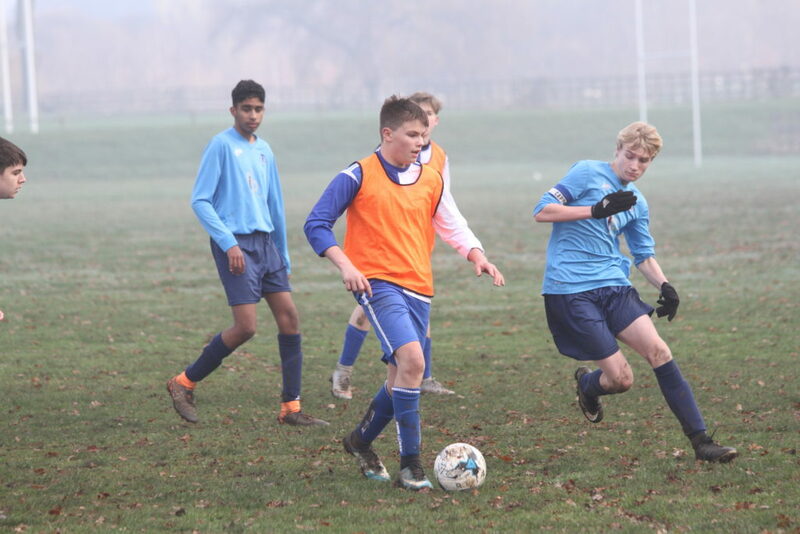 U14s beat previously unbeaten Pannal Sports 4-2 at Grange Park to go back to the top of the league table. 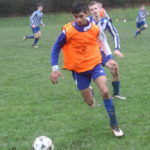 On a wet, bobbly pitch we had to abandon our usual patient, passing game and play route one football, to great effect. 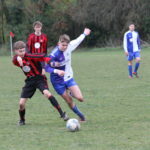 Had some of the boys been a little less selfish in front of goal during the second half our winning margin could have been greater. 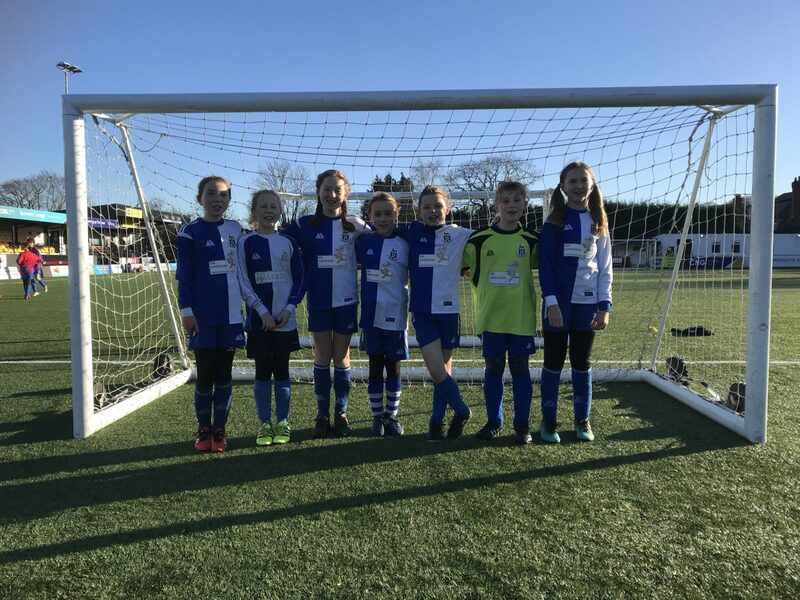 U11s Girls played in the League Gala at Harrogate Town's CNG Stadium, finishing joint third with some superb individual and team goals. 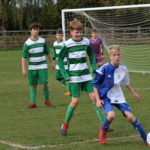 U12s played away at New Park Bull Dogs. 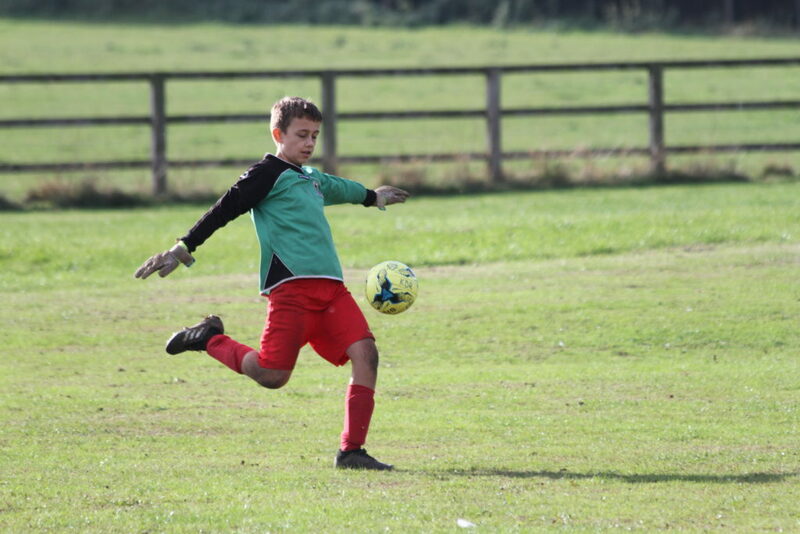 In a game where we had the majority of the possession and New Park were happy to play on the counter attack, we took a two goal lead but conceded a penalty early in the second half, which our keeper (ultimately the man of the match) was unfortunate not to keep out. 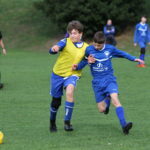 After that we dug in and played some neat football to win the match 5-2 and maintain our unbeaten record in the league. 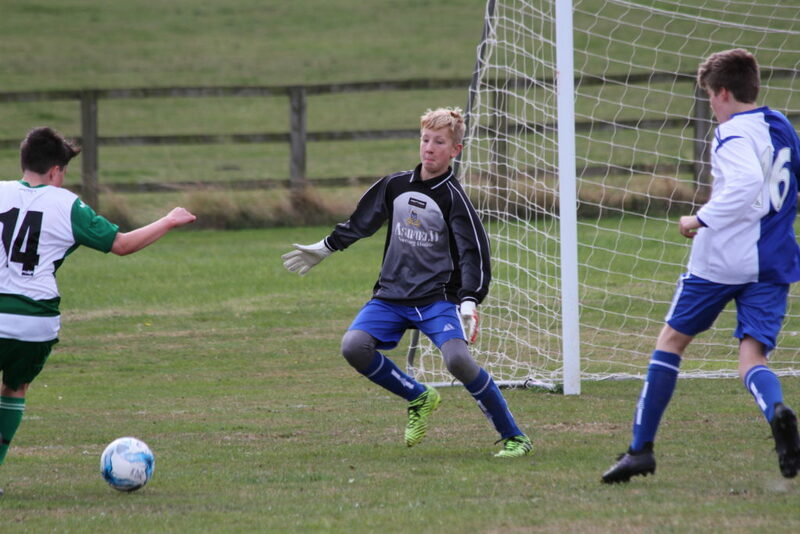 U13s were at home against a strong Ilkley side. 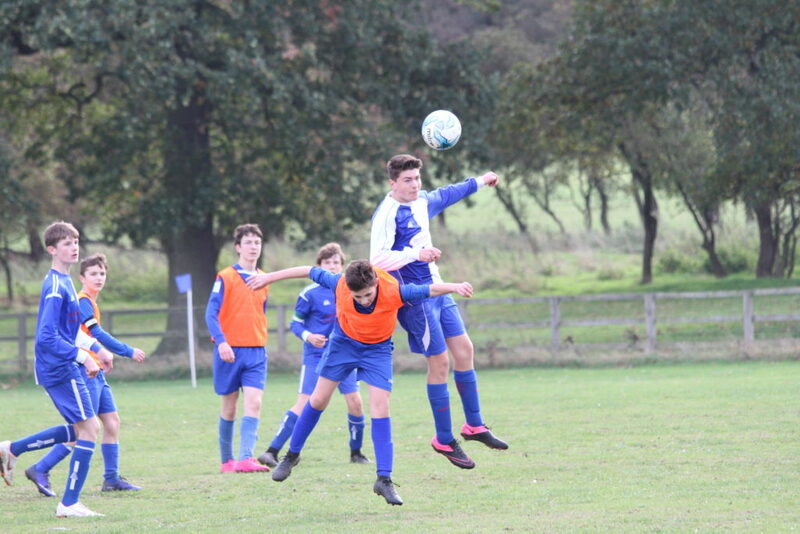 A mismatch on paper - Ilkley are second in the league, we are firmly in the bottom half - the boys played their socks off, were first to every ball, and ran out resounding 5-1 winners. 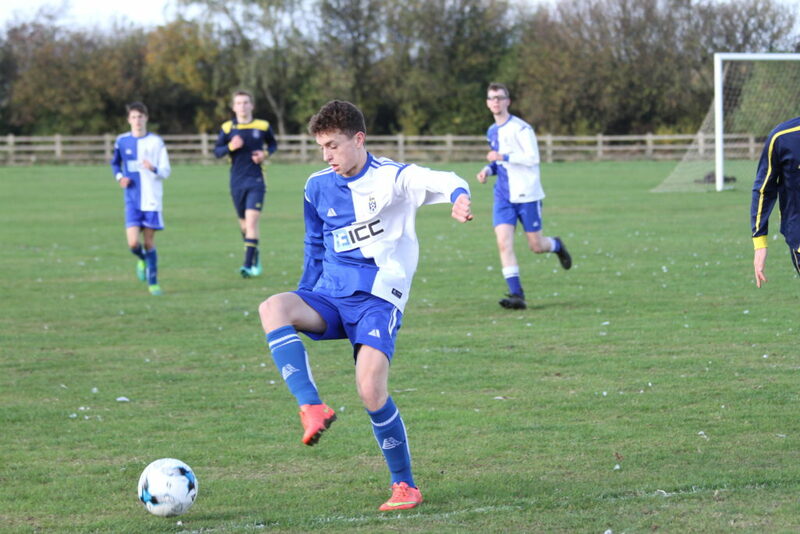 U15s played out a competitive 2-2 draw at home to Bedale. 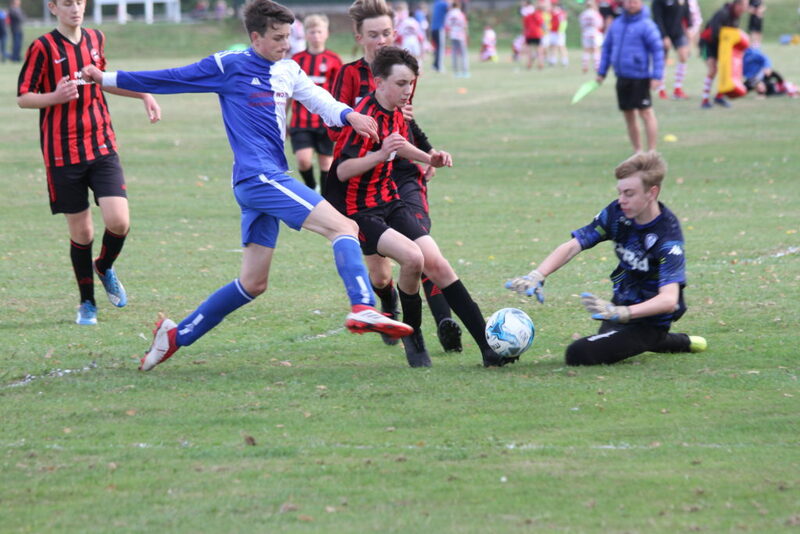 A goal down (deservedly) at half time, we battled back to lead 2-1, but conceded an unfortunate equaliser late on. 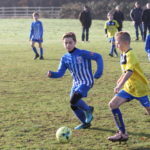 U10s played Wetherby at home on a windy and bitterly cold morning. 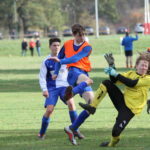 The boys put in a great all round performance to completely dominate all four games. 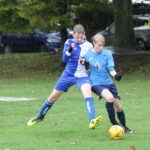 U14s Girls made hard work of the League Cup tie against the wonderfully named Woodkirk Valley Wolverines. 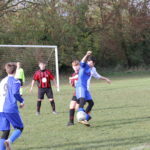 We were in front twice only to be pegged back both times, and as the clock ticked down and a penalty shoot out beckoned we were awarded a last minute penalty. 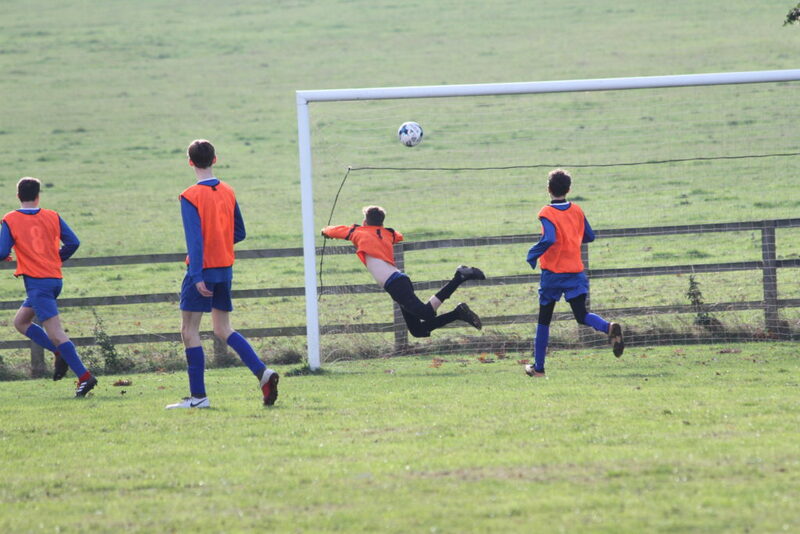 A beautifully stuck spot kick into the top corner took us through to the semi final. Final score 3-2. 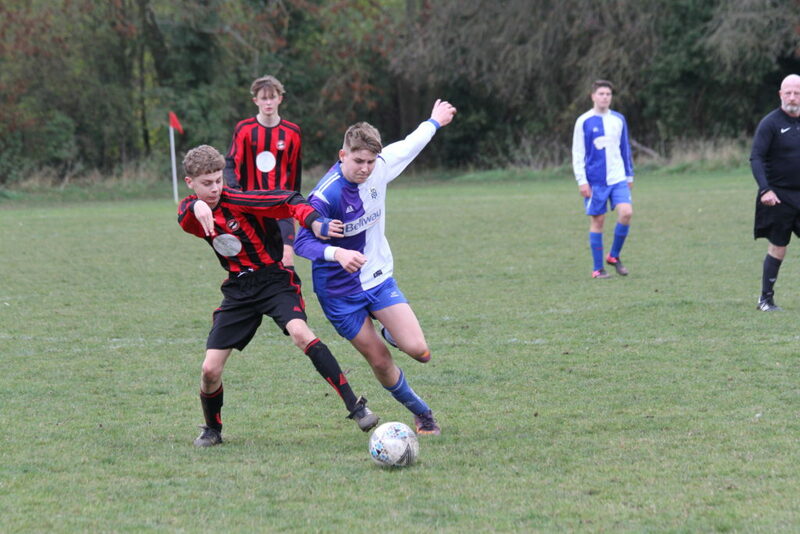 U15s travelled away to second place Brayton, one of the strongest teams in the league. Once again playing an attacking 4-2-3-1 formation, we conceded after 20 minutes but pulled one back before half time. 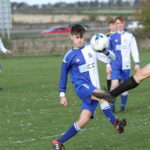 Brayton regained the lead early in the second half, but they struggled all game to cope with Cameron McKay's pace, and he deservedly grabbed an equaliser to tie the game 2-2. 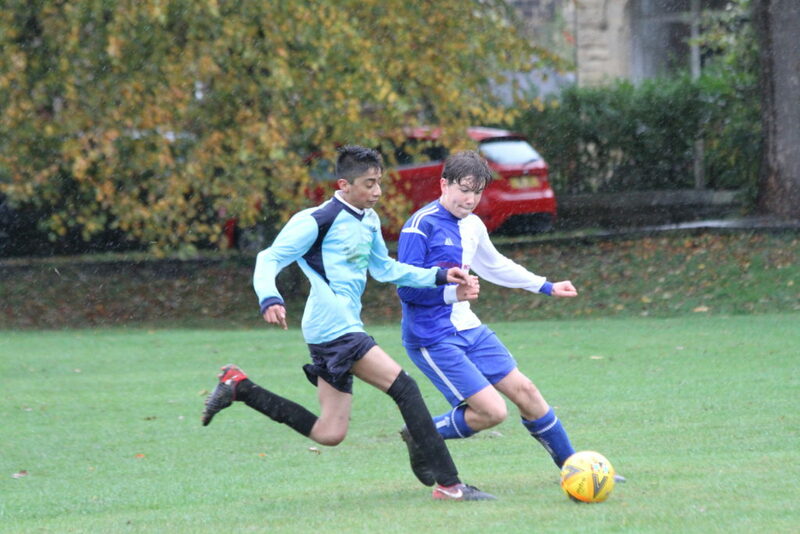 U16s beat Ilkley 6-3 at Grange Park. 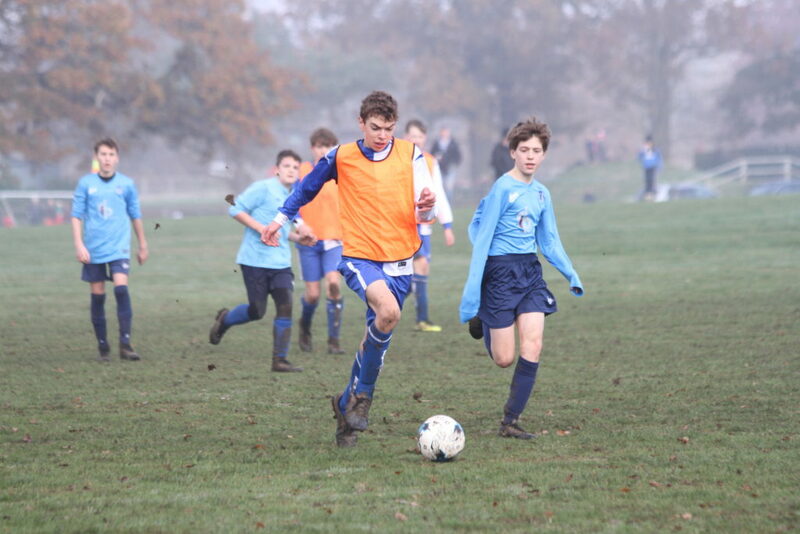 It was a good game where we always had the edge over the opposition. 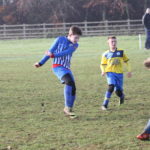 U7s were lacking one of their strongest players away at Otley, and despite a good start were unfortunate to be behind at half time. 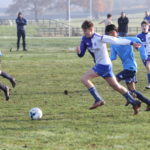 They continued to play good football after the break, and got their reward, overturning Otley's lead to finish the game victorious. 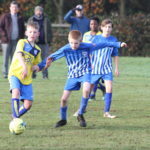 U9s played against Killinghall at Grange Park. 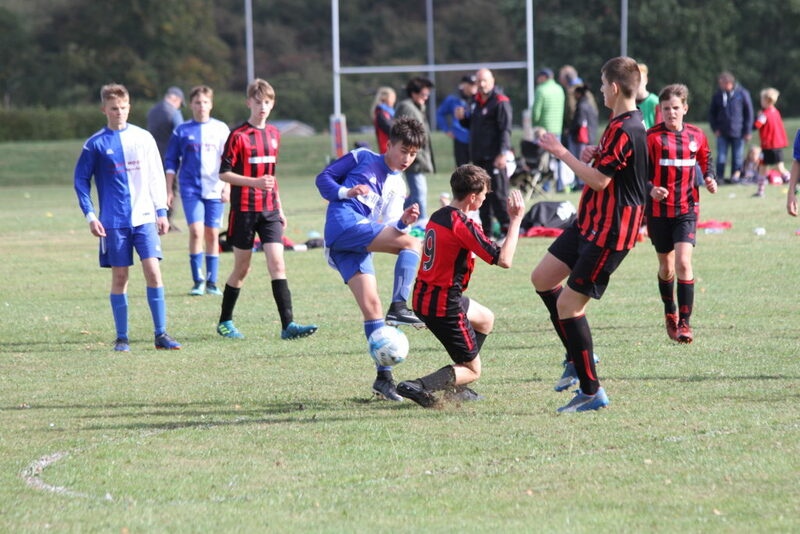 One of our teams was depleted by injury and player unavailablity and consequently struggled, losing both games. 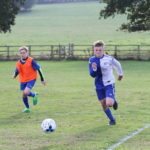 The other team produced their best performance of the season, winning both games. 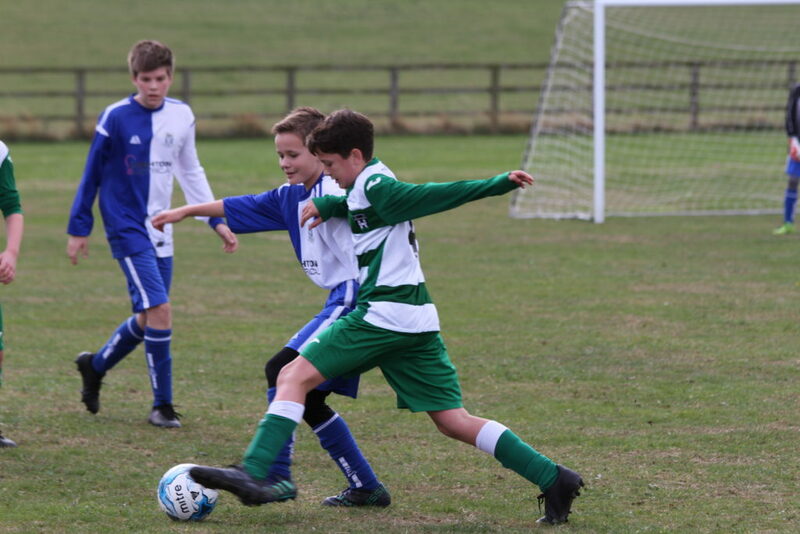 U11s played a Cup semi final away at Wigton Moor. Both our sides gave a monumental effort, leaving the field absolutely shattered. 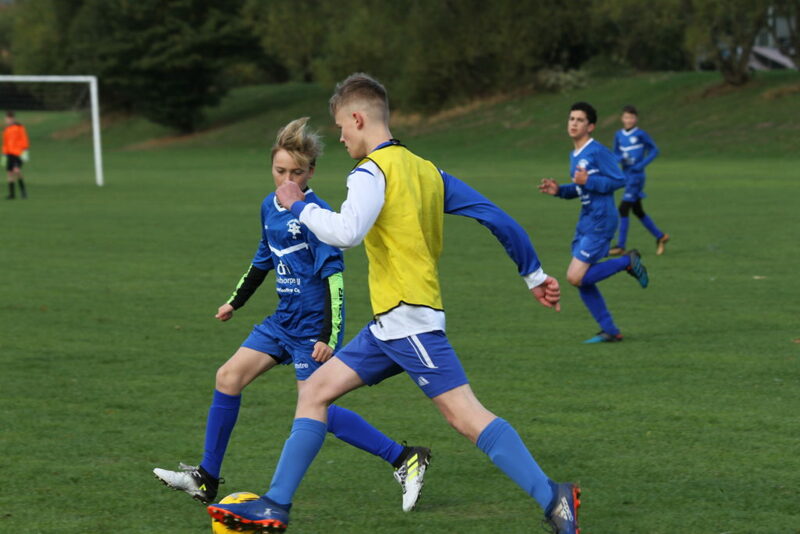 We got 3 wins and a draw, to progress to next week's Cup final. 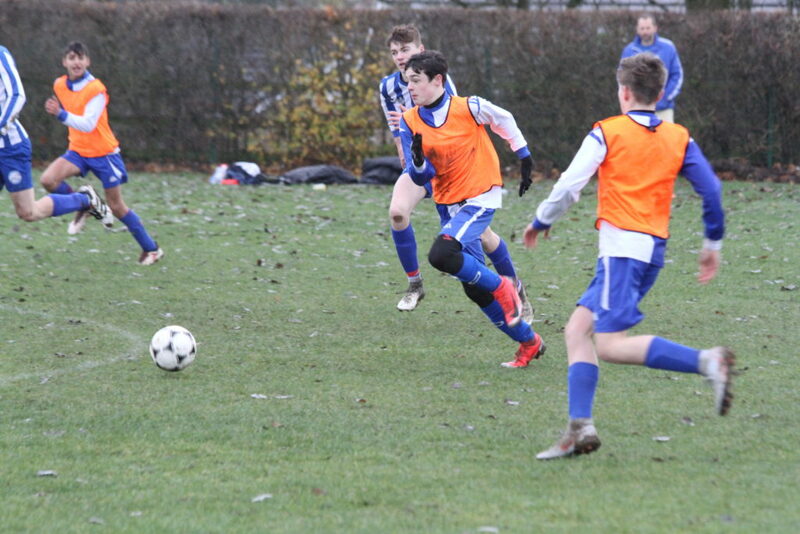 U14s Girls played against Ossett Albion in the County Cup. 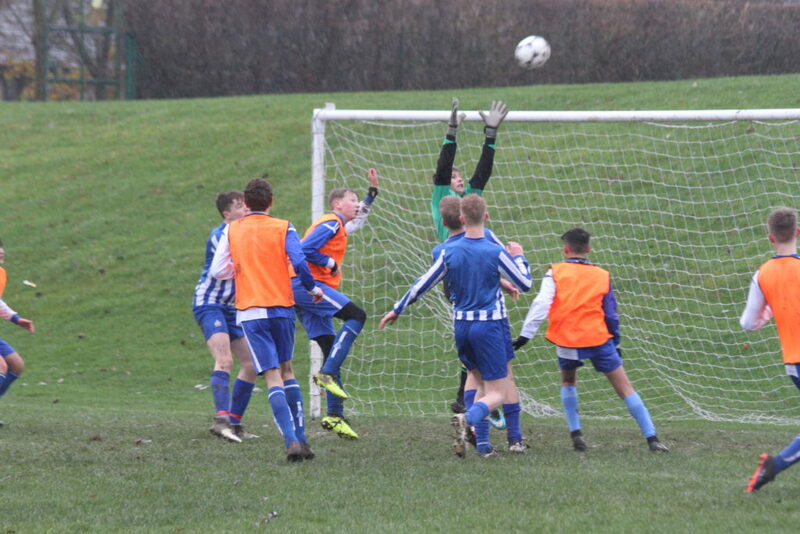 A humdinger of a game that swung one way then another - from 1-0 down we quickly turned it round to lead 2-1, but Father Christmas defending on our part gifted our opponents 3 goals, to make the score 4-2 to Ossett at half time. 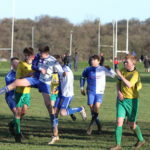 A five minute blitz early in the second half restored a 5-4 lead, only for Ossett to respond and go back in front 6-5. 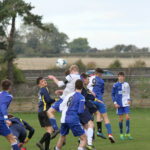 The floodgates then closed and the score remained unchanged until just before the end, when we grabbed the equaliser to tie the match 6-6 at full time. And so to penalties. Out of ten spot kicks only three were converted, thankfully we scored two of them to progress to the next round. 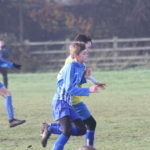 Depleted due to illness and injuries, U14s lost 4-1 to Garforth A League side Wigton Moor in a Cup tie at Soldiers Field. 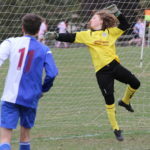 The boys put in a good performance, and our goalkeeper was the Man of the Match. 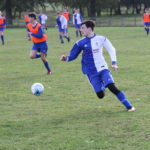 U17s also played against Wigton Moor, and came away with a 9-2 win. 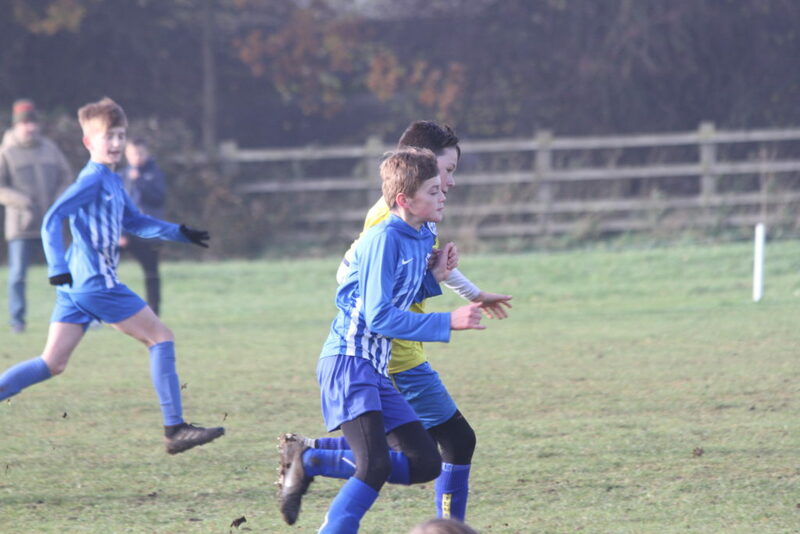 U11s Girls played against Bedale at home. 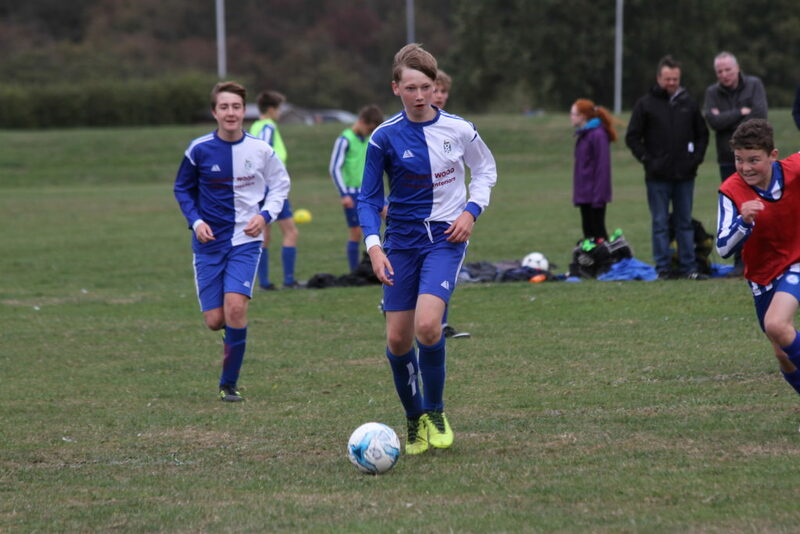 We gave away early goals in each half, going down 7-3 in an evenly matched game. 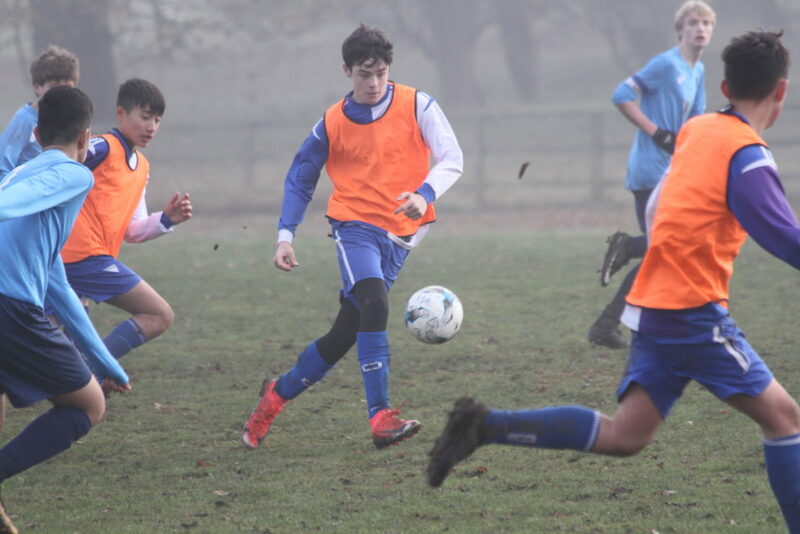 U15s experimented with a new 4-2-3-1 formation in their game with Aberford, with the aim of promoting a more attack-minded approach utilising wing backs and three attacking midfielders. 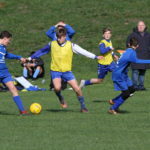 It obviously worked, 2-0 ahead at half time, 4-2 up at the end. A much needed and well-deserved win. 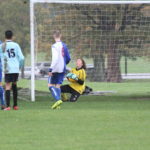 U16s Girls got a fine 6-3 win against Stamford Bridge. 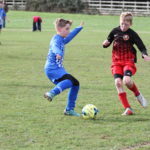 U8s played away at Wigton Moor, winning one and losing three games. 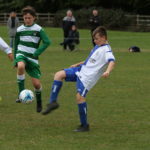 U11s played Pannal Sports in their final game in the group stage of the Cup. 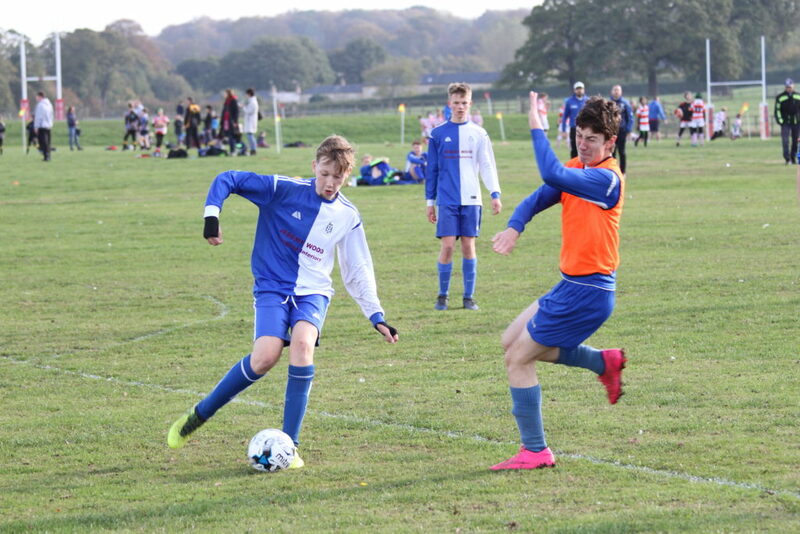 After recording three convincing wins we got a little complacent and surrendered a winning position in the final game to give Pannal the win. 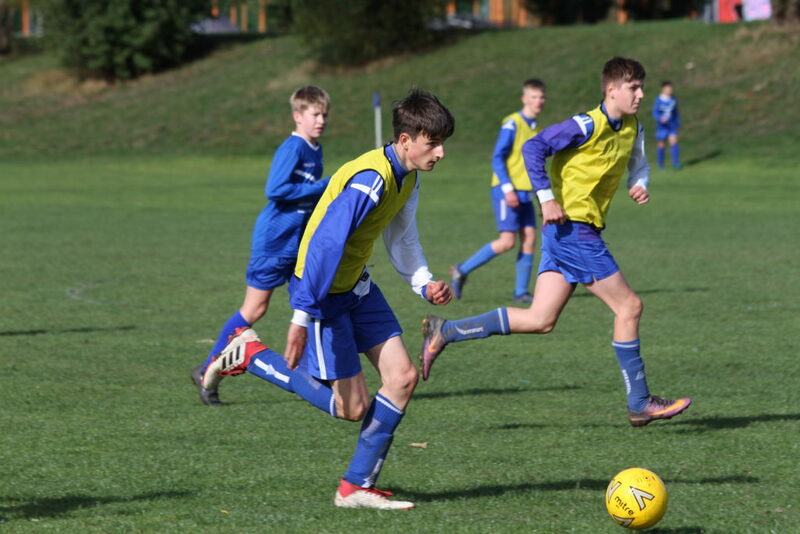 3 wins and a defeat mean that we made it through to the semi finals. 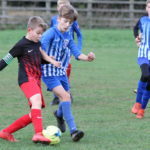 U12s played a friendly match against Collingham. 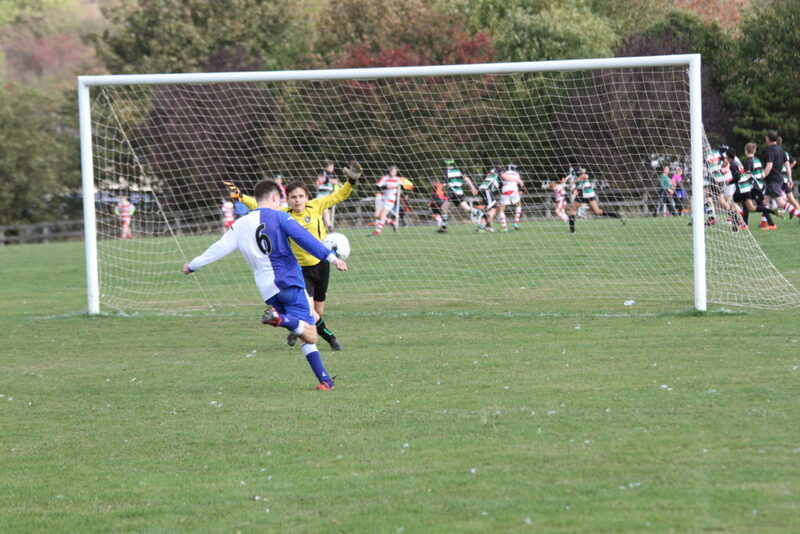 We started brightly and took an early lead from a long range free kick. 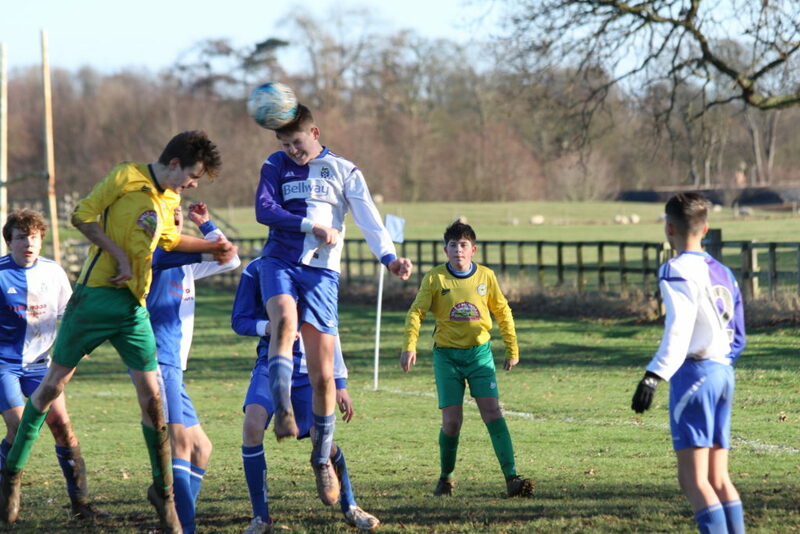 Sloppy defending allowed Collingham back into the game and the score was all square at half time. 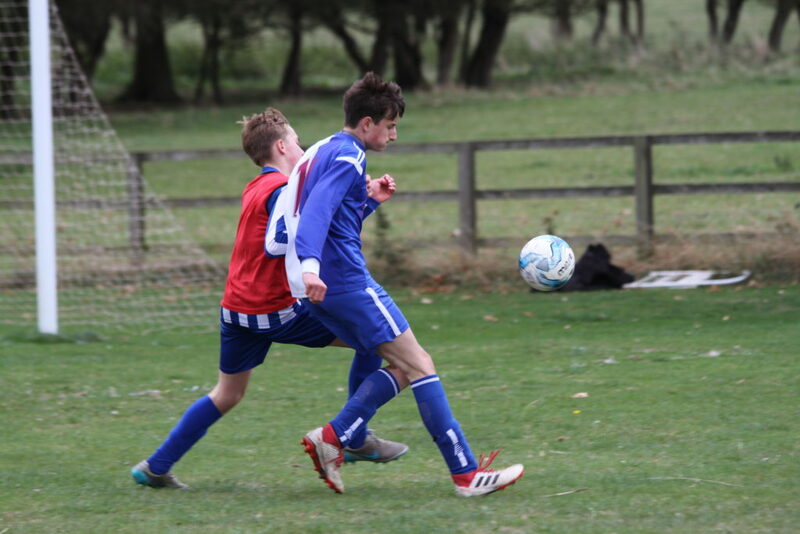 In the second half we hit the bar, missed a couple of one-on-one chances, and scored from a penalty, but Collingham came out on top, winning 4-2. 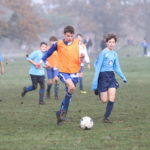 Two of our teams were in action against Beckwithshaw. 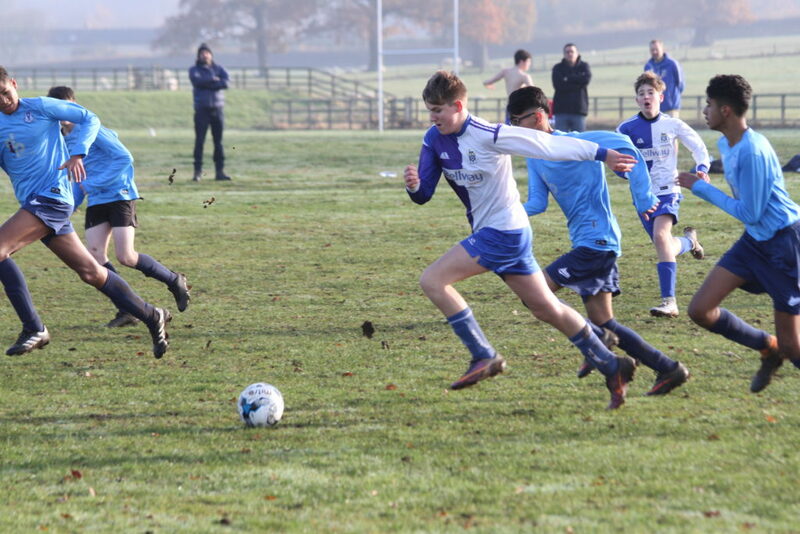 At Grange Park the U13s produced their best football of the season. 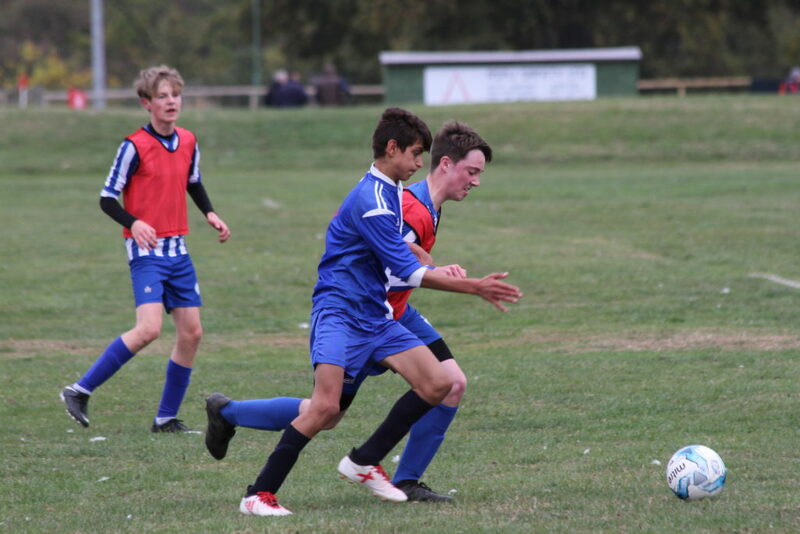 Leading 2-1 at half time, the boys came out in the second half and totally dominated the game, ending up 5-1 winners. 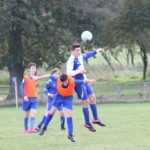 U15s made the trip to Rossett and got a 2-2 draw in an entertaining, closely fought contest, to stay top of the league. 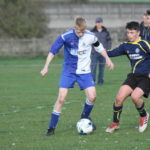 U17s were missing a number of regulars and were down to just 11 players against a strong Guiseley side that had previously lost just once all season. An amazing team performance saw us come away with a 4-2 win. 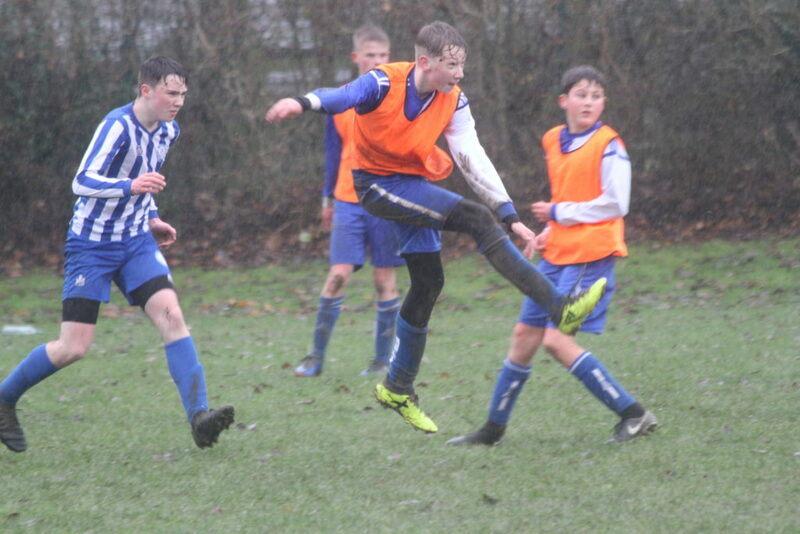 U14s hosted league leaders Garforth Villa for a top of the table match at a rain swept Grange Park. 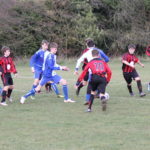 The two sides drew 1-1 back in September and both went into the clash unbeaten. 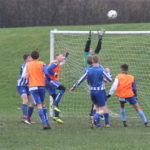 The crowd knew that they were in for an exciting afternoon when straight from the whistle Garforth surged forward and made keeper Leo Hurrell pull off a fantastic save. 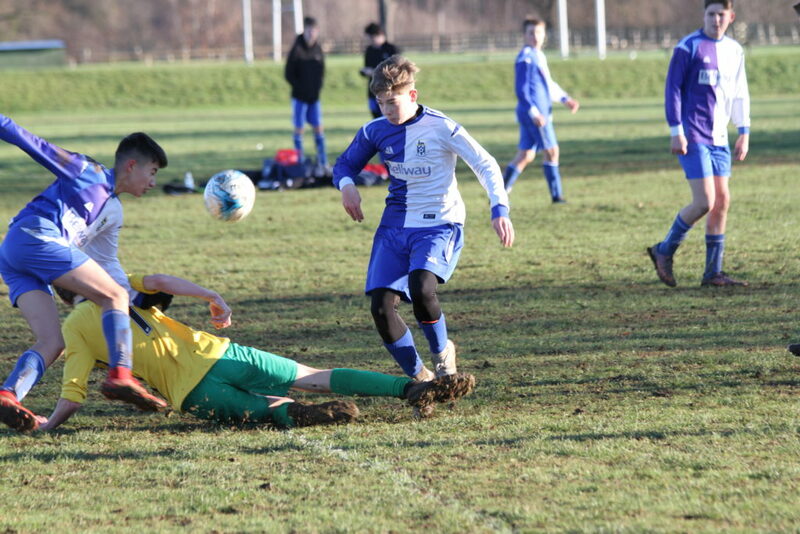 He then immediately used his powerful kick to release our fast forwards, and left winger Alex Brewer was only stopped by an incredibly brave save from the Garforth keeper. It could have been 1-1 within the first 60 seconds. 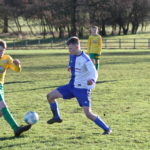 The stalemate was finally broken in the 30th minute when we won a free kick on the edge of the area and our talented left footer Gabriel Mead stroked the ball into the top left hand corner, an absolute peach of a goal which the Garforth keeper didn’t have a chance stopping. 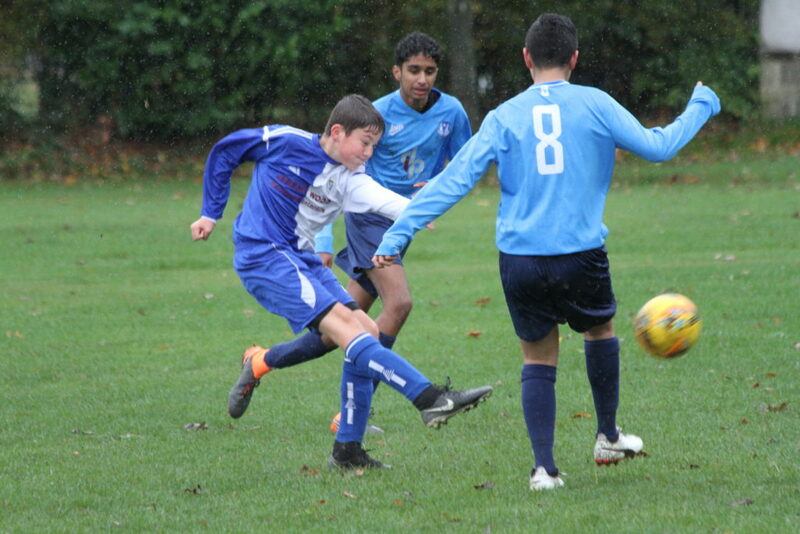 After the break and despite the wet conditions both sides played the short fast ball well and made plenty of chances. 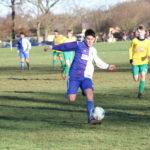 Ten minutes from the end Mason Desouza received a ball in the box and with very little space shot it past the keeper for our second. 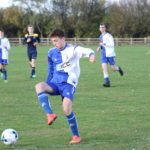 That then generated momentum in our midfield; Harvey Britton scored the third and Gabriel Mead went on to score his first hat-trick of the season, his second from his boot from a dinked cross from striker Rhys Hemingway and his third a powerful header from a DeSouza corner in the final minute of the match. 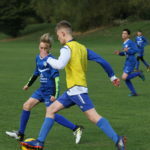 The keeper and defence were rightly thrilled with their clean sheet against a strong attacking Garforth team, the match finished 5-0. Half way through the season we now head the league with 22 points from a possible 24. 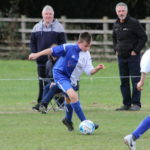 Wetherby Glass Man of the Match was awarded jointly to Gabriel Mead and Harry Hudson. 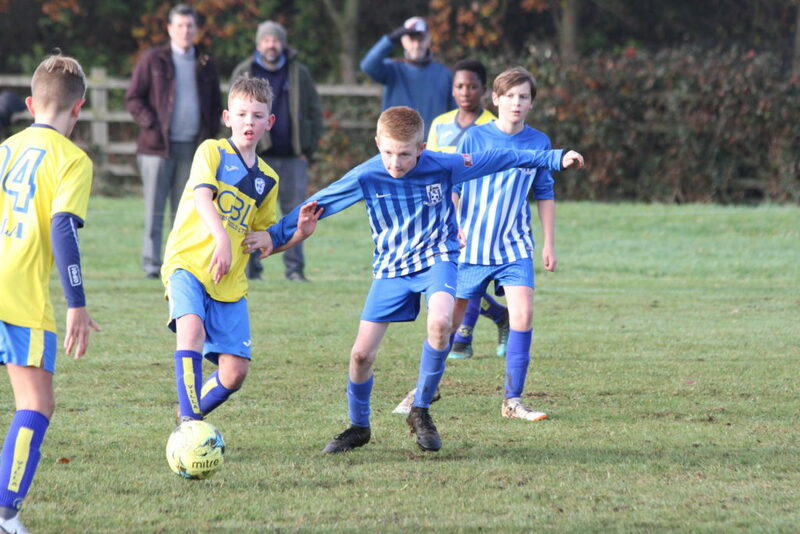 U10s played Pannal Sports at home in the semi final of the Cup. 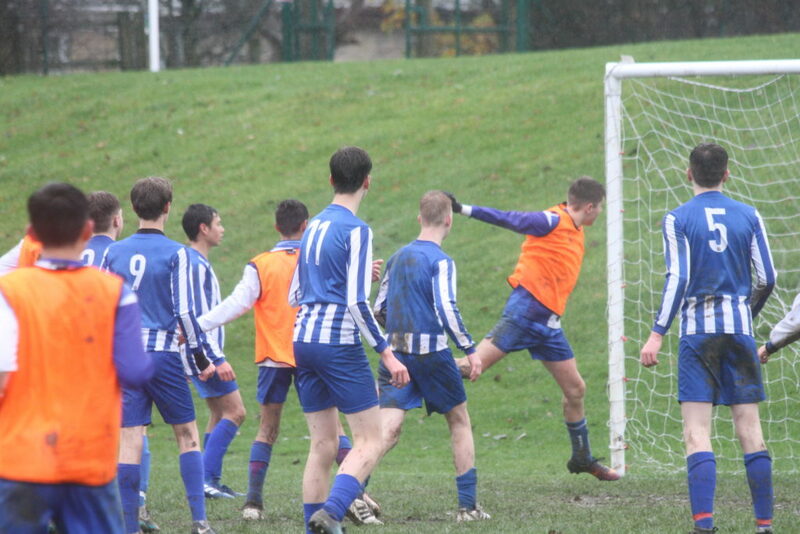 Pannal are by far the best team in the league, and had previously beaten us quite convincingly. 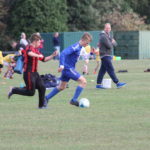 This time round we played much better, taking the game to the opposition, and the first two games saw us get a win and a draw. 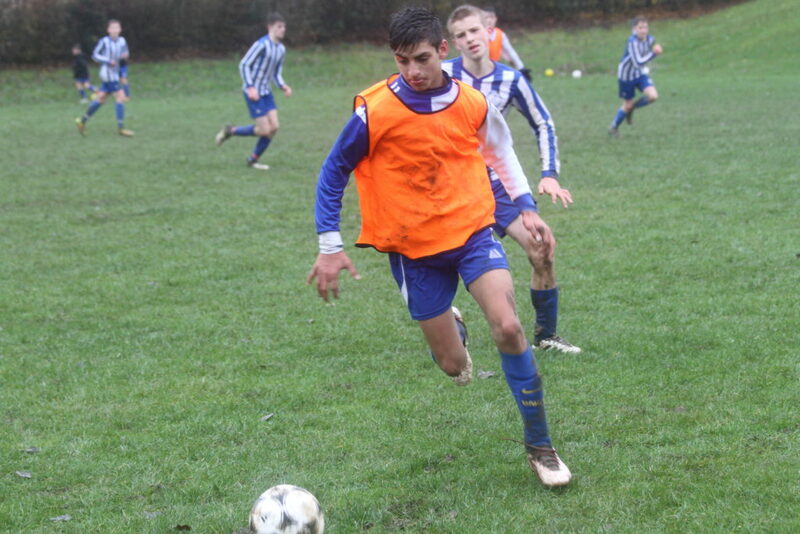 In the next two games we relaxed, Pannal stepped up their game, and we lost both games. After beating Ilkley away last week U13s Girls welcomed the same team to Grange Park for the return fixture. 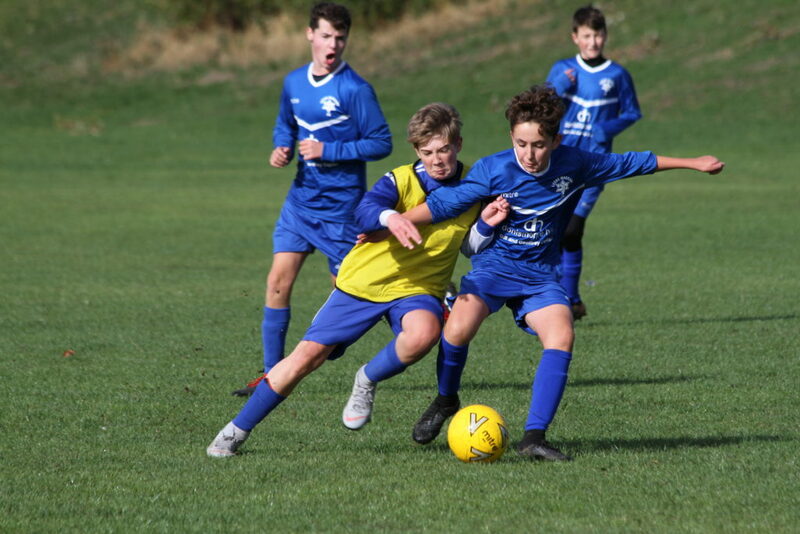 The first half was a closely contested encounter between two evenly matched teams, with Ilkley scoring the only goal to go into the break 1-0 up. 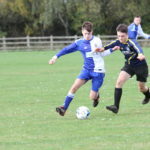 The second half saw the opposition gain the upper hand, running out 4-0 winners. Next game for the girls is a cup tie against... Ilkley. 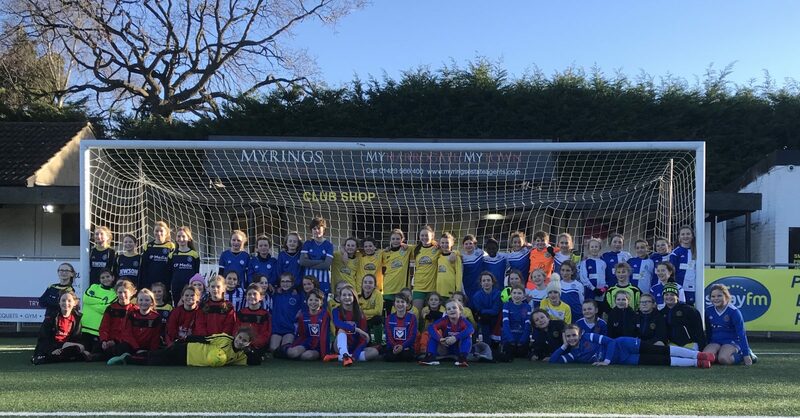 U14s Girls welcomed Crossley Belles from Halifax. Playing with a debutant goalkeeper we started confidently, but had to wait until the 15th minute before we opened the scoring. 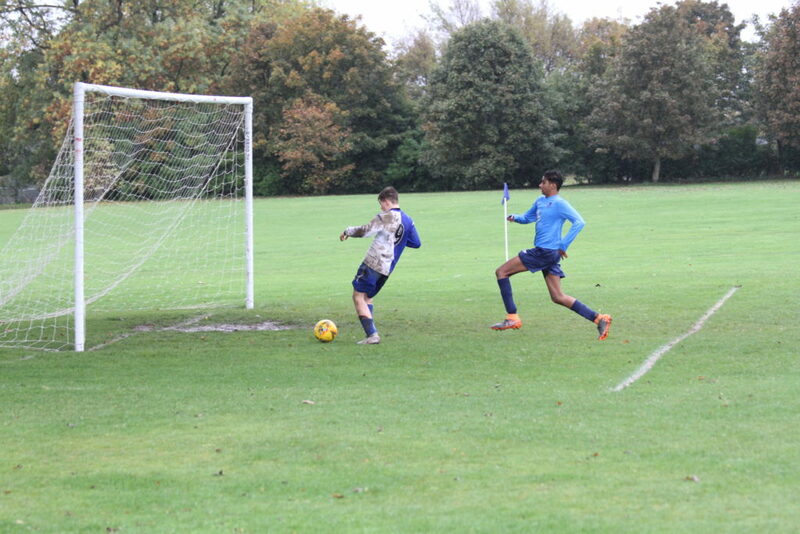 A second goal quickly followed, and a third gave us a 3-0 lead at half time. 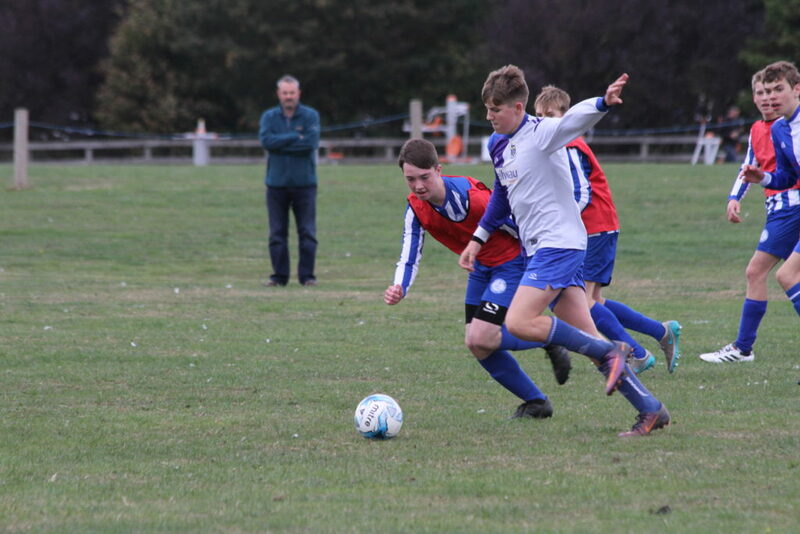 The second half was played in much the same vein, resulting in a 7-1 win and maintaining our position on top of the league. 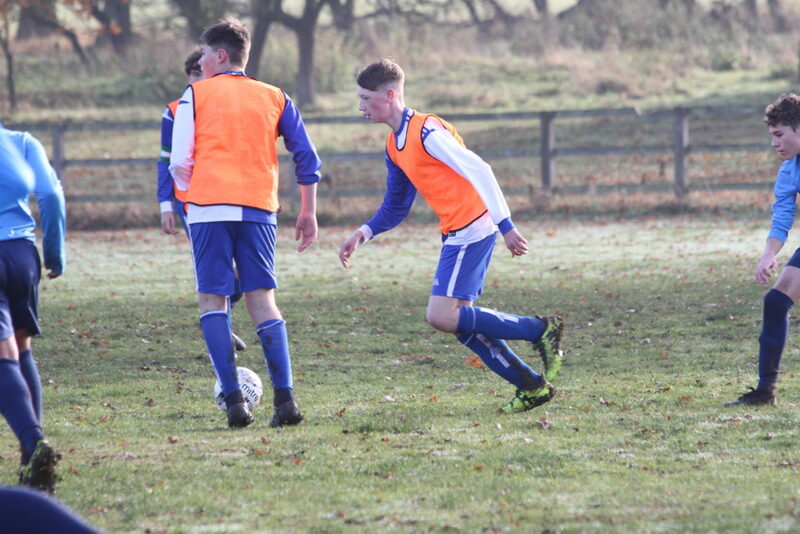 U15s travelled to Oulton, whom we previously beat 2-1. 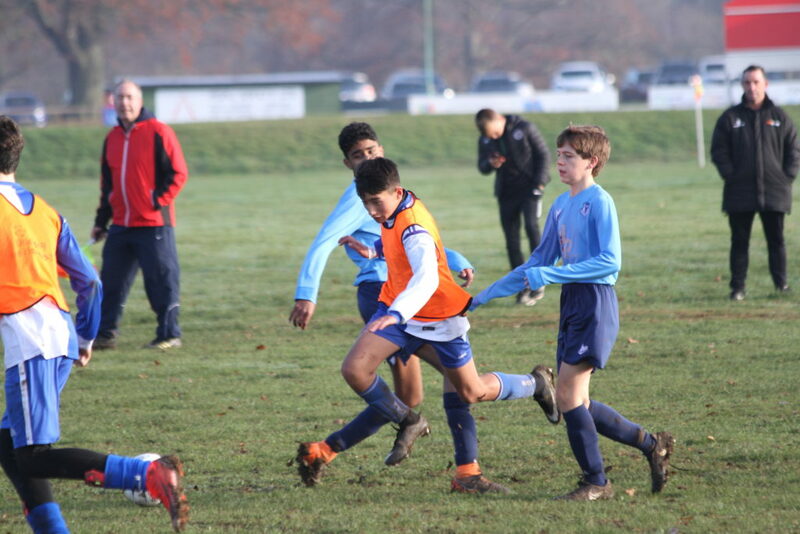 This time out however we played very poorly, and got thumped 8-0. 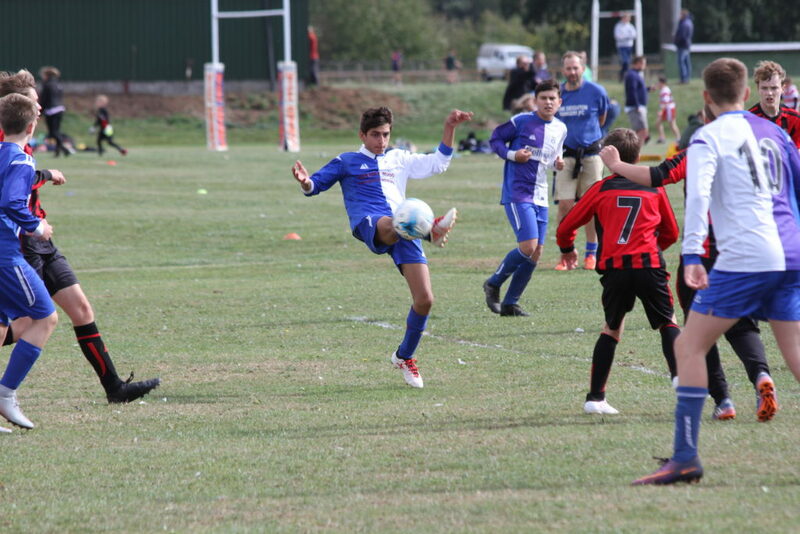 U7s were unlucky not to beat Pannal Ash. 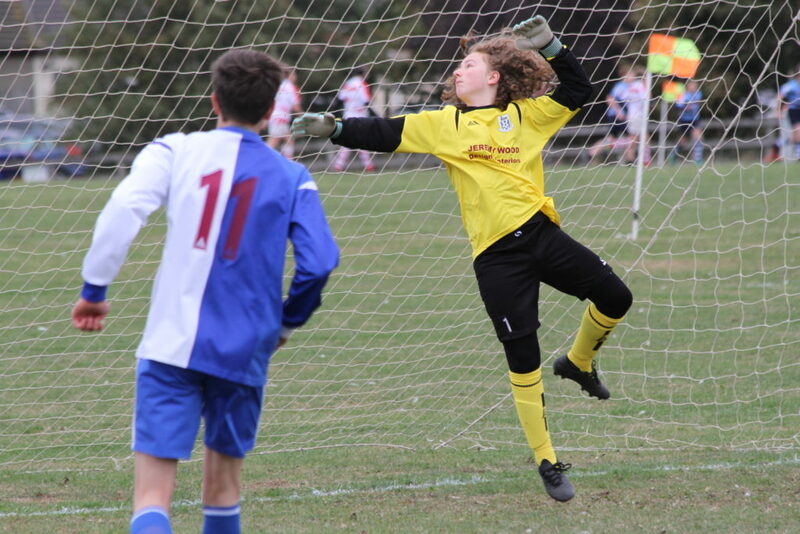 Despite playing well throughout the match, we missed a number of chances to score, the Pannal Ash keeper made some good saves, and our keeper was untroubled throughout, resulting in a goalless draw. 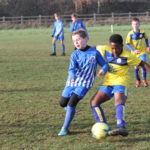 U9s played a local derby with Clifford at Grange Park. Getting off to a good start against one of the strongest teams in the league, we were matched one game all after two games. 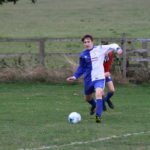 However, we failed to maintain our momentum, and lost the remaining two games to finish with a win and three defeats. 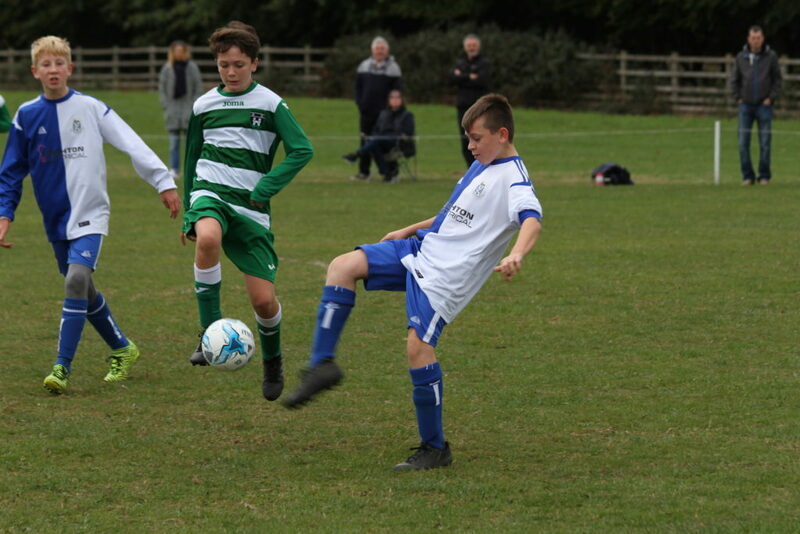 U11s overwhelmed Lawnswood in the Cup, winning all four games and scoring 22 goals without reply. We currently sit at the top of the group with the deciding match against Pannal Ash next weekend. 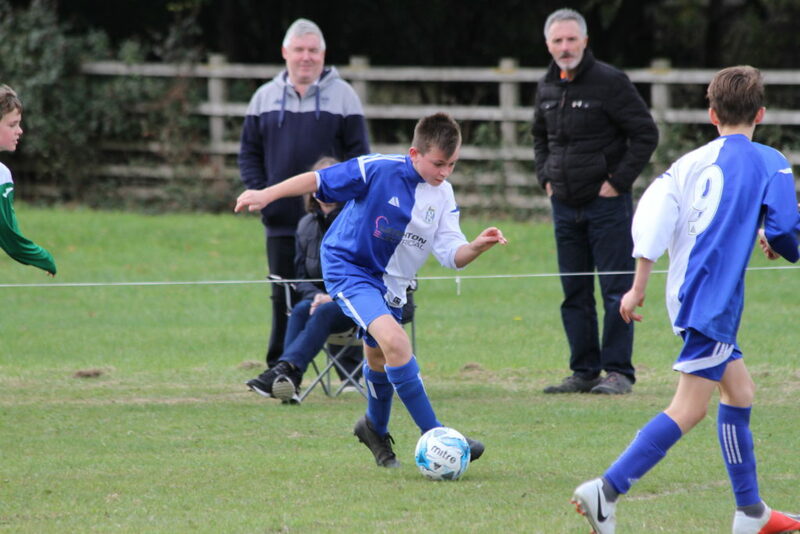 U12s were beaten 8-0 by Garforth Villa in the Barkston Ash Junior Cup. 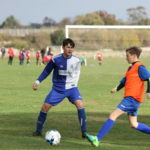 Our opponents were well-drilled, organised and clinical in front of goal, and although we started reasonably well and created a few chances we failed to trouble their keeper. 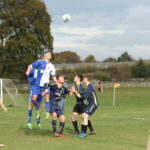 It was pleasing to see that despite the scoreline the boys kept playing right to the end. 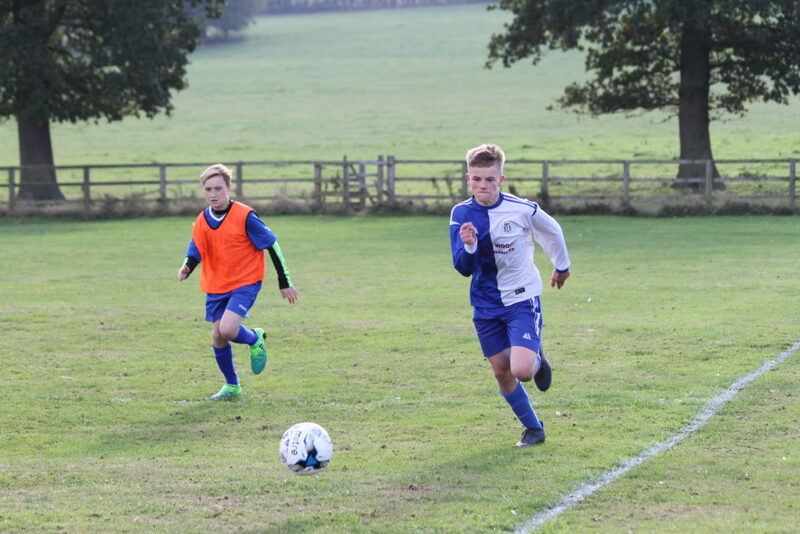 U14s trailed 1-0 at half time away at Ripon, having failed to convert any of our numerous chances. 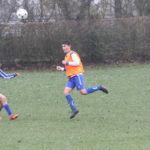 We were much better in the second half, scoring three good goals without reply to win the match 3-1. 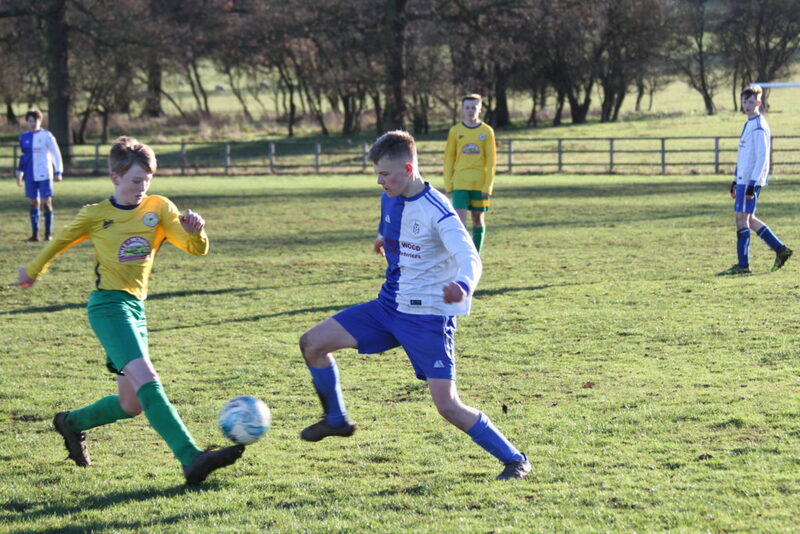 U15s cemented their position at the top of the division with a 6-2 home win over Wigton Moor. 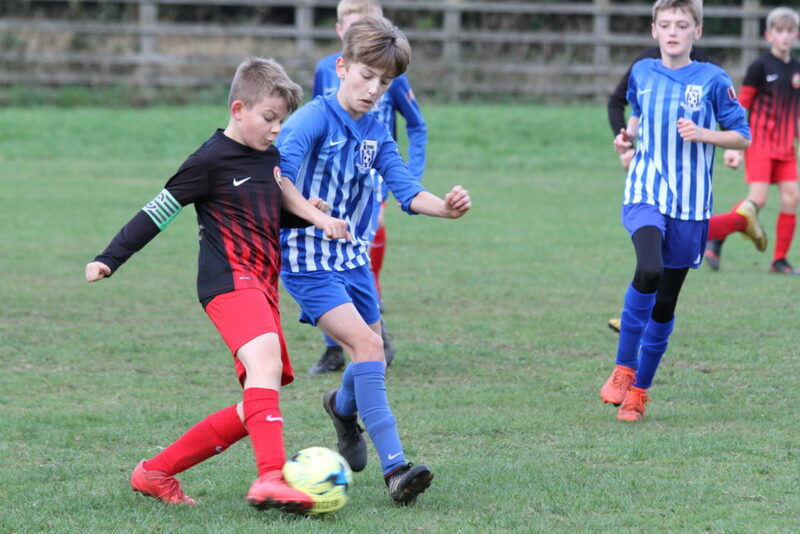 U10s faced Wetherby in the Cup at Grange Park, progressing into the next round after four physical games, with three wins and a single defeat. 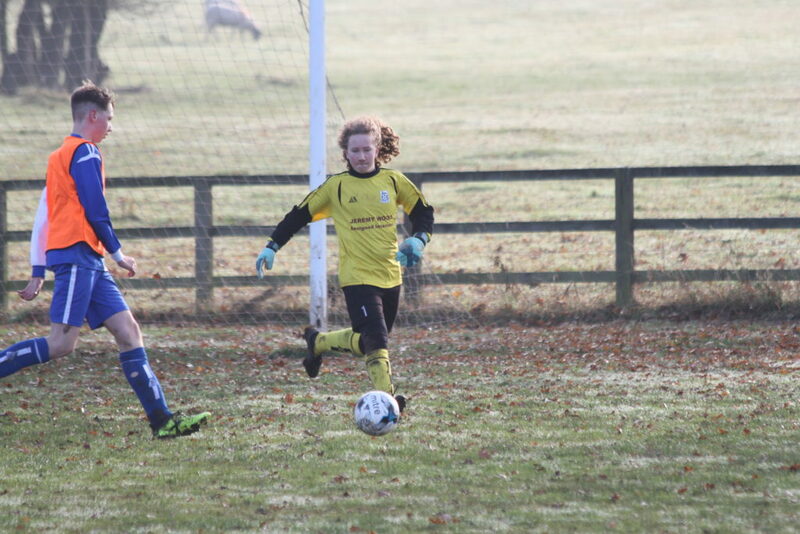 U11s Girls started well away at Beckwithshaw, taking an early lead with a well taken solo goal. 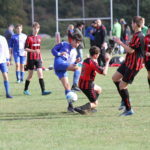 In a game between two evenly matched teams, we failed to build on our good start, conceding twice before half time, and finishing with a 5-2 defeat. 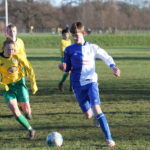 U14s Girls were away at last year's West Riding Girls League runaway champions, Brighouse Blues. 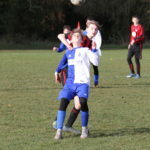 We started poorly against a very strong, tall, physical and skillful team, and were a little fortunate to be only 2-0 down at half time. 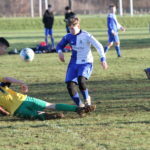 The second half saw a transformed team disrupting Brighouse's rhythm and creating chances. We scored from a corner with 20 minutes remaining, after which the game ebbed and flowed, and we looked the most likely team to score. A goal finally came with 3 minutes left on the clock; unfortunately it went into our net. 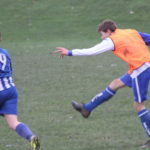 Final score 3-1 to Brighouse. 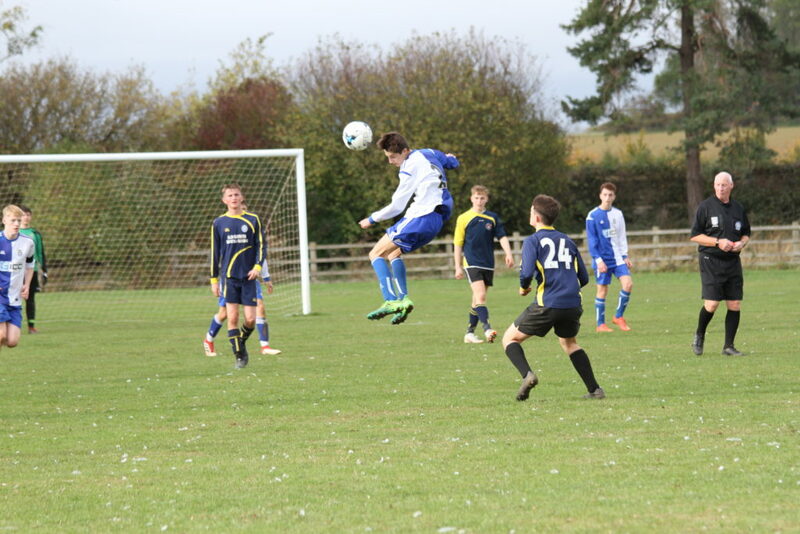 U15s were at home to freely-scoring North Duffield. A bright start for us saw the game goalless at 20 minutes, but then the floodgates opened and we went in to the break 7-0 behind. 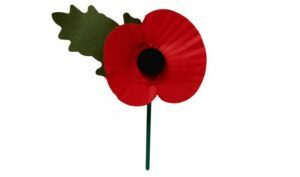 Despite that the boys didn't surrender abjectly, and everyone tried hard. 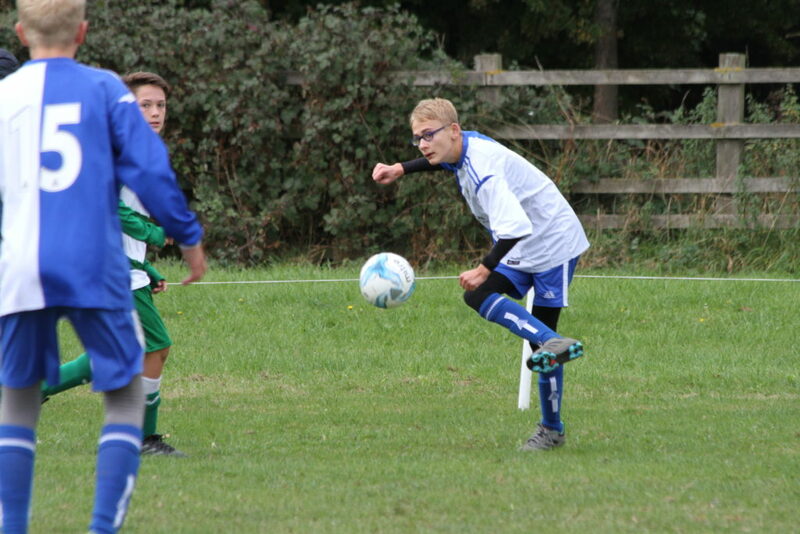 Final score 12-0 to North Duffield, a team that really should be in a higher division. 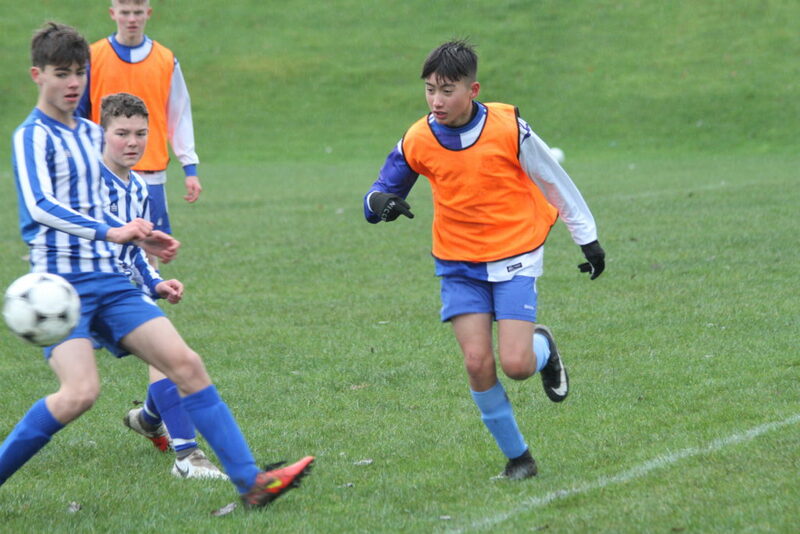 Two of our teams made the trip to Ilkley, and both came from behind to win their games. Despite having the better of the first half U13s Girls trailed 1-0 at half time. 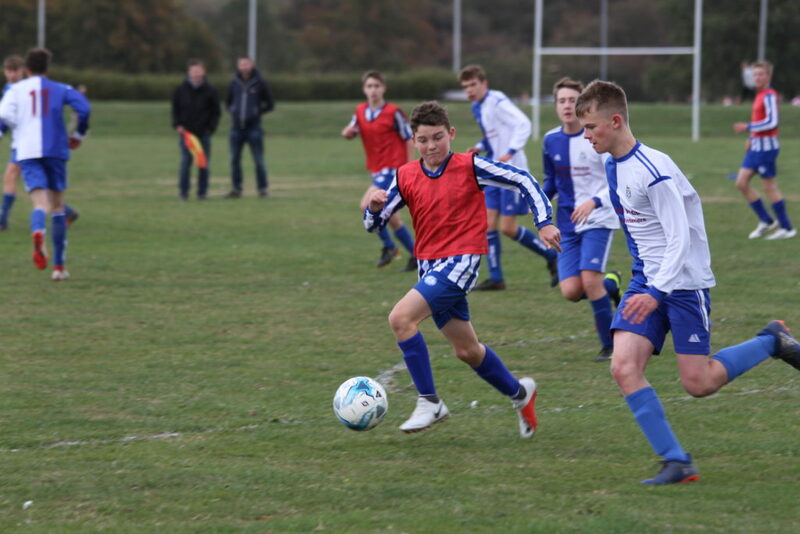 After we equalised early in the second half both teams then had chances to add to the score, but there was just one more goal in the match, in our favour, to see us come home with a 2-1 win. 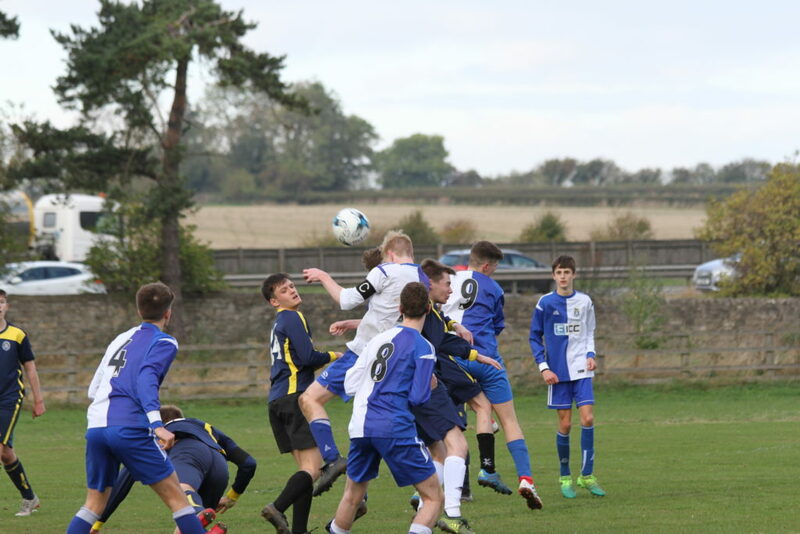 U16s started well and dominated the first half, but were only able to find the back of the net once. 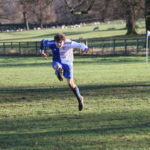 Ilkley changed formation in the second half, and promptly scored three goals in 15 minutes. 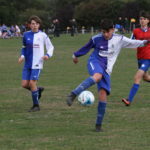 Our boys responded by forcing home two scrambled efforts, and just as the game looked to be heading for a draw, we broke away and got a winner. Final score 4-3. 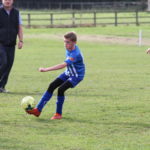 U9s performance was a massive improvement on their last match, recording 3 wins and a draw against league debutants Bedale. 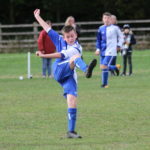 U10s cup tie at Wigton Moor saw both teams playing good football, but we prevailed and came home with 3 wins and a defeat. 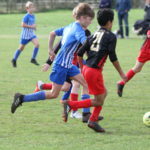 U11s played their first game in the newly revamped Cup competition against an amalgamated Pannal Ash Red and Blue team. 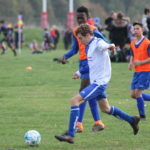 Under the new format there are three groups with only the group winner and best runner up progressing to the semi finals. 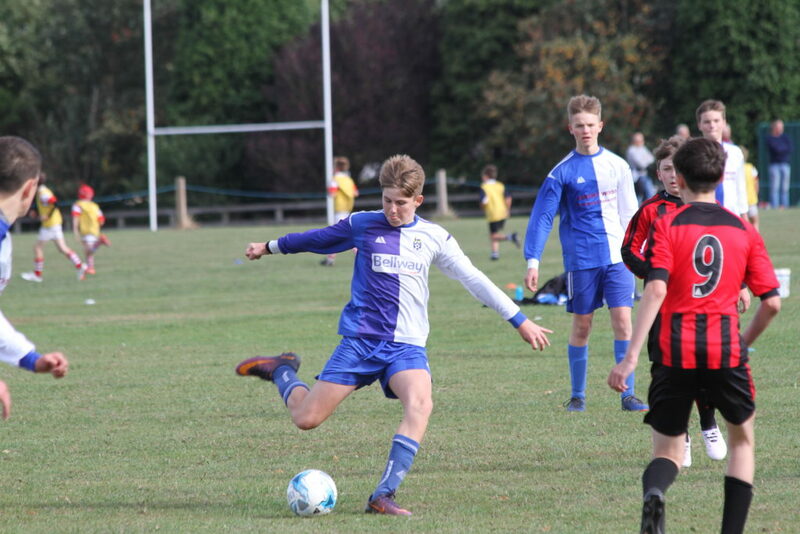 In a closely fought contest all four games were drawn, meaning that next week's clash with Lawnswood is a must-win, must score a hatful match. 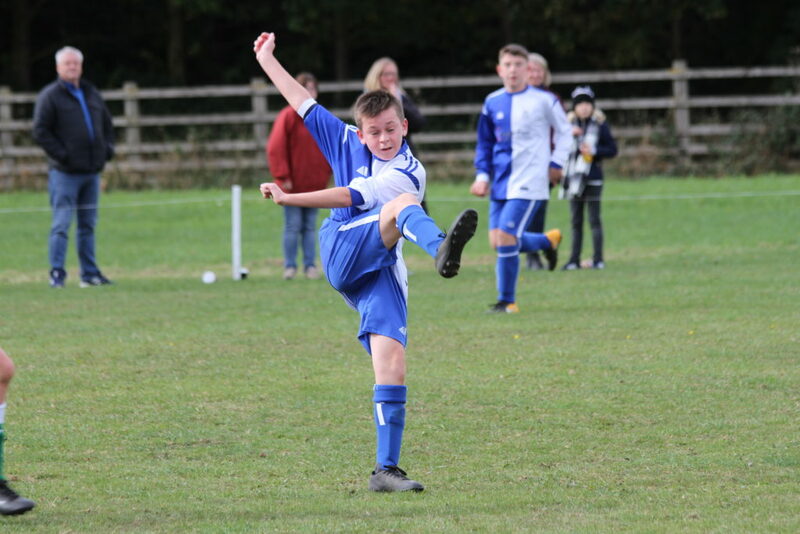 U12s put last week's cup defeat firmly behind them, getting off to a flying start with a first minute goal aginst Knaresborough Celtic, and romping to a 9-1 win. A great result to maintain our unbeaten position at the top of the league. 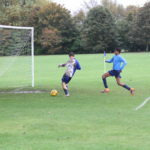 U14s beat Lawnswood 8-0, with some fantastic goals and a hat trick for our regular goalkeeper, playing out of his normal position. 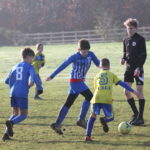 U8s played Killinghall Nomads and came away with a good win, two goalless draws and a narrow defeat to a single goal. 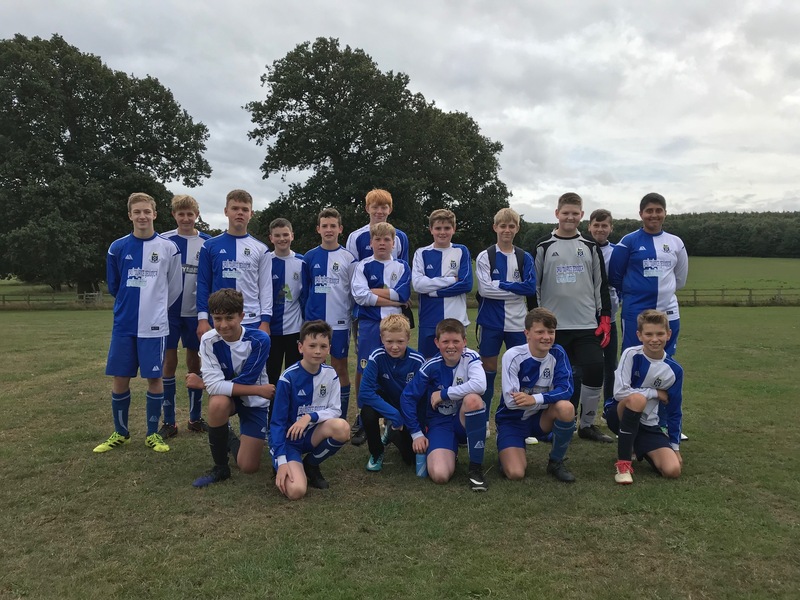 U14s played a friendly against Pannal Ash. 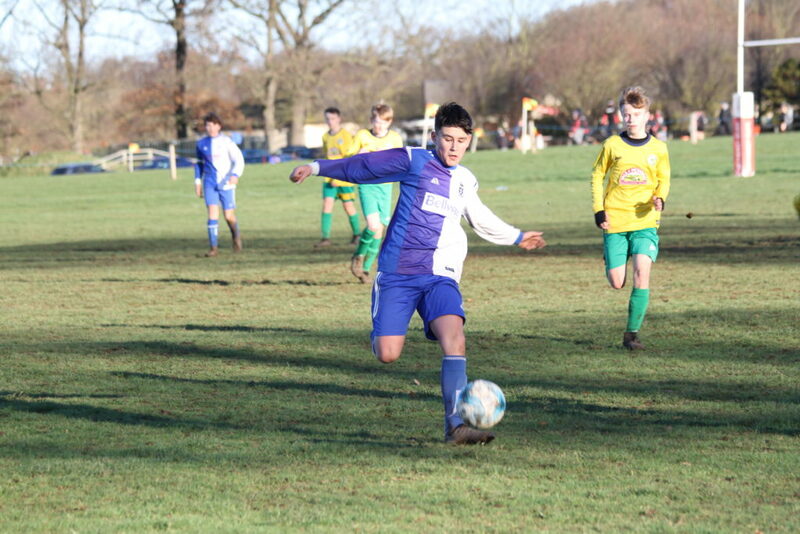 We took a 4-0 lead, then went down to 9 players due to injuries, allowing Pannal Ash to come back and win 5-4. 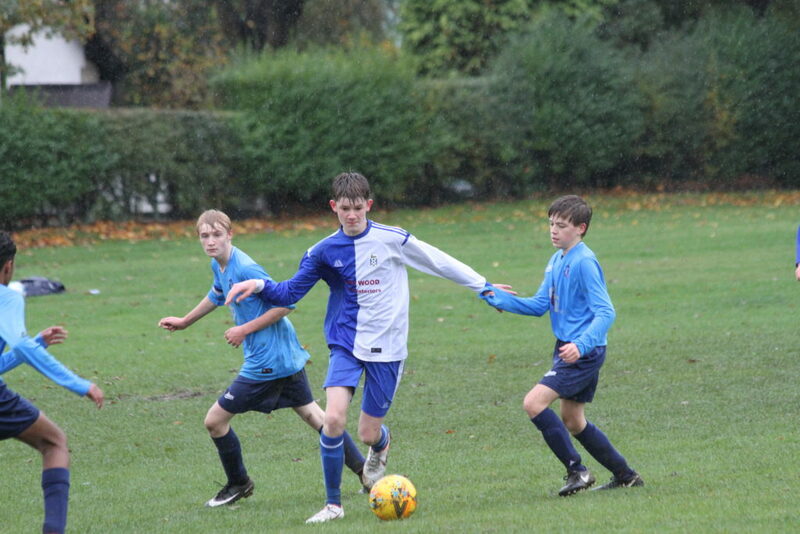 U15s faced Methley at Grange Park. 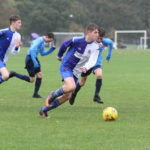 Having lost 8-0 in the away away fixture last weekend, it was pleasing to see the boys respond with a much better performance in a 5-3 defeat. 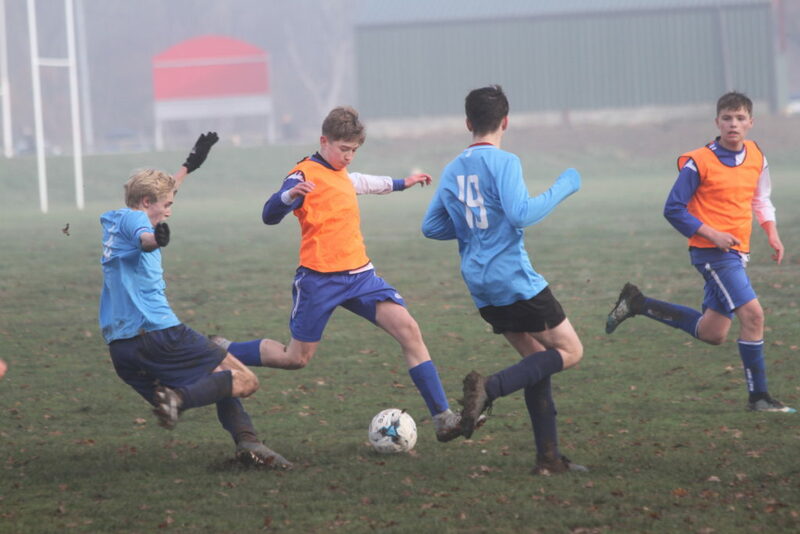 U16s lost 4-1 away at Nidd. After having the better of a goalless first half we conceded three in 10 minutes, then lost one of our central defenders to injury, and having no subs available we played the final 20 minutes a man short. 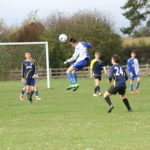 However, the boys kept going and were rewarded with a deserved goal. 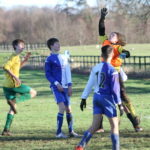 U14s Girls travelled to Wigton Moor for a League Cup tie. 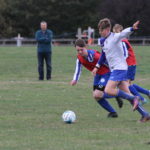 The Grange Park wind helped us in a 7-1 win against the same opposition last month, but we expected a sterner test this time around, and so it proved. 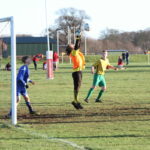 In a cracking cup tie we were grateful to our goalkeeper for two fine first half saves to keep the scores level at the break. 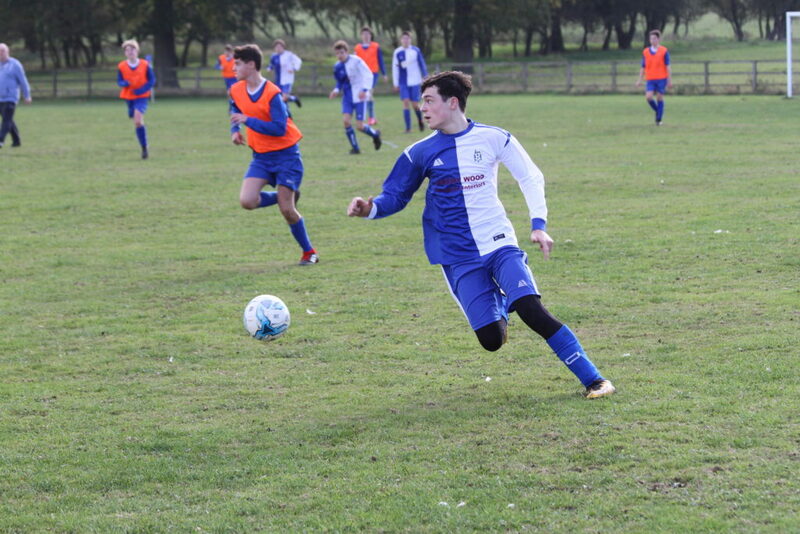 We changed our style of play after the interval, swinging the momentum in our favour, only to see Wigton go ahead. 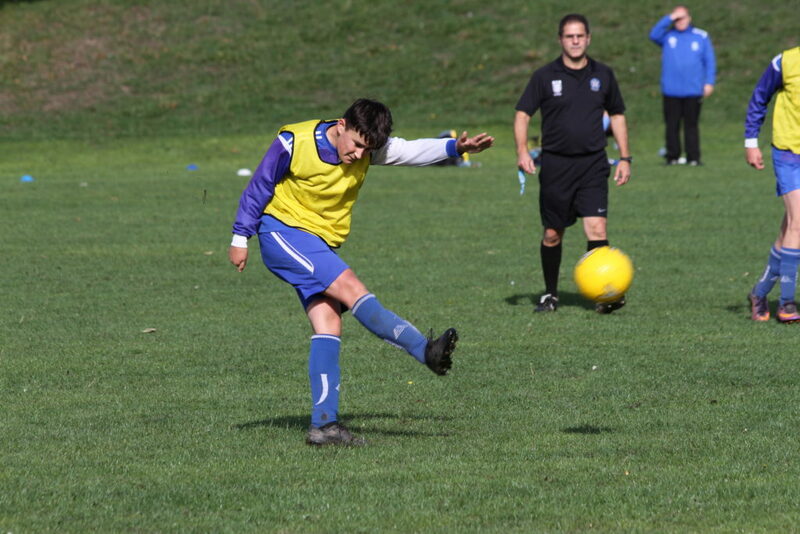 The girls responded strongly, hitting the post before a great passing move saw us equalise with 15 minutes remaining. 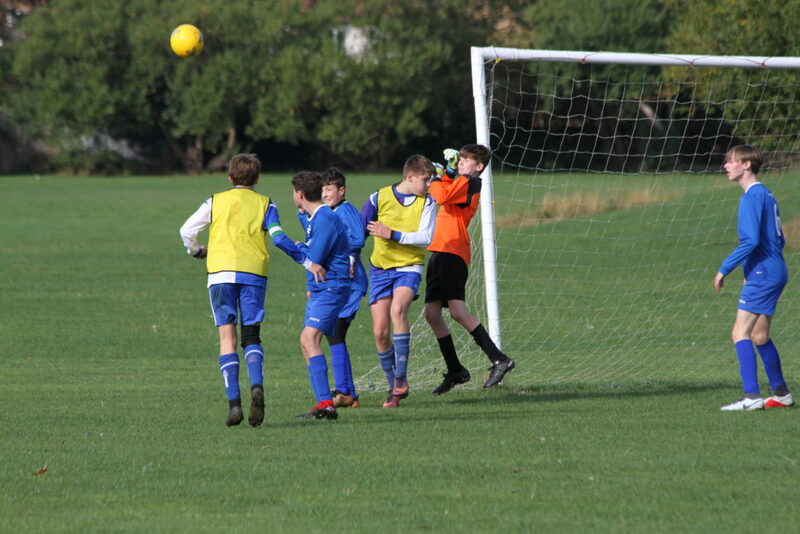 Despite the best efforts of both teams the game finished in a 1-1 draw, and so to penalties. We won the shoot out 4-3. 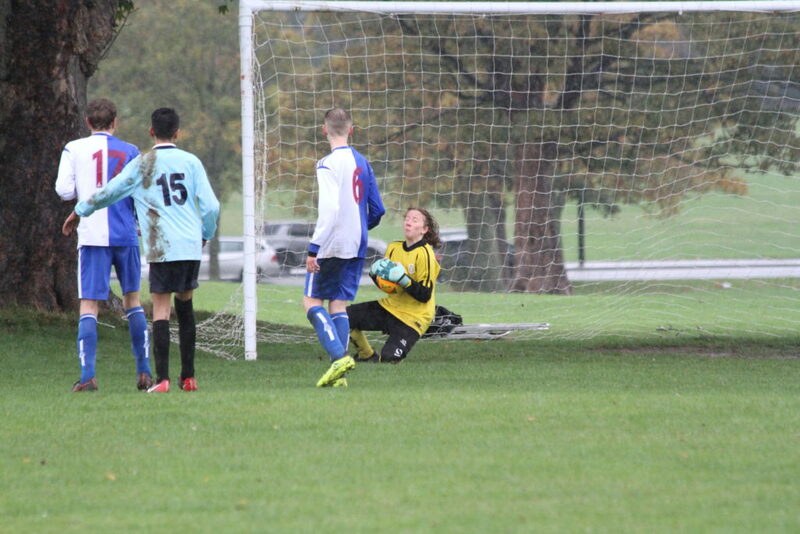 Four excellent penalties hit right in the corner, and two saves from our goalkeeper gave us the vistory. 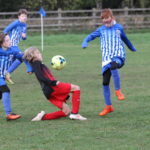 U7s got a creditable draw against a strong Pannal Ash Reds side. 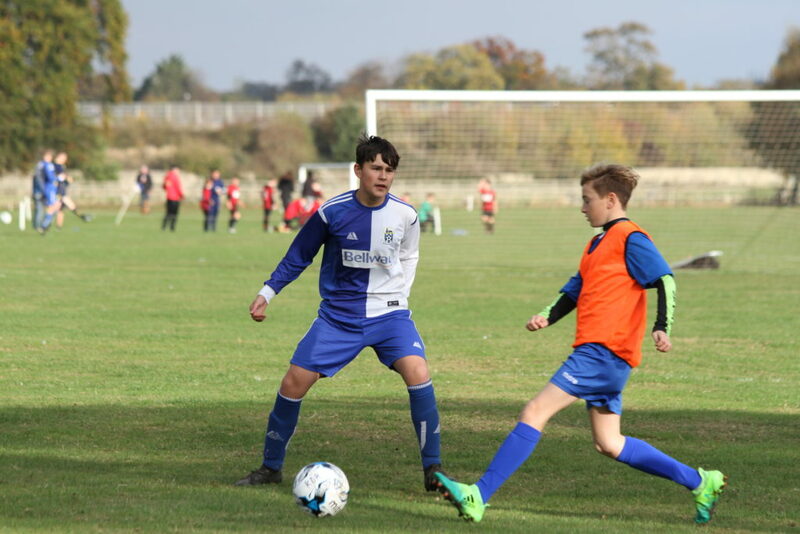 After leading at half time we conceded a couple of sloppy goals, but battled hard and forced a draw with a goal of the season contender from near the halfway line. 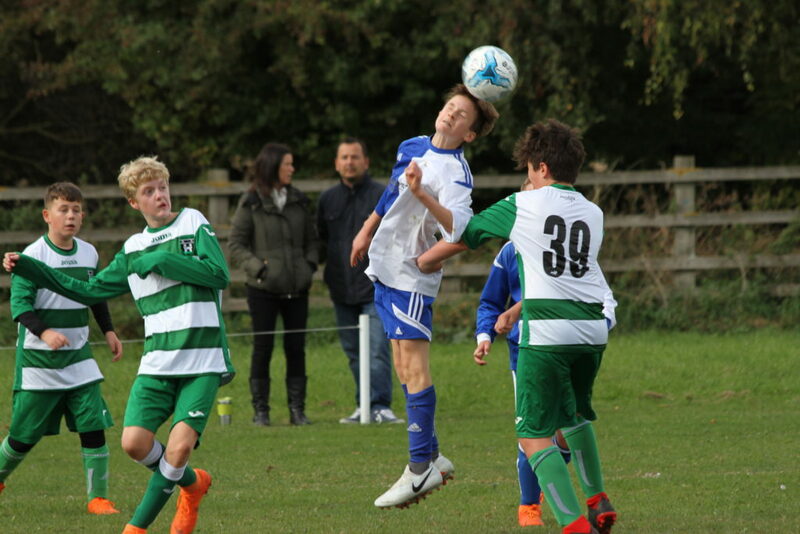 U12s and U14s were both in 2nd round County Cup action. 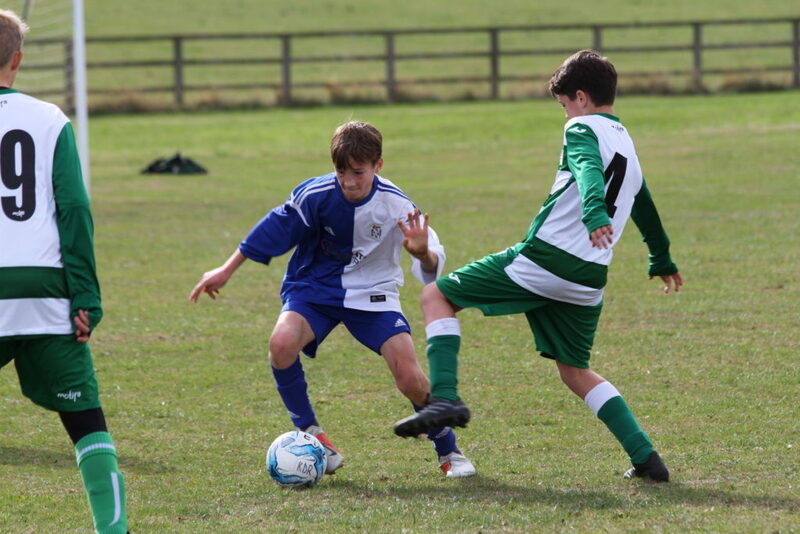 U12s never got going against a physically stronger Birstall Rovers side, and went down 10-1. 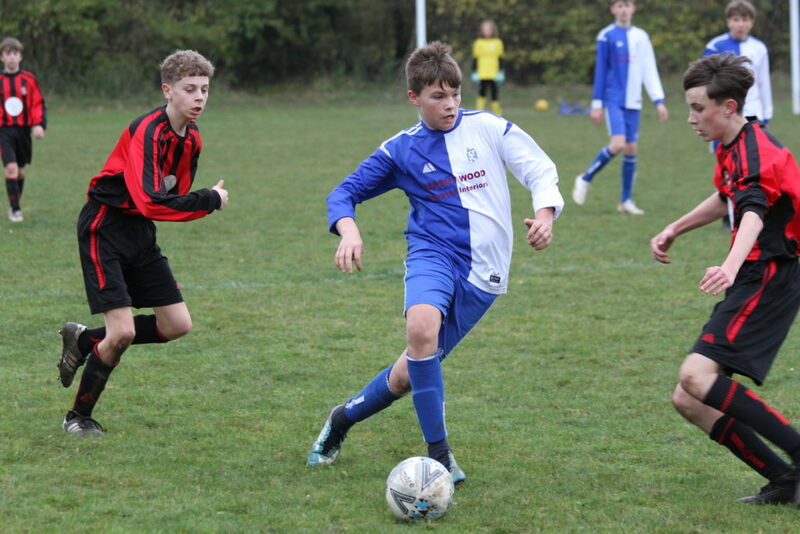 U14s progress to the 3rd round after a deserved 2-1 win away at Thorne. 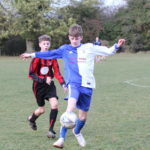 U15s played away at Ripon and came away 3-2 victors in an entertaining match to cement their place at the top of the league. 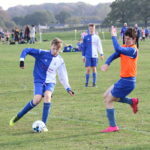 U14s Girls won 4-2 in a friendly match away at Garforth Rangers. The game was played in a great spirit (four of our girls taking turns to make up the numbers for our opponents), with some good football on display. 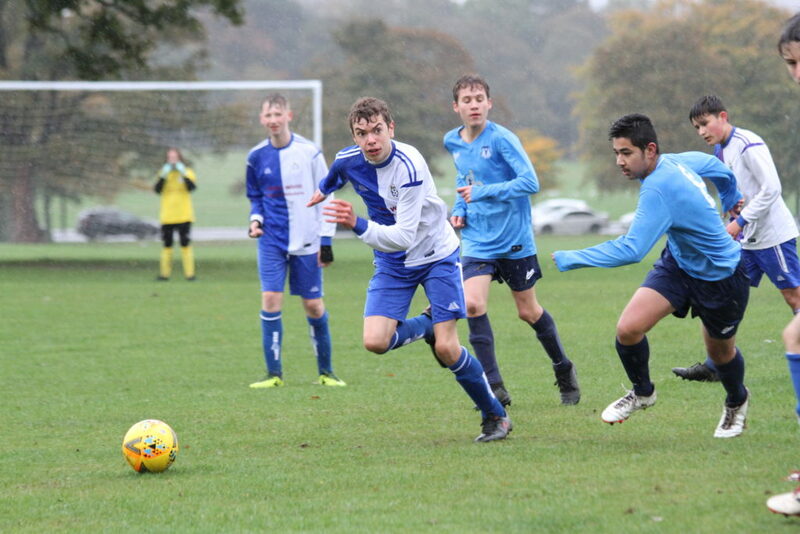 On a day of driving winds and sleet (otherwise known as Grange Park summer) our teams that played conquered both the weather and their opponents. 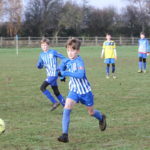 U11s travelled to Lawnswood and won 4 out of 4, scoring 23 goals without reply. 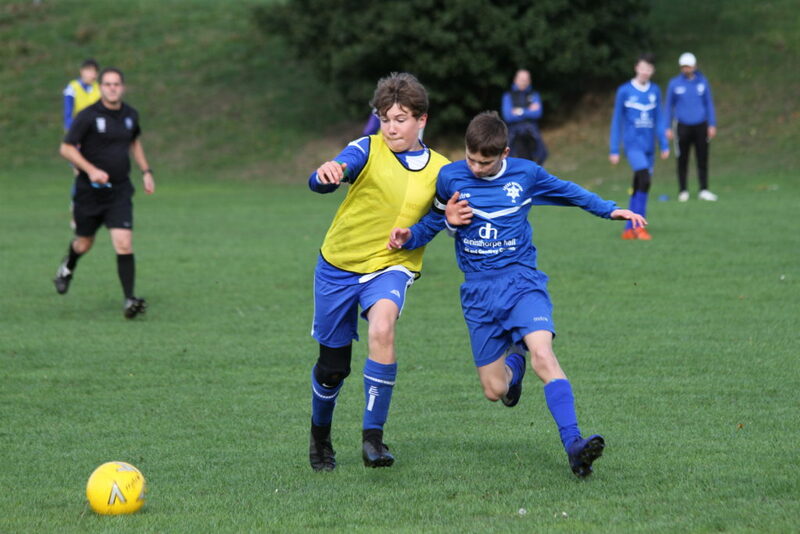 U13s Girls played a friendly at Grange Park against Whitkirk Valley. Missing our regular defenders and playing with a debutant goalkeeper, we went behind but fought back to lead 3-1 at half time. Kicking into the wind in the second half we led 4-3 with 10 minutes left, before scoring a fifth goal to put the game beyond reach. 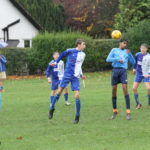 U16s beat Beckwithshaw away 8-5. 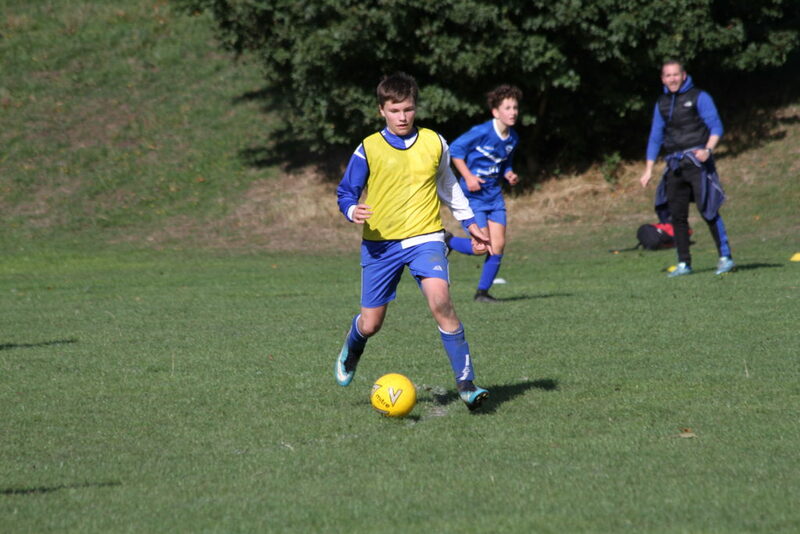 A good performance in a game that had defensive errors, a first time goalscorer and missed penalties. 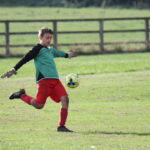 U7s succumbed to their first defeat of the season, losing to a single goal. 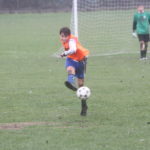 It was pretty much our opponents' only shot of the game, and their goalkeeper had an excellent match to deny us a goal. 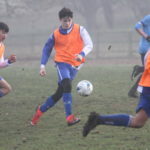 On the plus side our general play and passing was excellent, winning praise from the visiting coaches. 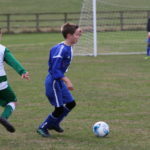 U9s produced a real Jekyll and Hyde display against Beckwithshaw at Rossett, one of our teams having a nightmare in defence, the other scoring goals for fun. Two wins, two defeats, 11 goals scored, 11 conceded. 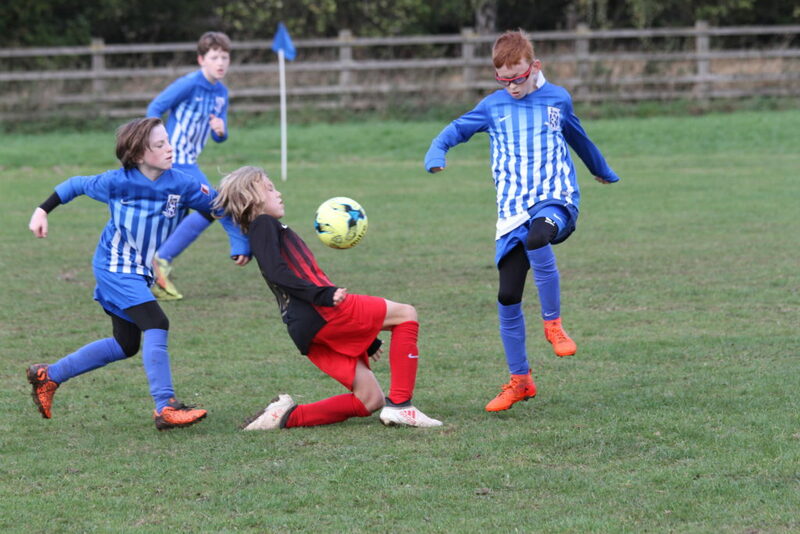 U10s also had a bad day against Pannal Sports. 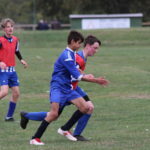 Missing a few key players due to rugby commitments, we were given a footballing lesson by the best team (by far) we have faced this season. Four defeats, and not a single goal scored. 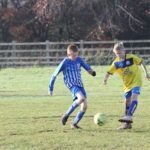 U11s played Clifford at home, winning 3 and losing 1. 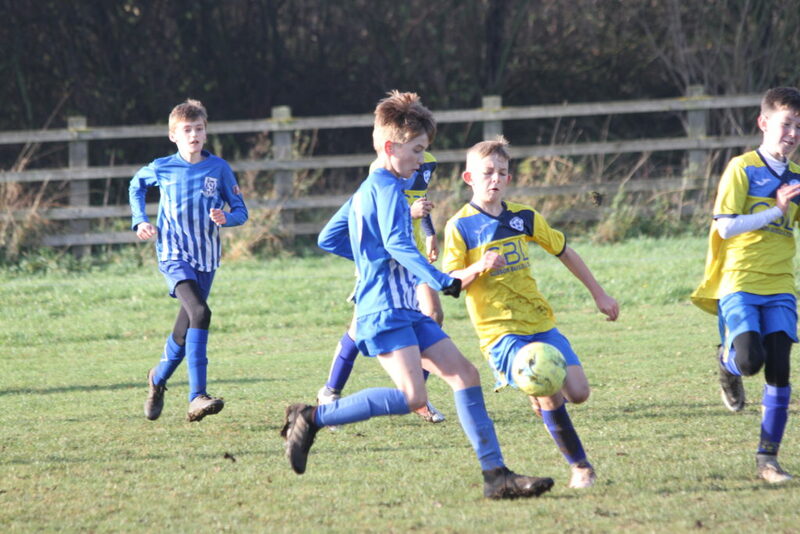 U12s were due to play Tadcaster Albion in the Barkston Ash Cup, but our opponents withdrew from the competition in mid-week, giving us a bye into the Quarter Finals. 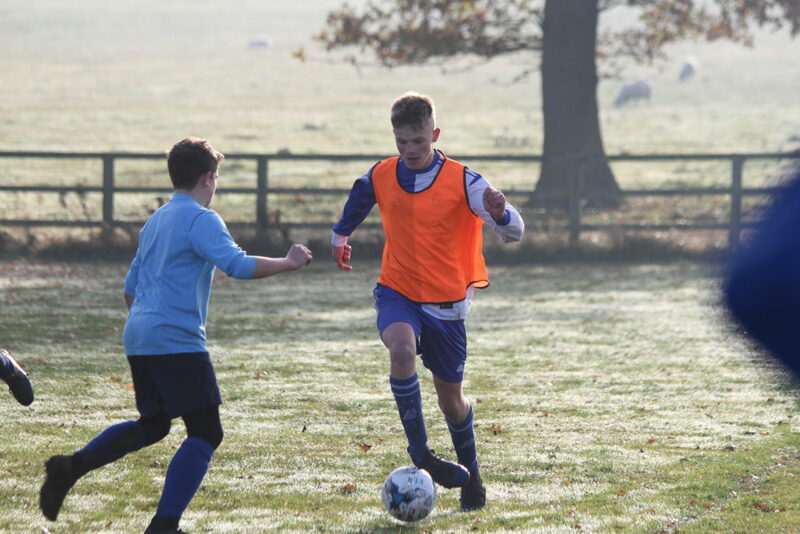 At short notice we managed to organise a friendly match against Collingham. 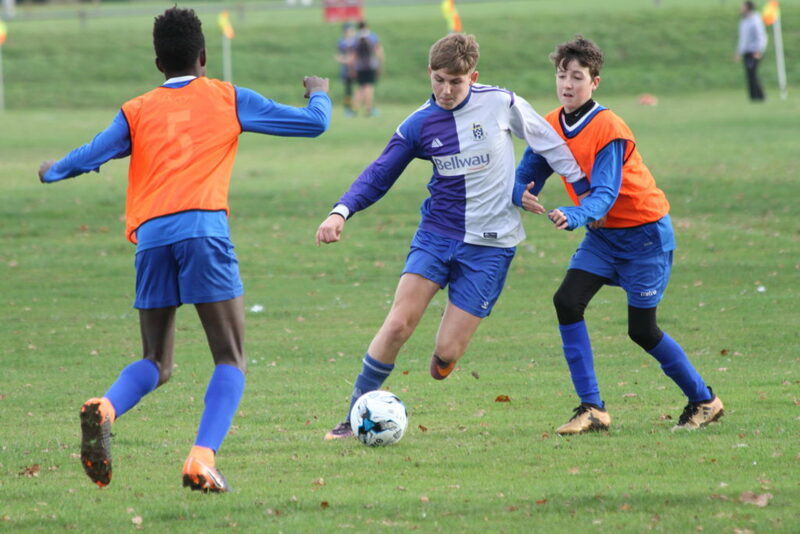 Two very different styles of football were on show - our passing game on the ground contrasting with Collingham's very direct style, hitting long balls over the heads of our players and running with pace at our defence. 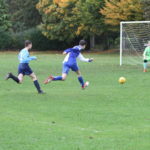 Although we hit the woodwork twice and created some good opportunities in front of goal we lost 4-2. 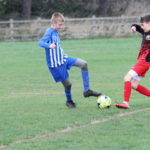 U14s lost an excellent Barkston Ash Cup tie 6-1 to Garforth A League side Barwick and Scholes. Playing without two key defenders, and losing our main striker to injury after 10 minutes, the boys showed drive, discipline and positivity. The final scoreline doesn't really do our performance justice. 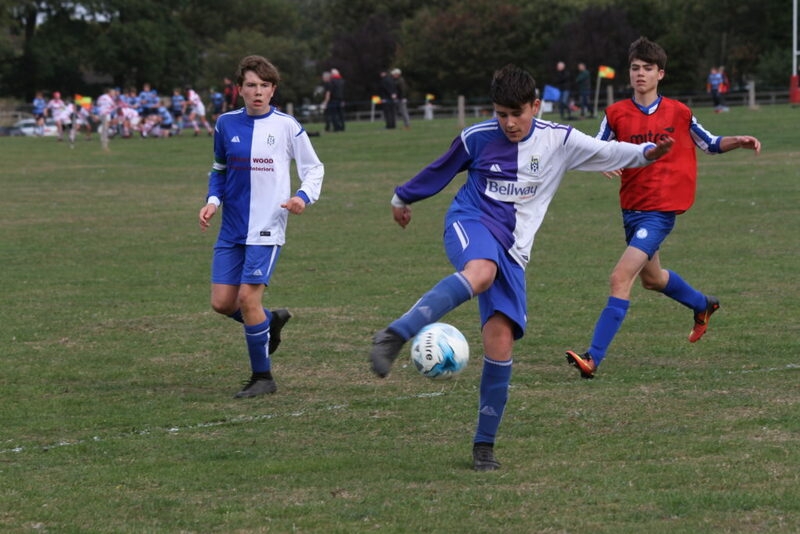 U15s produced a fine team display at Grange Park to avenge last month's defeat against Leeds Maccabi. 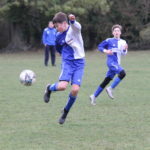 We won 5-0 to go top of the table. 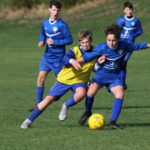 U17s got back to winning ways with a 4-2 win over Ilkley Town. A decent performance, spoilt only by the soft penalty we conceded. 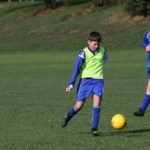 U11s Girls faced Pannal Ash at Grange Park. 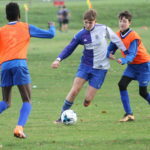 Playing 7 girls against the opposition's 8 for 2/3 of the game, we played good football and took our chances well, running out 7-1 winners, thanks mainly to the quality of our finishing. 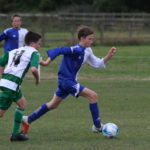 U14s lost 4-1 in a friendly match against North East Leeds. 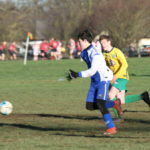 The game was a chance for fringe players and those that don't play in the league team to get a run out, and we saw a nimber of pleasing performances. 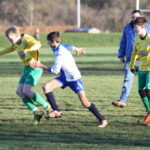 U14s Girls travelled to bottom club Battyeford Belles and went behind after just 2 minutes. 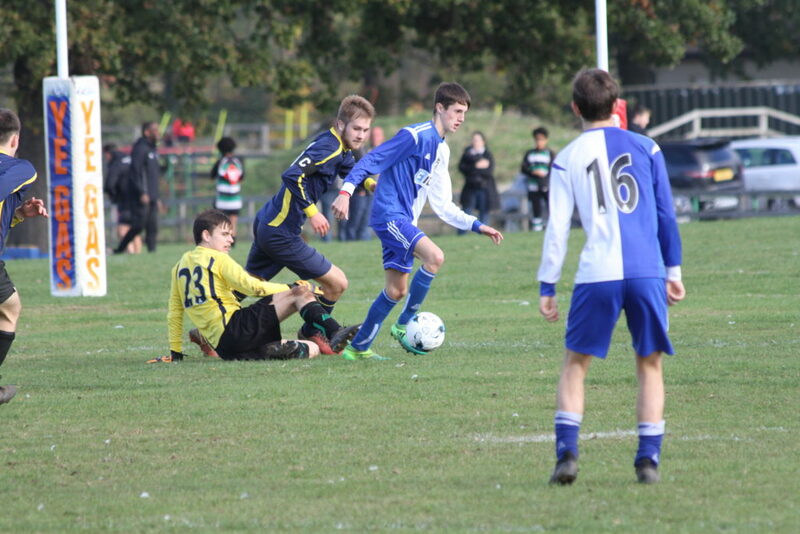 We didn't get going as a team until the 25th minute, when we equalised directly from a corner. 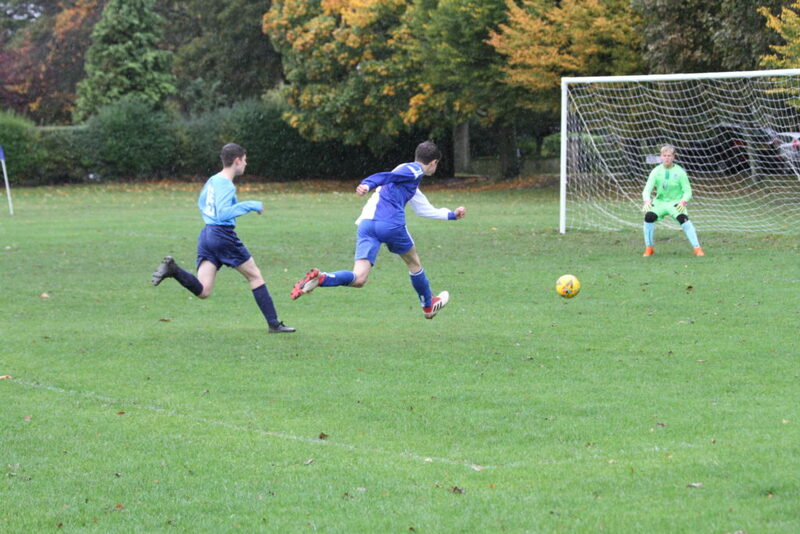 Two minutes later the same player scored from a fantastic strike 25 yards from goal. 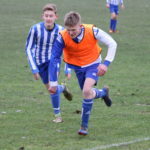 Another great goal, a half volley from way outside the penalty area that looped over the Battyeford keeper, gave us a 3-1 lead at half time - a flattering scoreline as the game had been very even up to that point. Within 30 seconds of the restart we got our fourth, and a well worked goal later in an otherwise uneventful half made it 5-1. The win takes us to the top of the table. 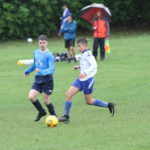 Storm Callum was the player of the day today, with heavy rain affecting most of our games. 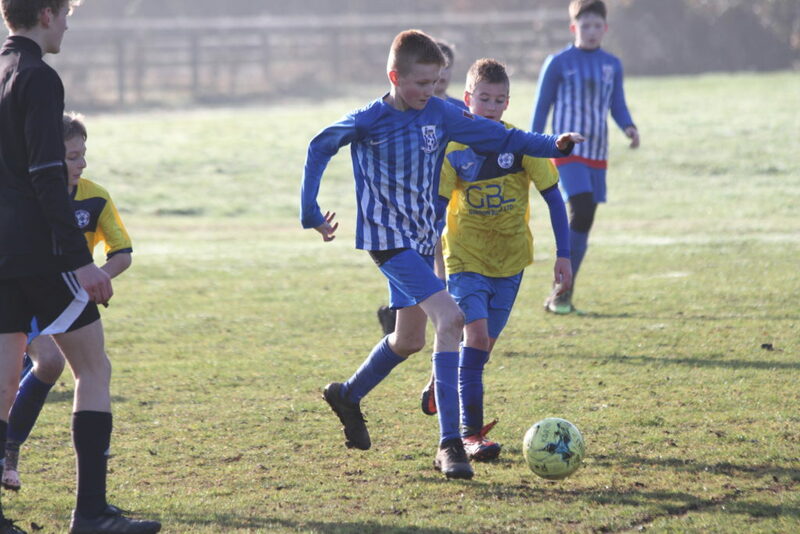 U8s had a tough morning against Beckwithshaw, losing all 4 games. 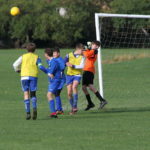 Both of our goalkeepers sustained injuries, and once Grange Park's horizontal rain started to fall our boys lost heart. 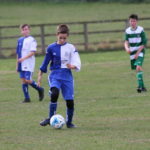 U11s also played against Beckwithshaw. 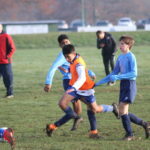 Despite being without all of our regular defenders due to a rugby tournament, the boys showed their versatility and battered the opposition, recording 4 wins out of 4. 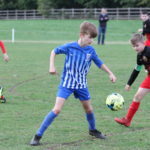 U13s were away at Pannal Sports. 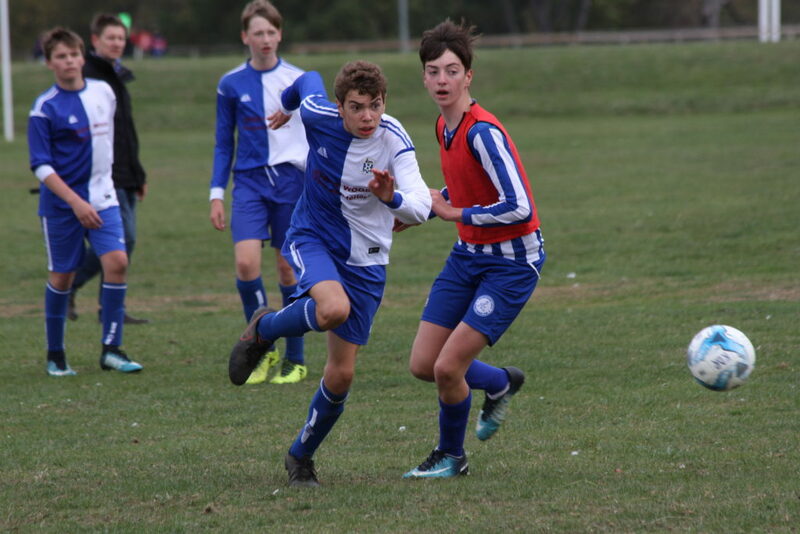 The boys worked really hard in the first half to take a 3-0 lead into the break. 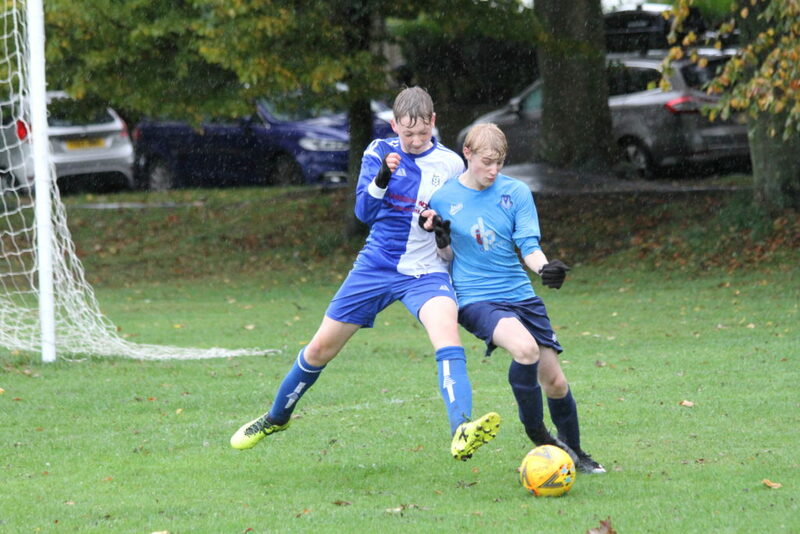 The rain and heavy pitch took its toll on our players in the second half. 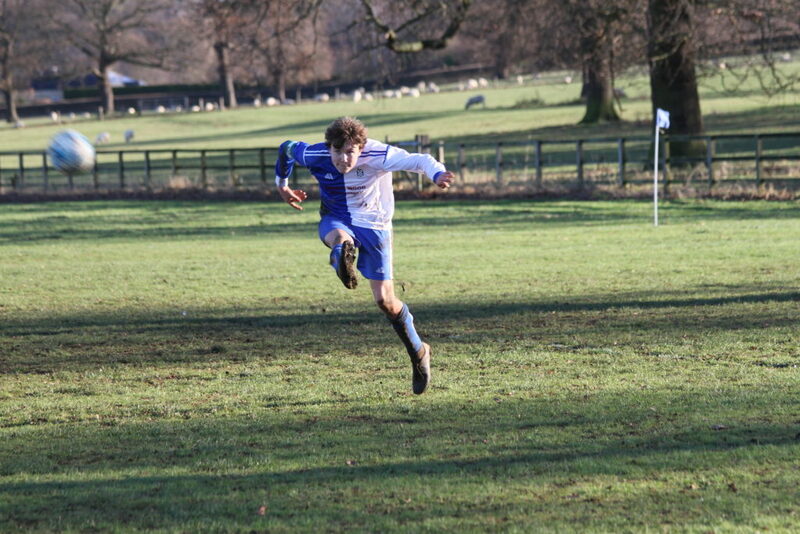 Pannal pulled goals back but we managed to keep our noses in front. Final score a 7-5 win. 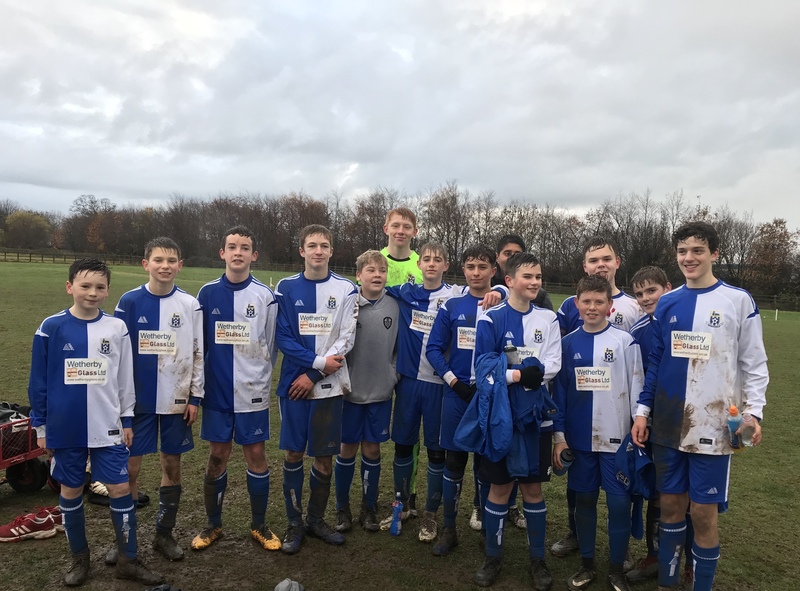 U14s played away at our bogey team, Ilkley Town, and turned the tables to beat them 10-2. 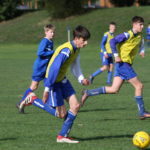 We are playing good quality, committed football this season, maintaining our shape throughout the game and have 11 different players on the scoresheet so far. 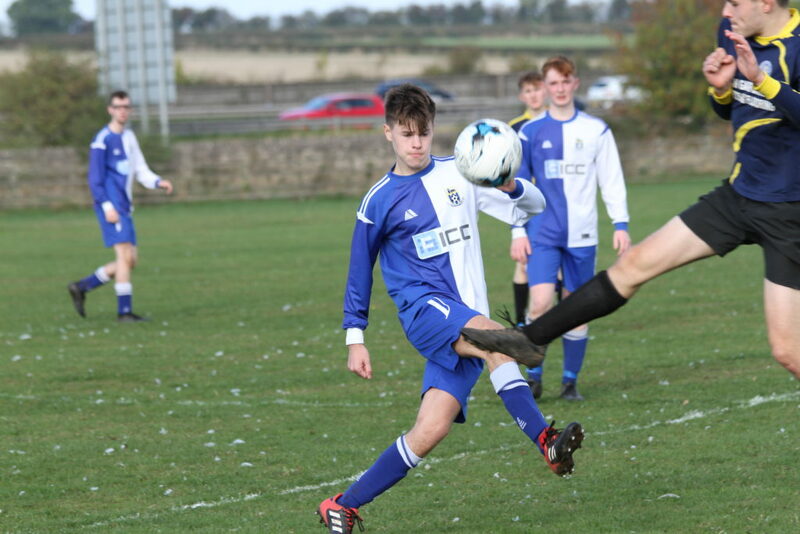 Wigton Weekend continued today, with three more of our teams in action against Wigton Moor. 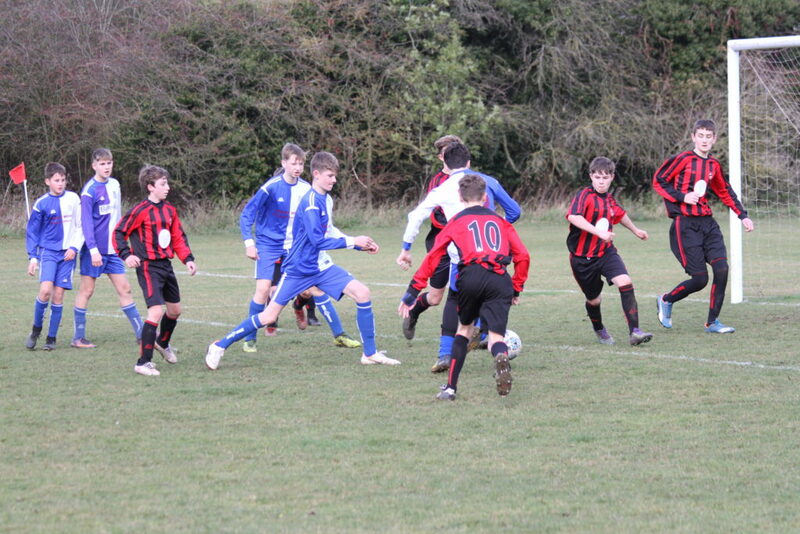 U12s began on the front foot and controlled the play. 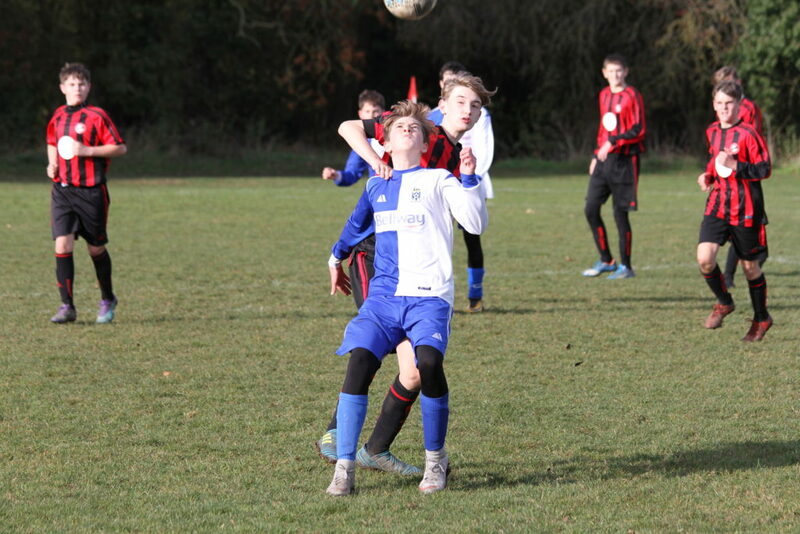 Despite being exposed a few times on the counter attack our dominance showed and by half time we were 6-0 up. 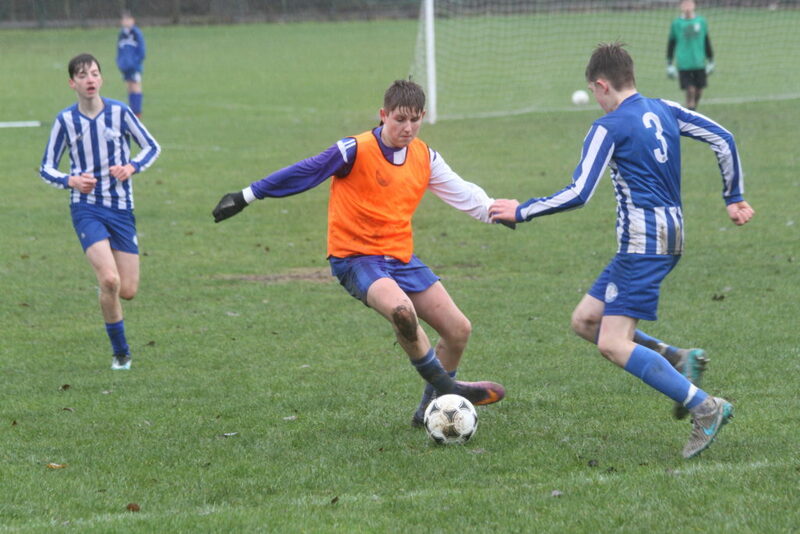 In the second half the pitch started to cut up making playing conditions difficult for both sides. 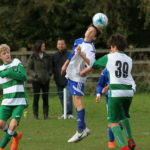 We netted 3 more goals and conceded the same number, making the final score 9-3. 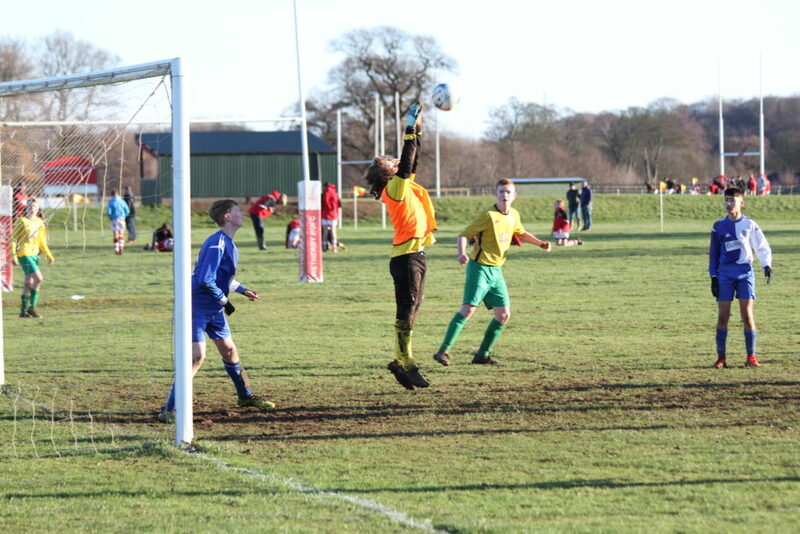 Our tally could have been higher were it not for Wigton's goalkeeper, who had a great game. 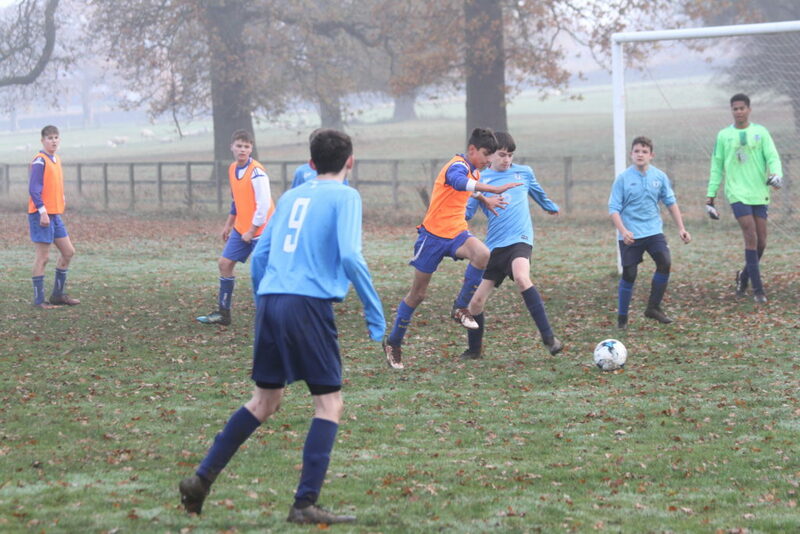 U15s played away on a very wet Soldiers (or should it have been Sailors?) Field. 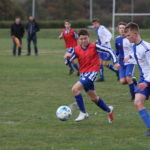 A good solid team performance resulted in a 4-2 win, though had we converted our numerous chances we could have reached double figures. 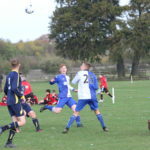 Playing at Grange Park U17s conceded within minutes, a sloppy goal from a set piece, as were Wigton's other two goals. 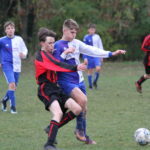 However we kept battling and despite playing the better football our finishing let us down, and we could only manage a 3-3 draw. 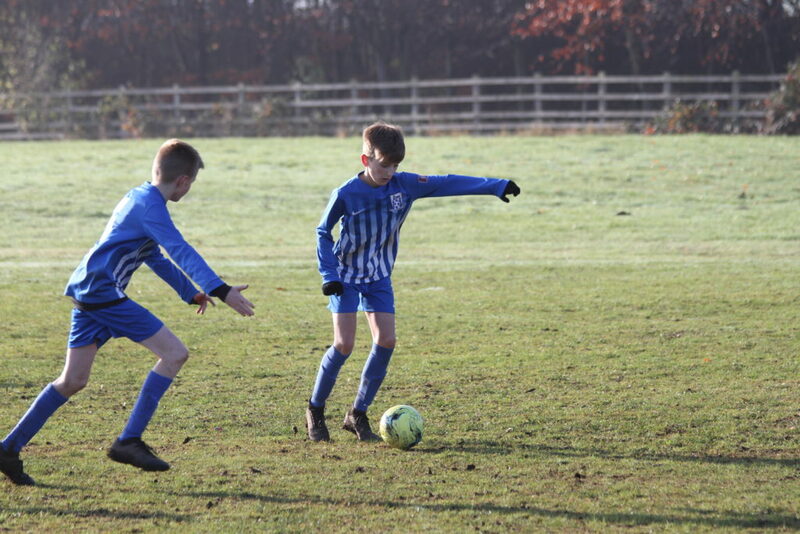 U10s played against two very strong Wigton Moor teams in bizarre weather conditions at Grange Park - it was extremely windy but unseasonably warm at the same time! 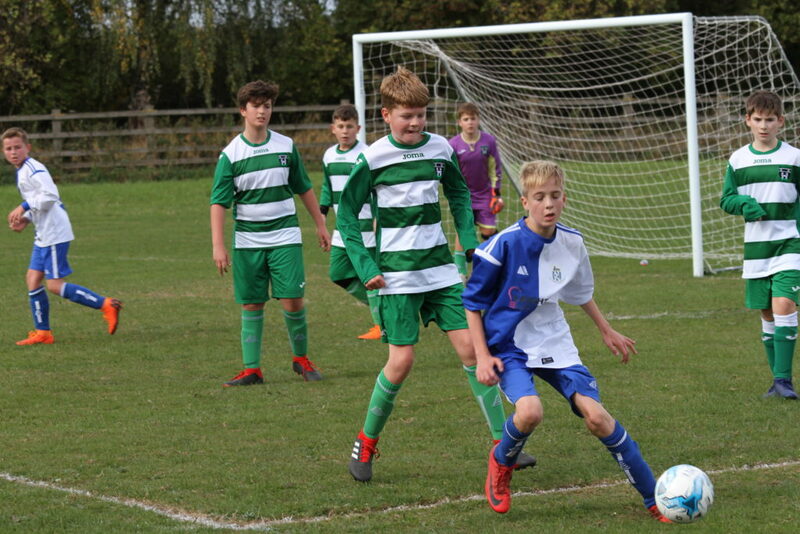 Playing against technically the best team we have faced so far this season, we played some good football but also conceded some poor goals due to defensive errors. We won 2, drew 1 and lost 1. 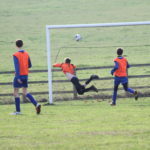 U14s Girls also played Wigton Moor at home. 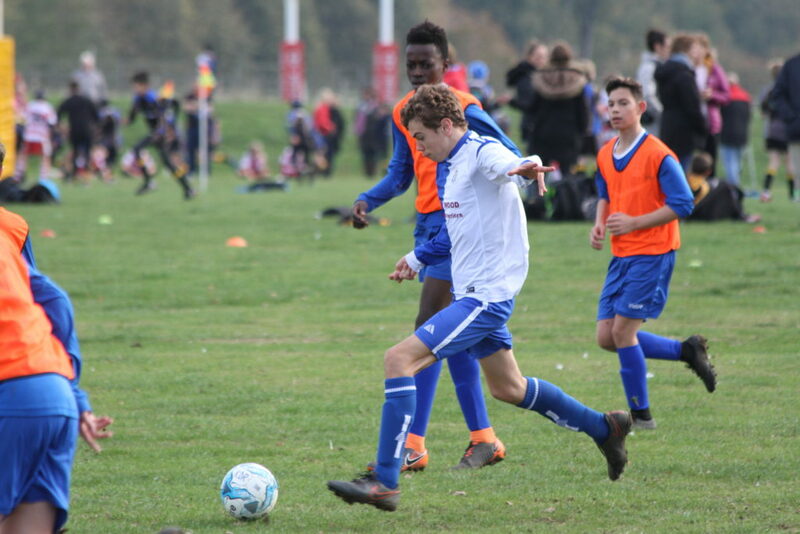 Playing into the wind we conceded early but recovered to take a 2-1 lead into the break. 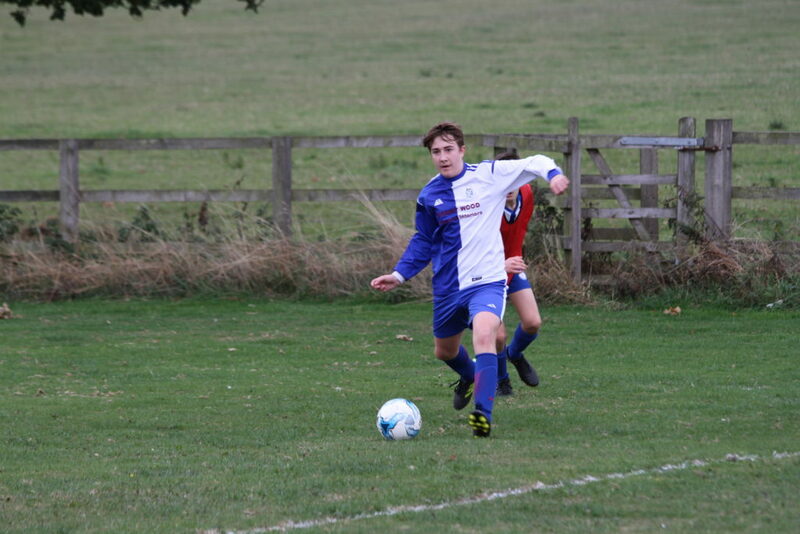 In the second half we took full advantage of the wind and romped home 7-1. 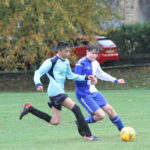 U16s played Wetherby B at Grange Park. 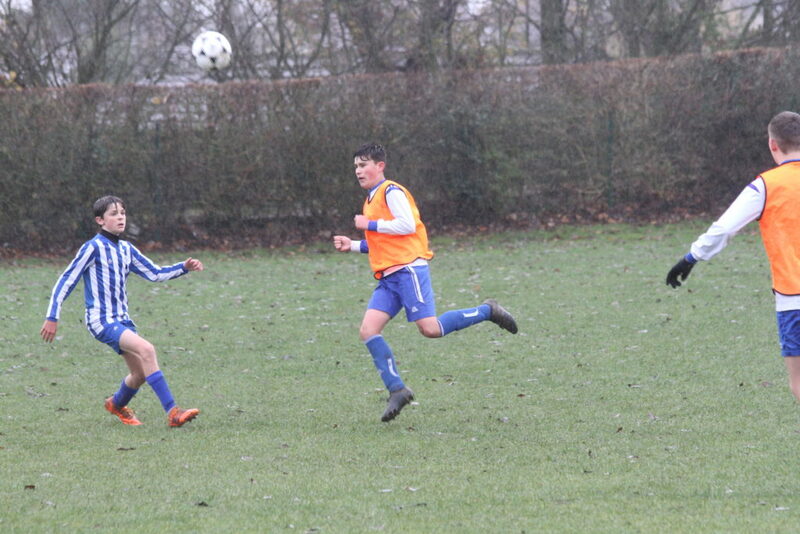 We failed to adapt our game to the windy conditions and were chasing the play for much of the match. 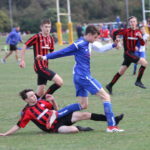 Final score 5-1 to Wetherby. 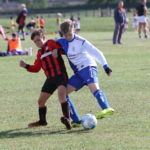 U7s continued their 100% start to the season with a convincing win over Killinghall Nomads. 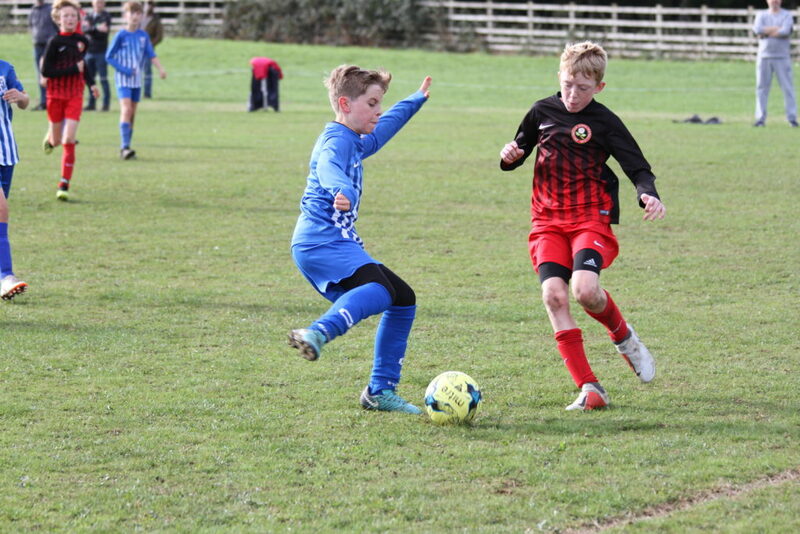 U9s faced a very good Wigton Moor team at Grange Park. 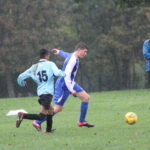 Our visitors won the league gala last season and beat us convincingly last year when we played them at a wet and muddy Roundhay Park. It was pleasing to see a big improvement in our performance this time. 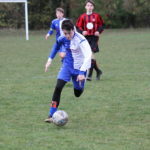 Despite losing 4 out of 4, a couple of the games might have ended all square, our finishing letting us down at crucial moments. 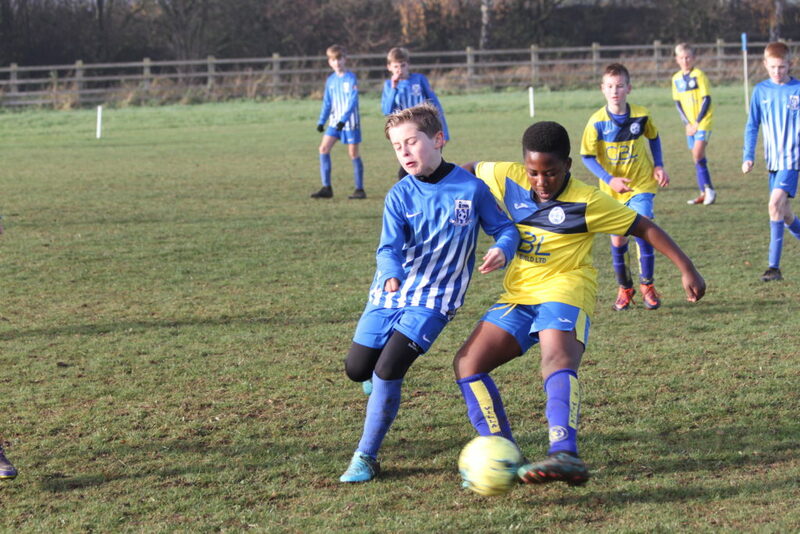 U10s played Otley at home, playing very well but let down by some sloppy defending. We won 2, drew 1 and lost 1. 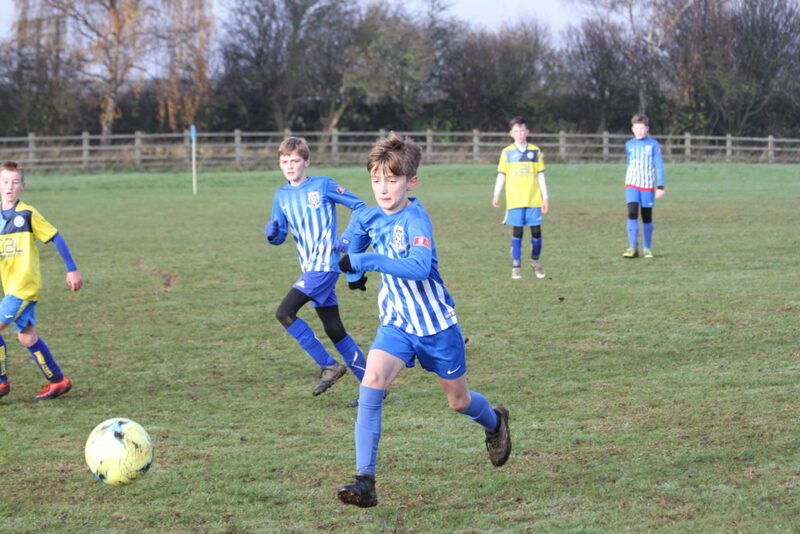 U12s got off to a good start at home against Wetherby Tigers, controlling the play and taking an early lead. 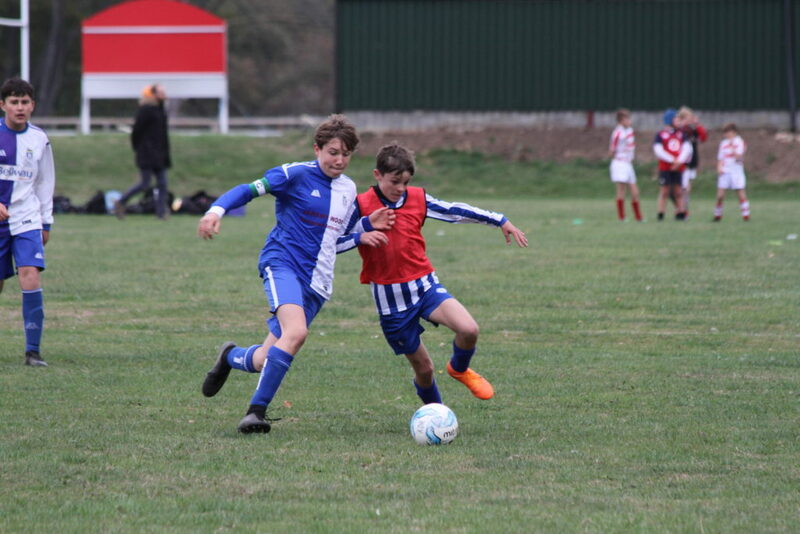 Excellent build up play and finishing, coupled with solid defending saw us 3-0 up at half time, and 7-0 winners at the final whistle. 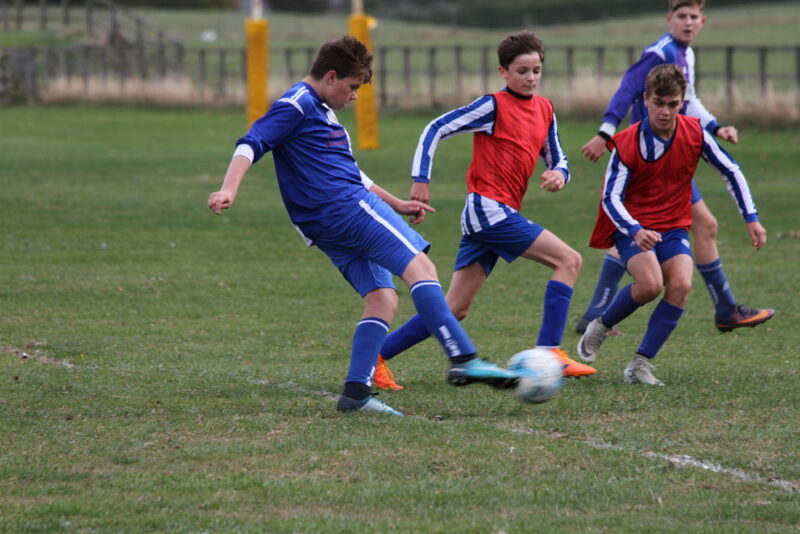 U13s played away at Nidd, who beat us 2-1 in our first game of the season and went into the game with a 100% record. Despite playing some good football in the first half we were a little unfortunate to be two goals down at the break. 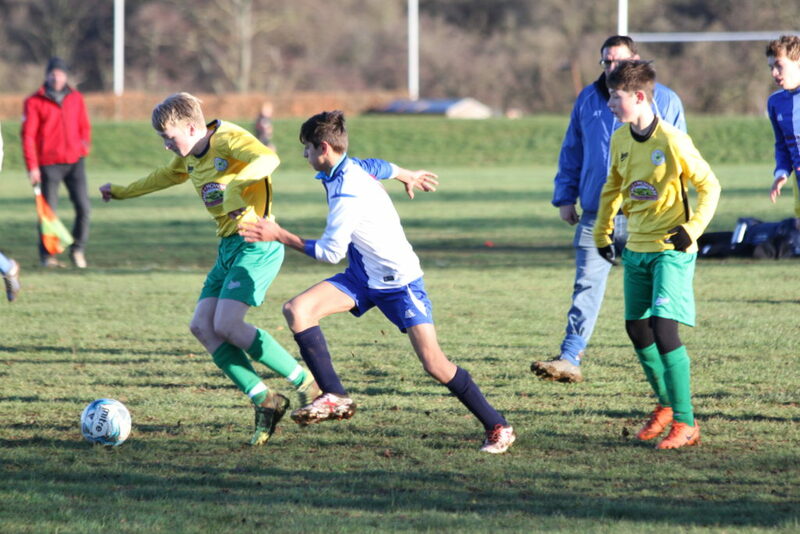 A battling second half performance saw us score two good goals without reply, to pull off a 2-2 draw. 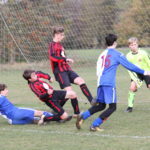 U15s lost a close encounter 3-2 away at Burley. 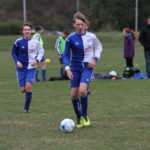 Our squad was a little depleted due to scouting activities and illness, and we fielded two new signings and a player carrying a painful injury. On Saturday U14s Girls watched the England Women's team beat Brazil Women 1-0 in a friendly at Meadow Lane. 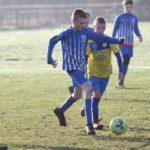 The following morning we played our first ever Sunday match away at Rothwell Juniors. A poor first half display saw us 3-1 down at the break to a bigger and more powerful side. Cue an inspirational talk from the coach, coupled with some positional changes on the field, and we proceeded to dominate the second half, pulling the game back to 3-3, and missing some glorious chances that might have given us a win. 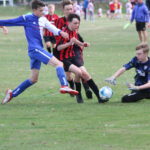 County Cup action for U14s and U16s. 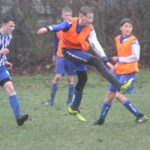 U14s beat Altofts U13s 5-1, playing good passing football to overcome a very talented team. 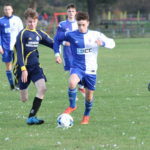 U16s lost 5-2 away at Bradford Park Avenue. 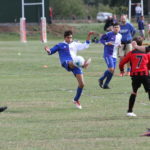 The scoreline did not accurately reflect the game; even Bradford's coach reckoned a 3-1 win to us would have been a fair result. 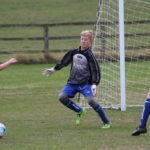 The opposition's goalkeeper was the player of the match, they took their chances, including two 25 yard screamers, and we didn't take ours. 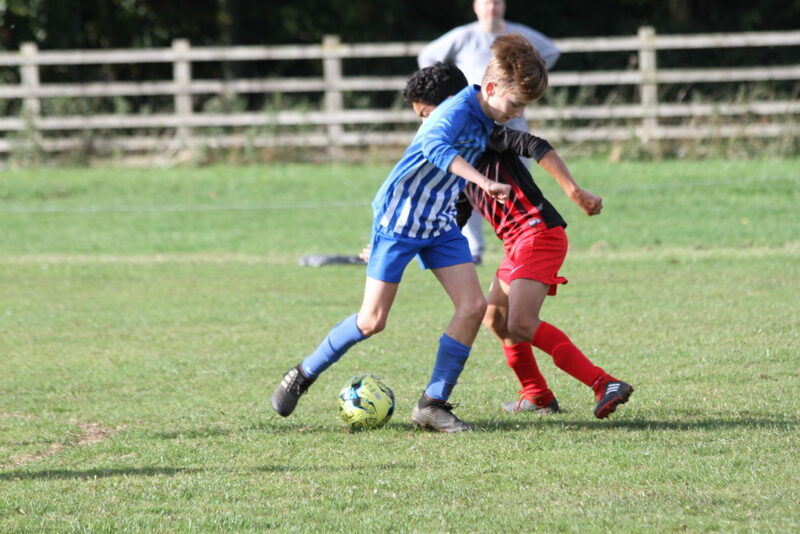 U11s played a very tough Pannal Sports side. 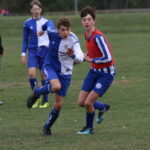 A few defensive errors meant we conceded goals we shouldn't have, but the boys fought hard and came away with 3 wins and a defeat. 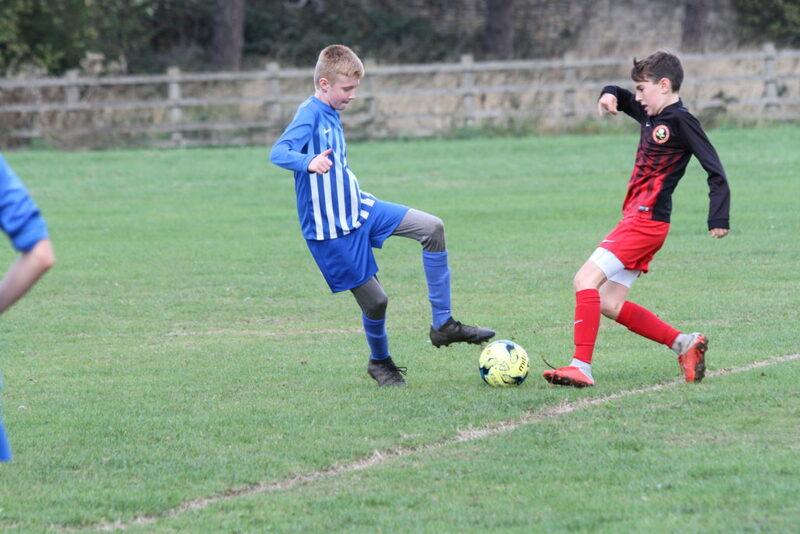 U12s were away at Knaresborough Celtic, whose perfect playing surface perfectly suits our passing game. 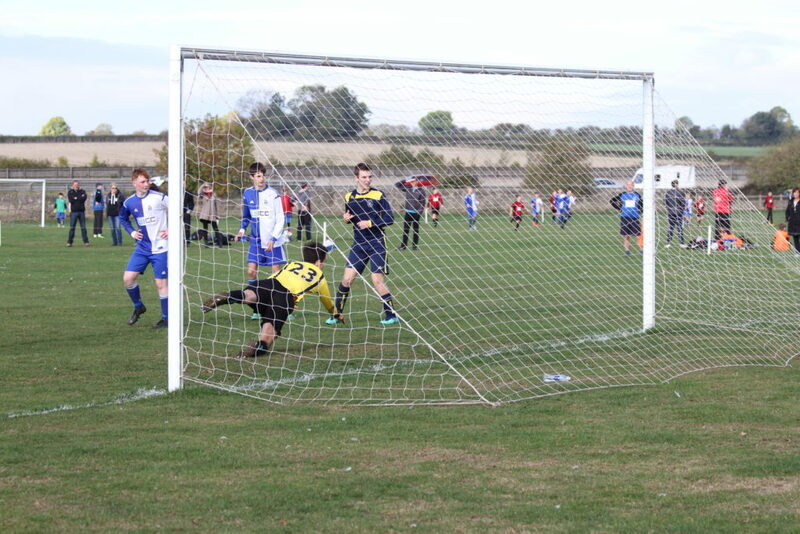 We were ahead through a penalty within 5 minutes, only for Knaresborough to equalise almost immediately. 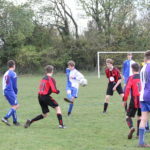 After that it was one way traffic; we were 6-1 up at half time, and finished 10-2 winners. 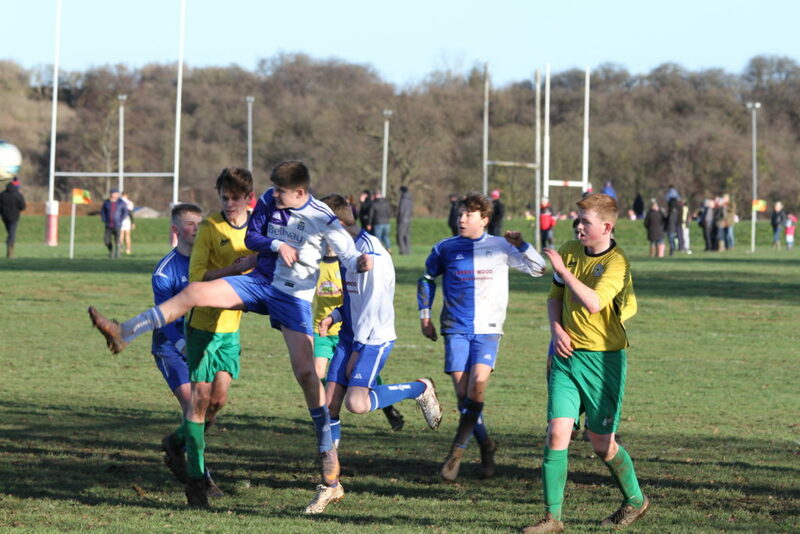 In contrast U14s played on a bouncy, rock hard surface away at Garforth Villa. 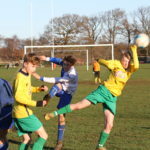 This was a fabulous game of football contested by two evenly matched sides. 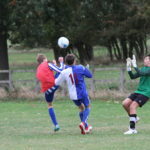 We took the lead, and were denied a second by some excellent goalkeeping and errant finishing on our part. 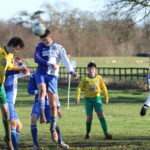 Garforth equalised with 10 minutes remaining, and it finished 1-1. 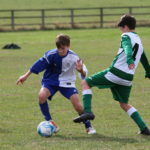 U15s played a gritty 1-1 draw against Beckwithshaw. 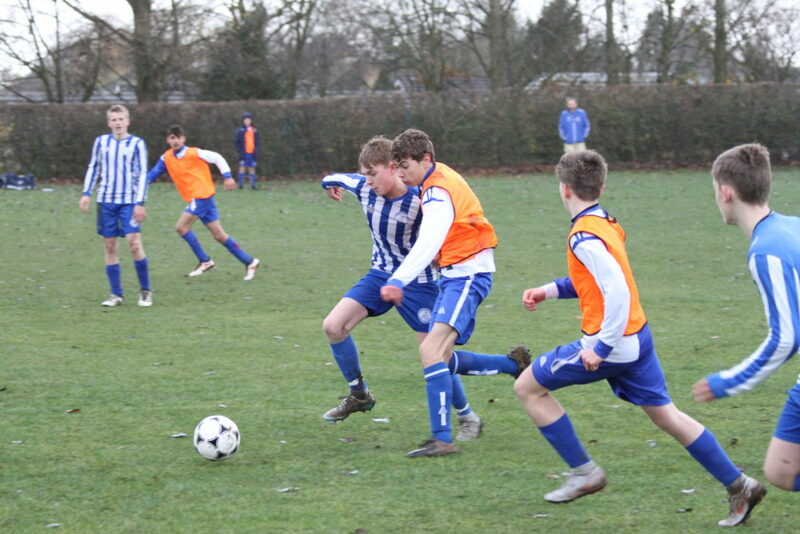 Both teams hit the woodwork in the second half, and we finished the stronger team, but a draw was a fair result. 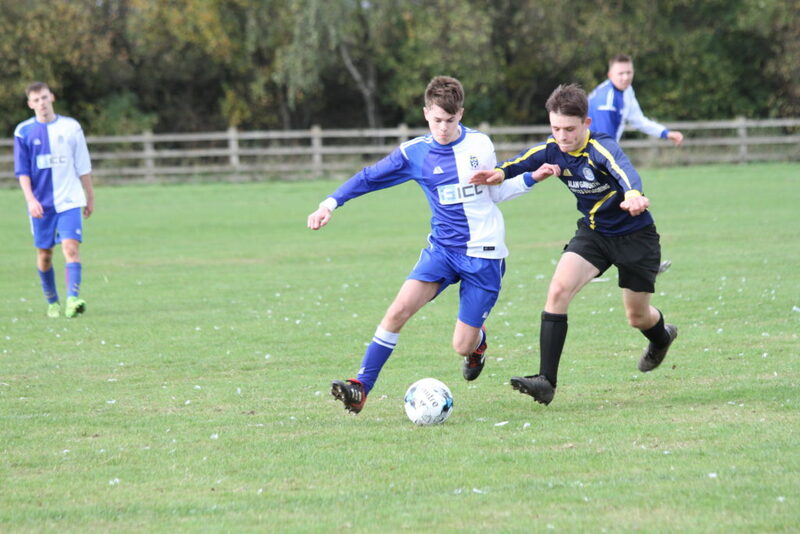 U17s were unlucky to lose 1-0 at Tadcaster Magnets. 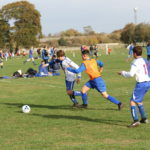 Despite us being the better side, we were undone by injuries, no subs, and a number of players playing out of position. 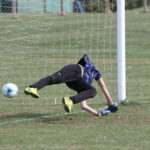 The goal we conceded was a consequence of a freak error. 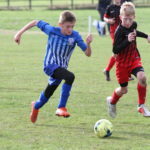 U8s played away at Wetherby. 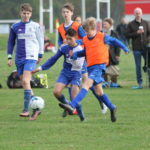 Four very close games contested by evenly balanced teams. 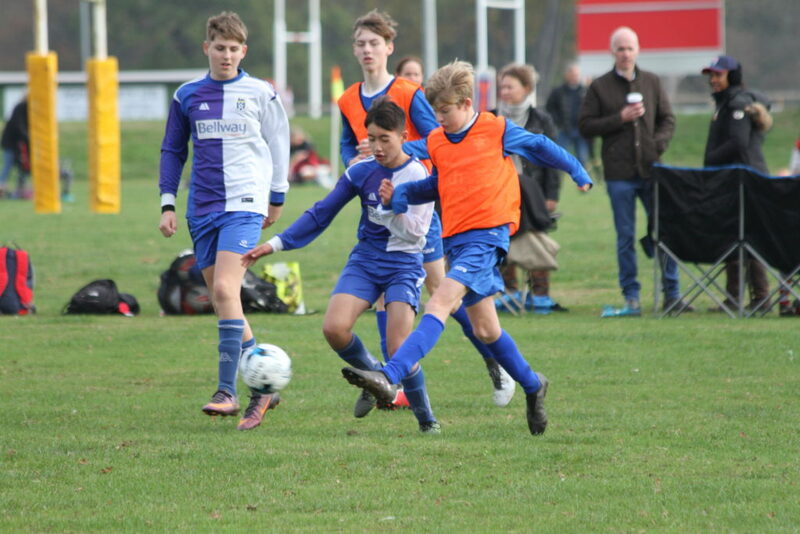 Two wins, a draw and a defeat, with no more than a single goal margin in any of the games. 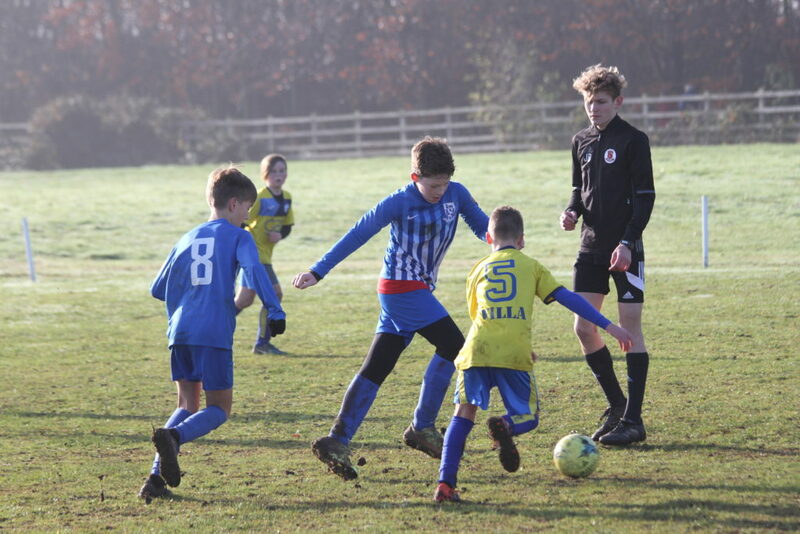 U10s completely dominated their first two games against Harrogate Railway, winning both convincingly, but then went to sleep, losing one and drawing one of the next two games. 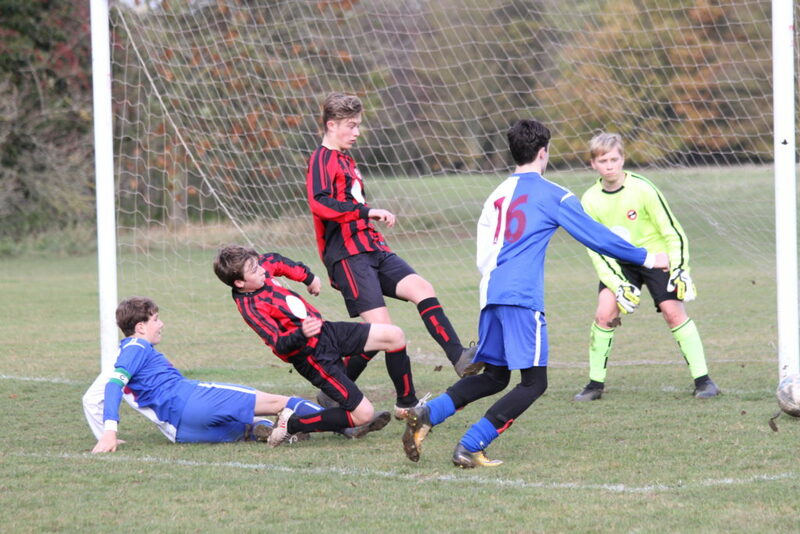 U15s were by far the stronger side in the first half away at Aberford, but failed to convert dominance into goals. The second half was much closer, and could have gone either way. 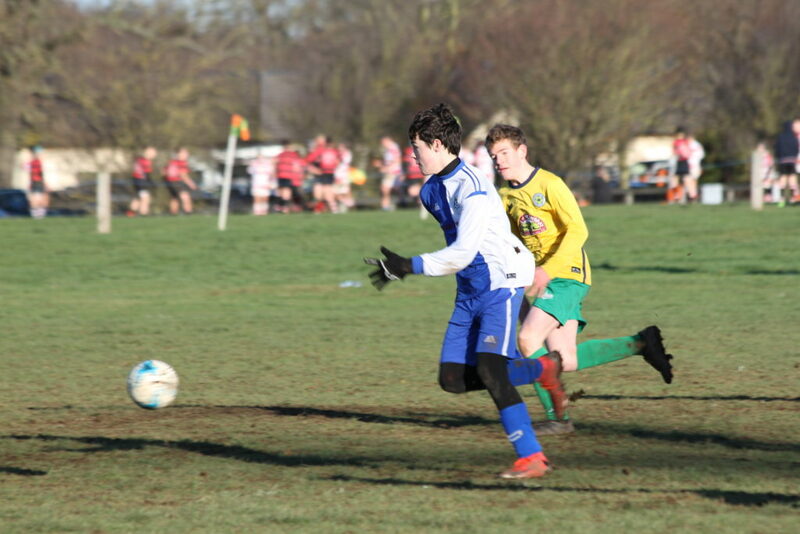 Neither team was able to break the deadlock, so a 0-0 draw was the end result. 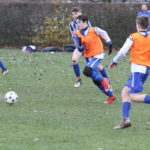 U16s Girls beat Guisborough 5-1. 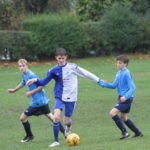 U16s lost 2-1 at home to Beckwithshaw. Despite dominating the first half we had just a solitary goal lead at the break. 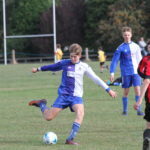 Beckwithshaw responded after the interval with a good spell of football, during which they scored twice. 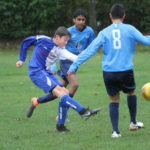 Our boys replied with lots of possession, but lacked the creativity to salvage the match. 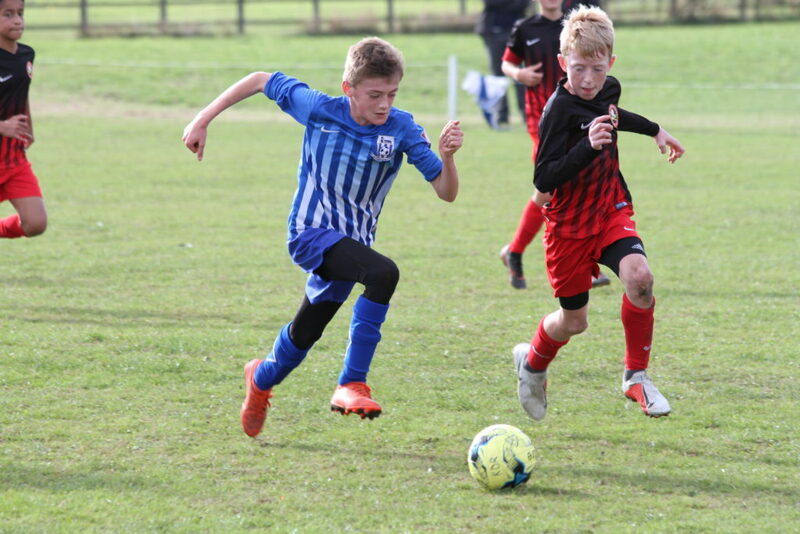 U7s continued their impressive start to the season with a convincing win against Ripon City Panthers. 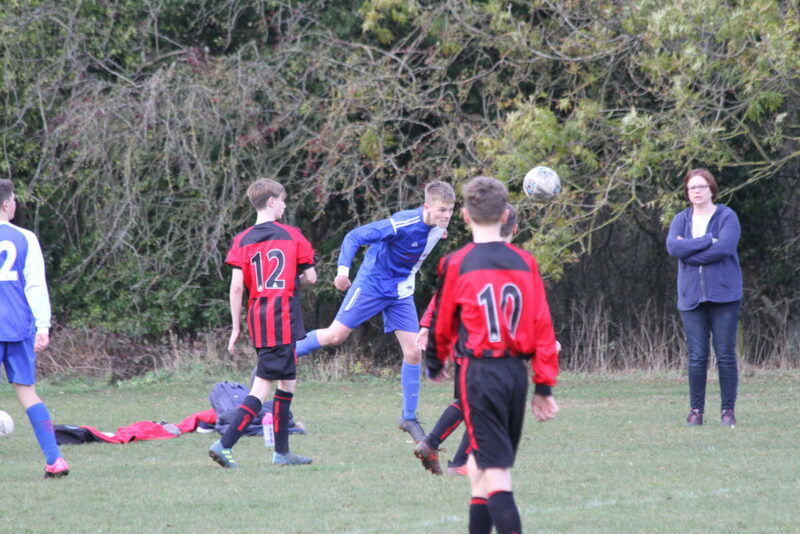 It was pleasing to see four different players get on to the scoresheet. 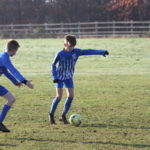 U10s won all four games away at Pannal Ash. 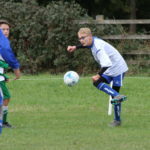 One of our teams won their games comfortably, the other found the going a little harder. 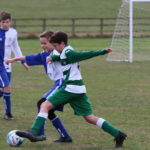 U11s won three and lost one against Knaresborough at home. 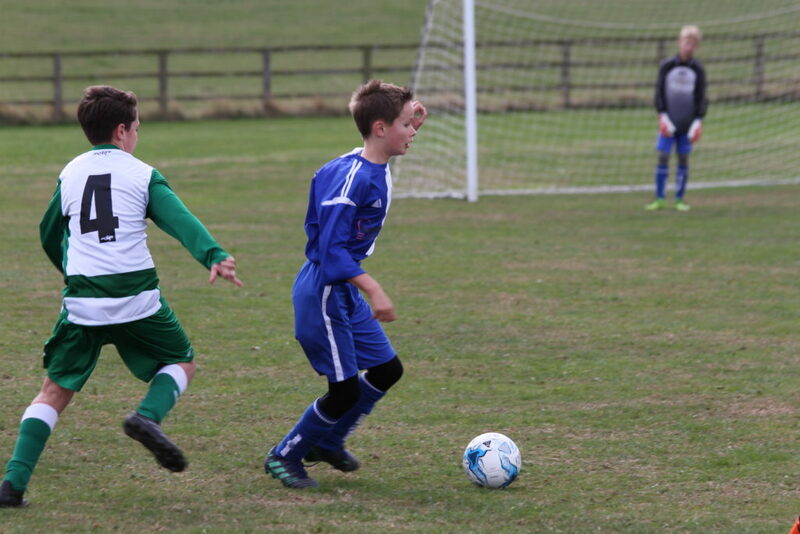 Rather like the U10s, one team cruised, the other struggled. 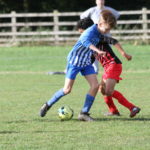 Despite playing some good football and putting in lots of effort U12s were beaten 2-1 away at Lawnswood. 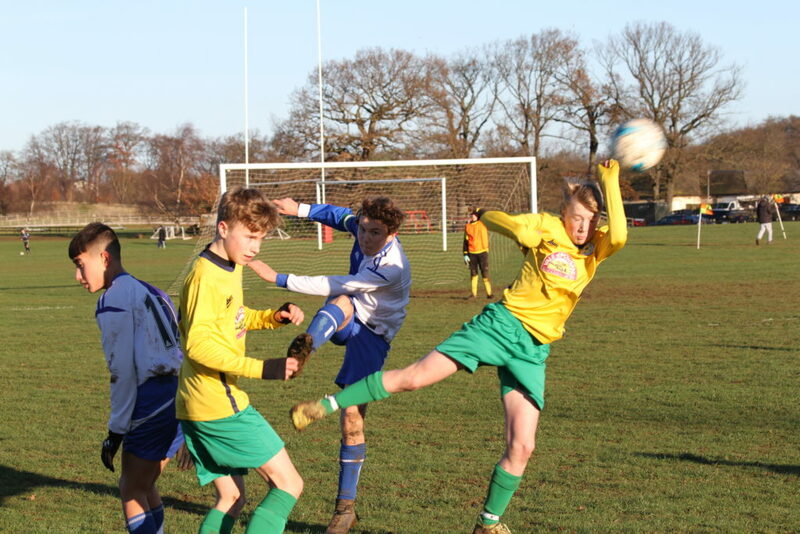 U14s showed real team spirit to overcome Ripon 9-0. 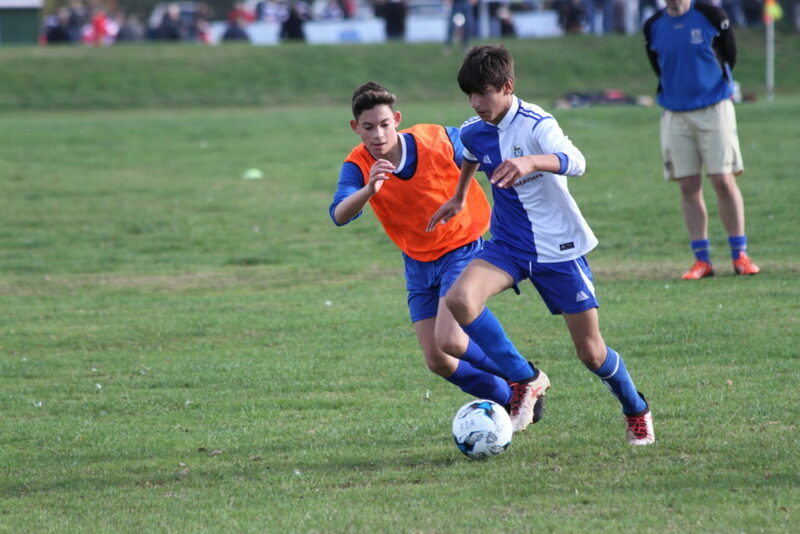 U15s lost a closely contested match 1-0 away at Leeds Maccabi. 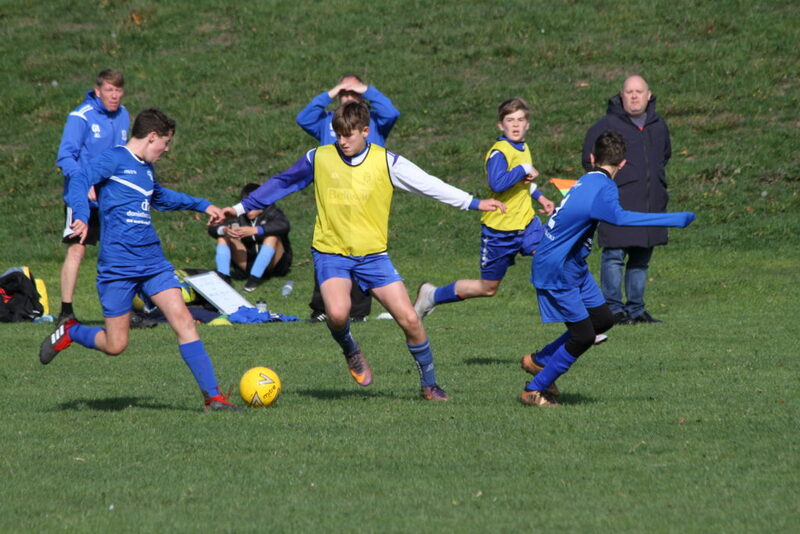 After conceding a very early goal we fought to get back into the game but were unable to find the net despite hard work, much possession and a number of attempts on goal. 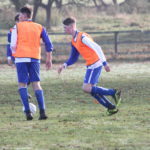 U17s beat Yorkshire Amateurs 3-2 in a fractious encounter. 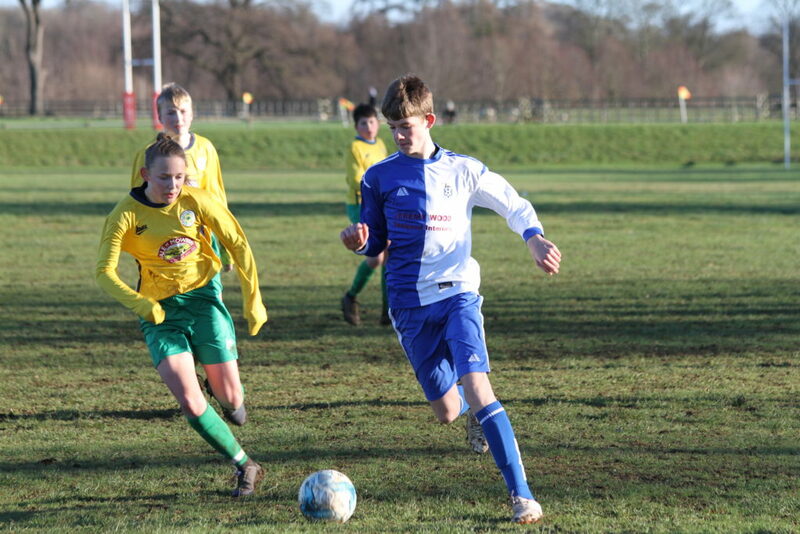 U14s Girls expected a closely fought contest against last season's runners-up Guiseley, and we certainly got it. 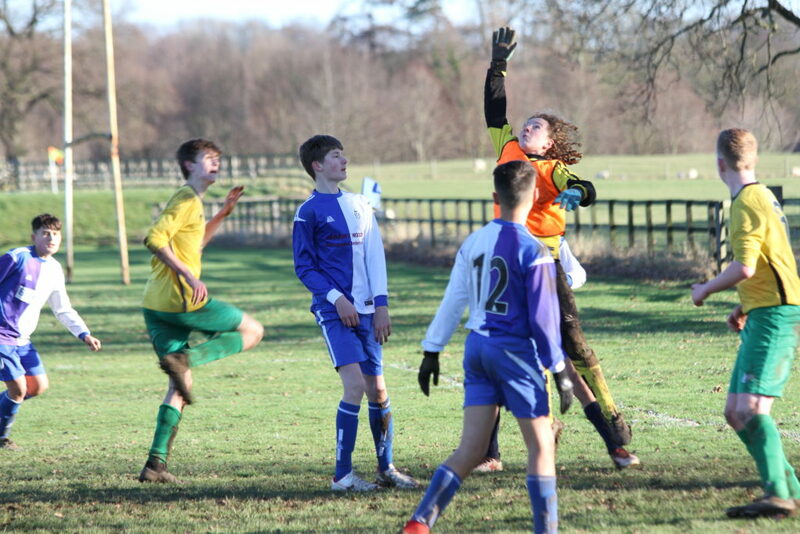 We took the lead but almost immediately conceded an equaliser. 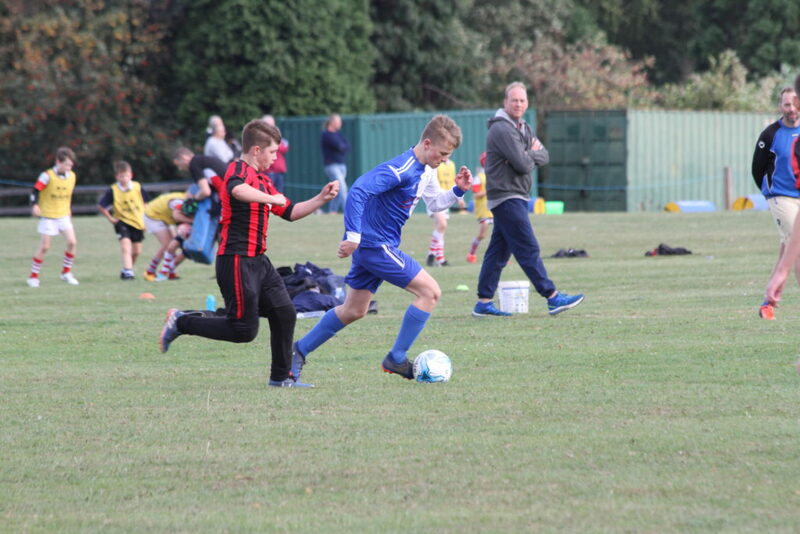 The match ebbed and flowed before we got the winner five minutes from the end. Not our best performance, but a 2-1 win nonetheless. 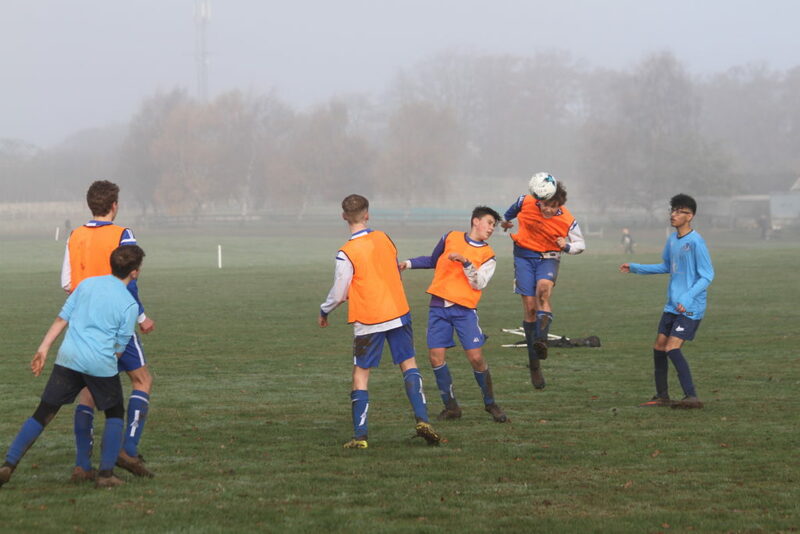 U15s played in the 1st round of the League Cup away at Altofts Reds, who are top of the division above ours. We were second best for pace and passing in the first half, going in 5-0 down at the break. 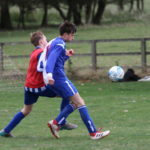 A big improvement in the second half; Matt Hill rounded off a great solo run with a goal, but we conceded twice more to make the final score 7-1 to Altofts. 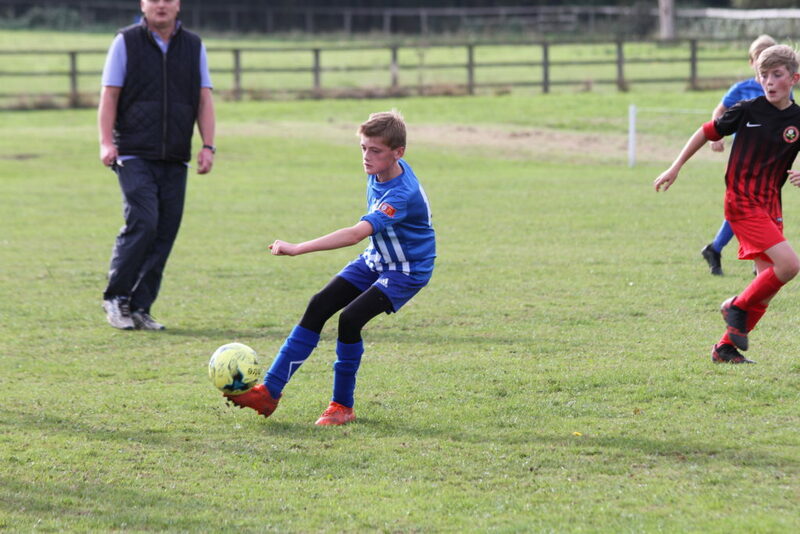 U8s kicked off their season in some style with 3 wins and a draw against Ripon City Panthers at Grange Park. 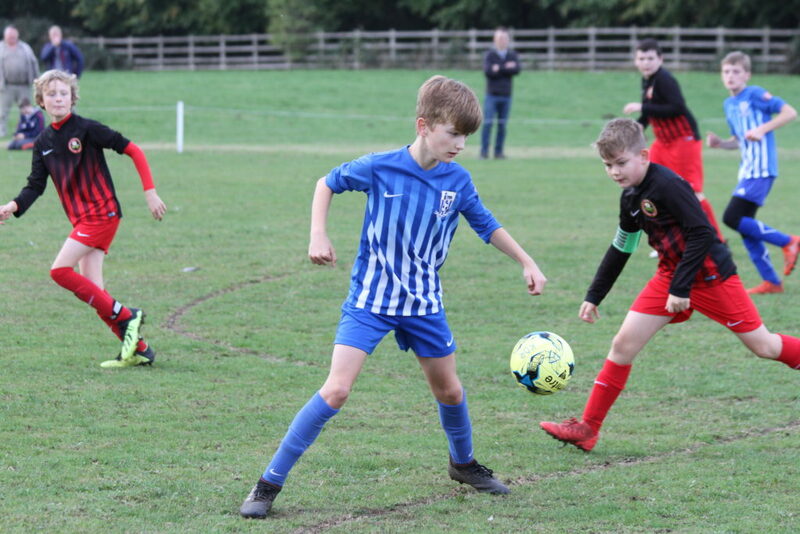 U10s responded well to last week's disappointing display, playing some fantastic football against Knaresborough Celtic, winning three, drawing one, and scoring 18 goals in the process. 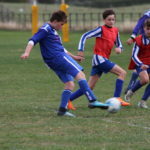 Barkston Ash Cup matches on the schedule for a couple of our teams today. 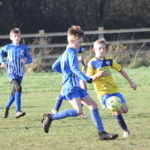 U12s were drawn against Tadcaster Albion, but a last minute no show by the referee meant the game is postponed to a later date. 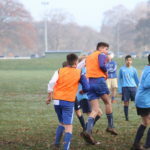 U16s had the better of the first half away at Wetherby, but some of our boys tired after the break (having already played rugby earlier in the day) and we were beaten 3-1. 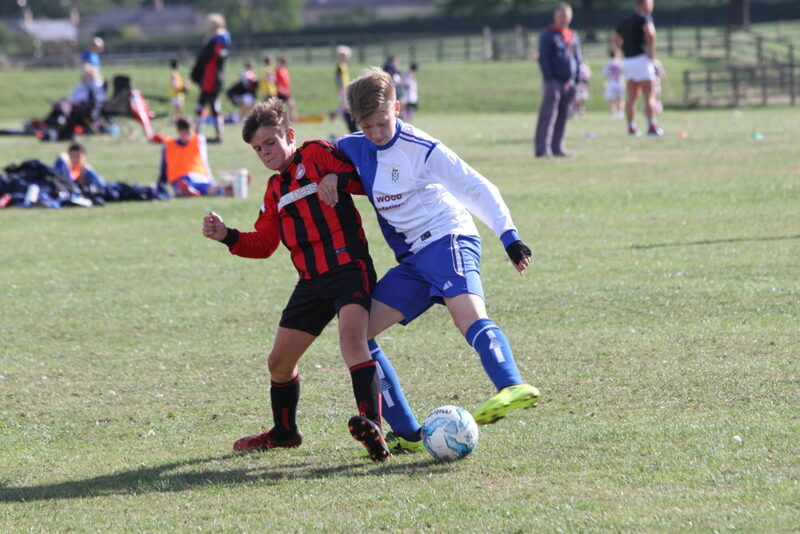 U13s match against Pannal Sports was a closely fought contest between two evenly matched teams. 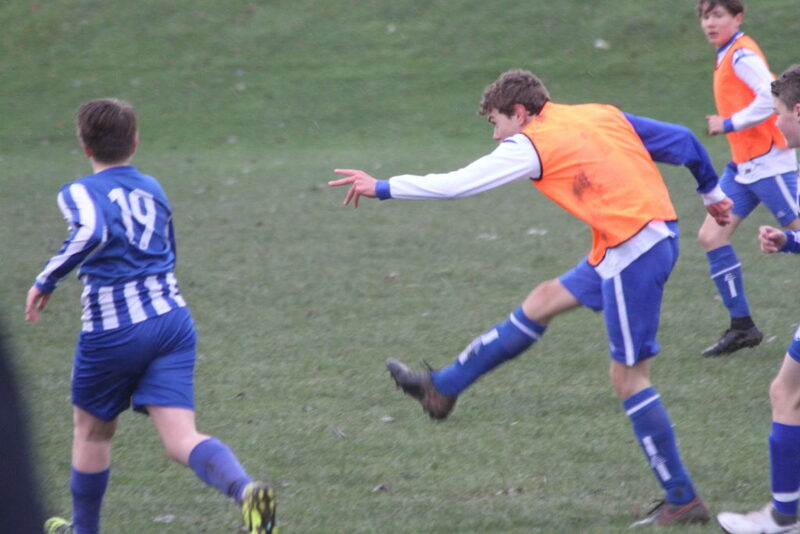 Pannal went ahead but we turned the game around late on, ending up with a 3-1 win. 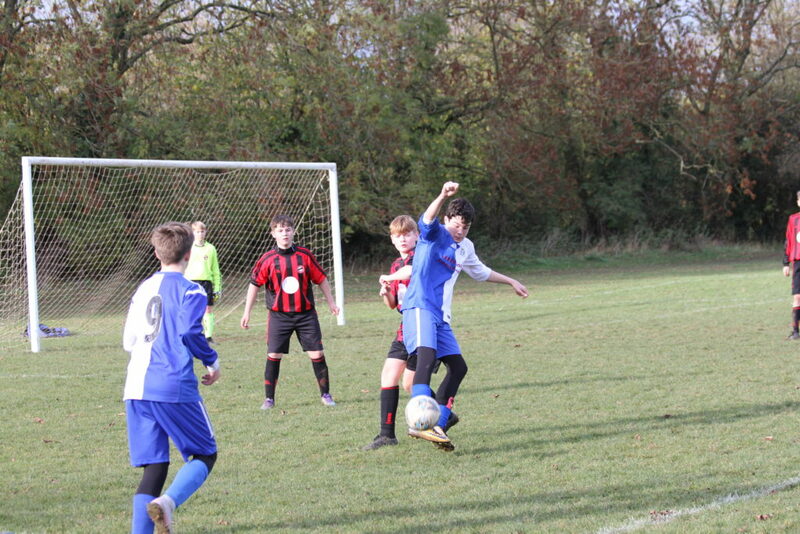 U14s were away at Lawnswood, who started strongly and went a goal up. 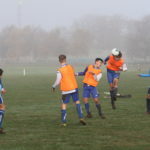 This inspired our boys to step up a gear, replying with five goals before half time. 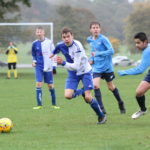 The second half saw us continue to dominate, and we finished 10-4 winners, with six different players on the scoresheet. 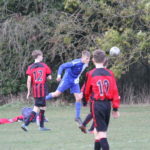 U15s lost 4-3 at home to Ripon. 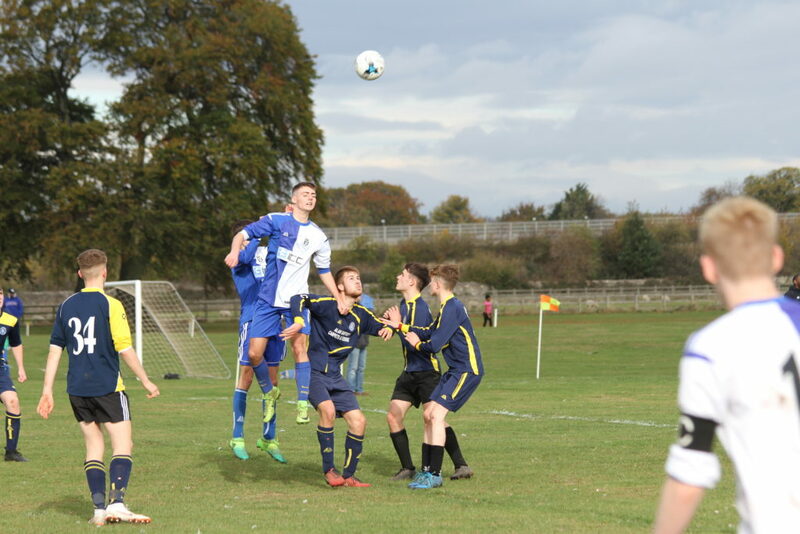 4-1 down at one point, they spiritedly fought back to almost rescue a point. 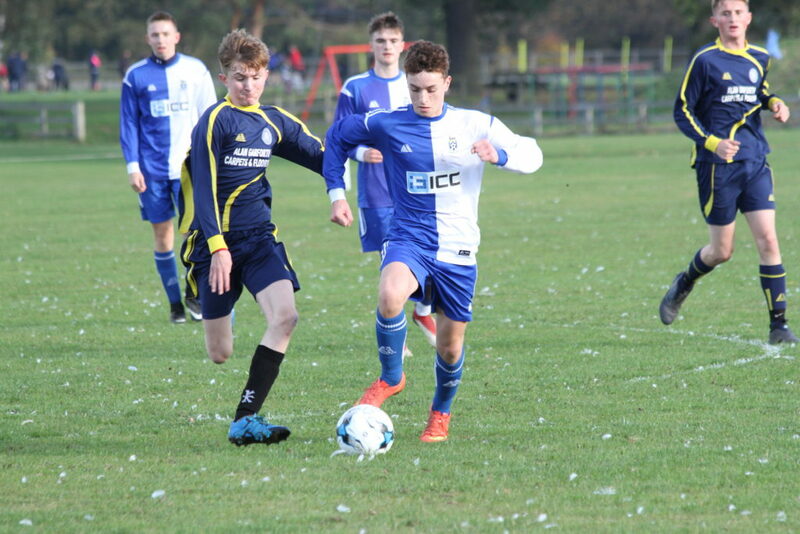 U17s drew 3-3 away at Ilkley. 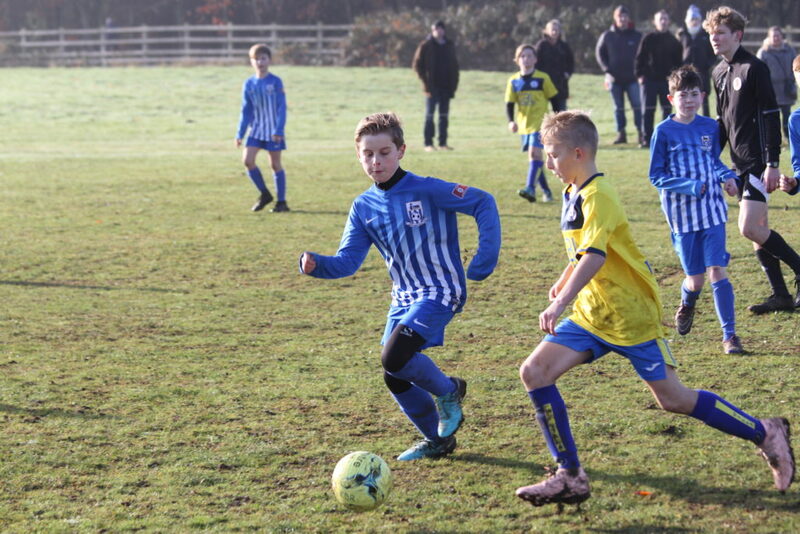 U9s second game of the season carried on very much in the manner of the previous week's encounter with Ripon. 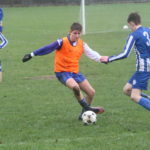 This week's opponents were Wetherby Athletic, against whom we won three and drew one. An improved performance from week one, and both teams are starting to gel. U13s Girls started their league campaign against Pannal Ash, who beat us convincingly last season. 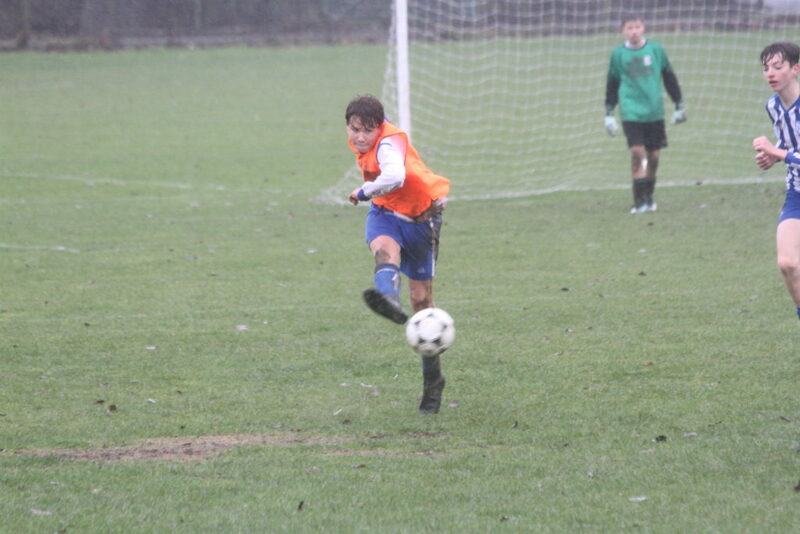 We got off to a slow start, conceding twice before an Ella Marshall hat trick gave us a 3-2 half time lead. 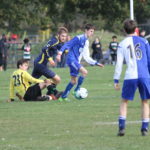 We scored three more in the second half, then conceded a late goal to make the final score 6-3. 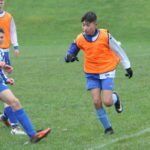 U14s Girls played their first competitive 11 a side fixture in our new league away at Farsley Celtic. It was a really good competitive game. 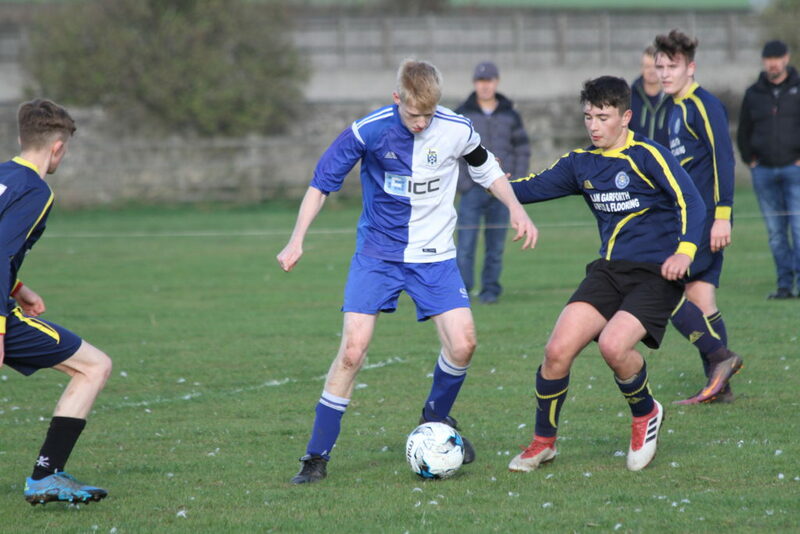 Farsley started very strongly but it was Kirk Deighton who took the lead with a 20 yard top corner screamer. 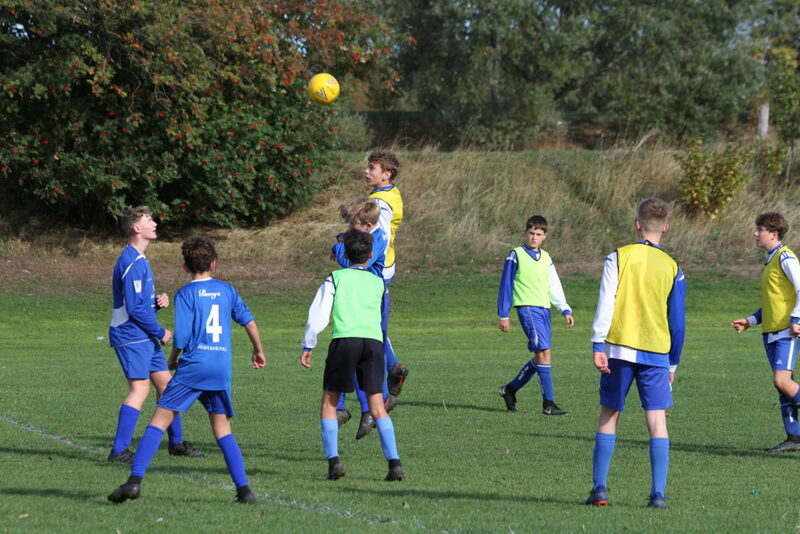 The home team equalised a few minutes before half time and parity was probably a fair reflection of the first half. So we re-jigged the formation and the girls came out and dominated the second half. 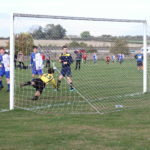 Lots of chances came and went but midway through we got the goal we deserved. 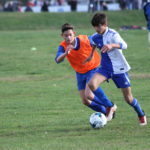 The girls' stamina was amazing given they were playing on a full sized pitch and they needed to dig deep to defend as Farsley pushed bodies forward in search of an equaliser. The manager's heart rate was becalmed with three minutes to go when a goal from a clever indirect free kick routine gave us a 3-1 victory. 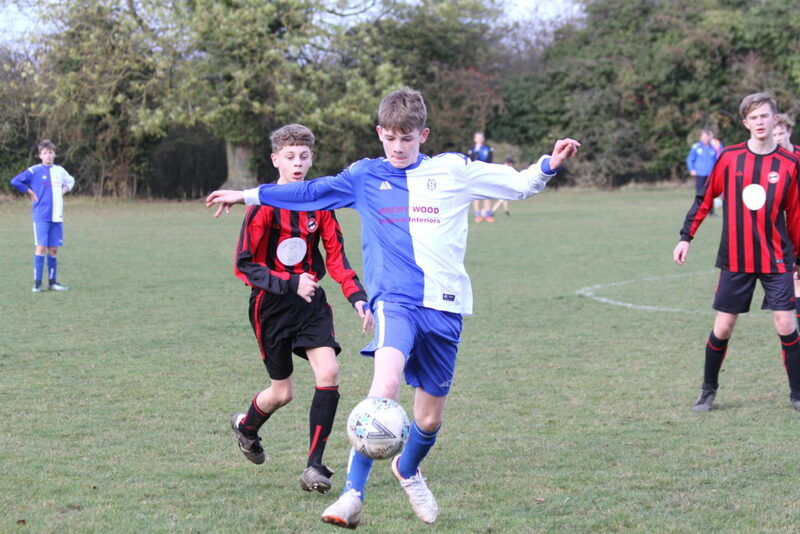 U15s played their second Selby League game of the season against Oulton Athletic at Grange Park. 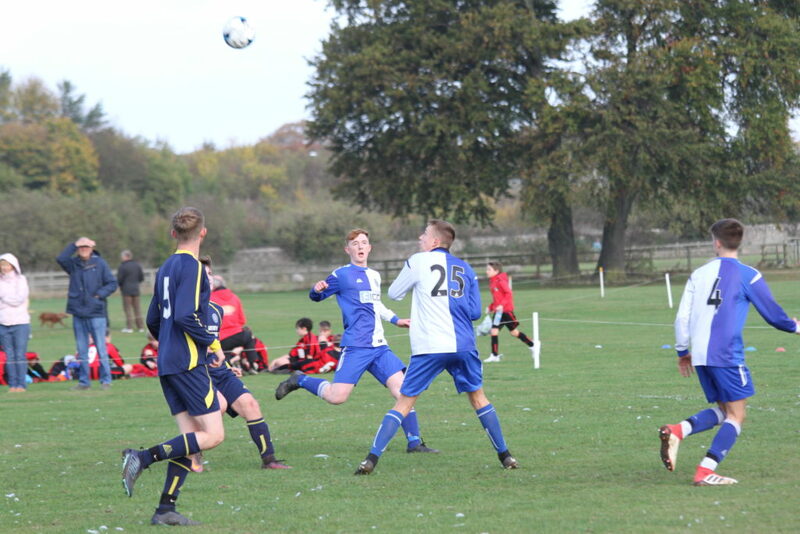 We missed a first half penalty, only to see Oulton take the lead from a free kick. 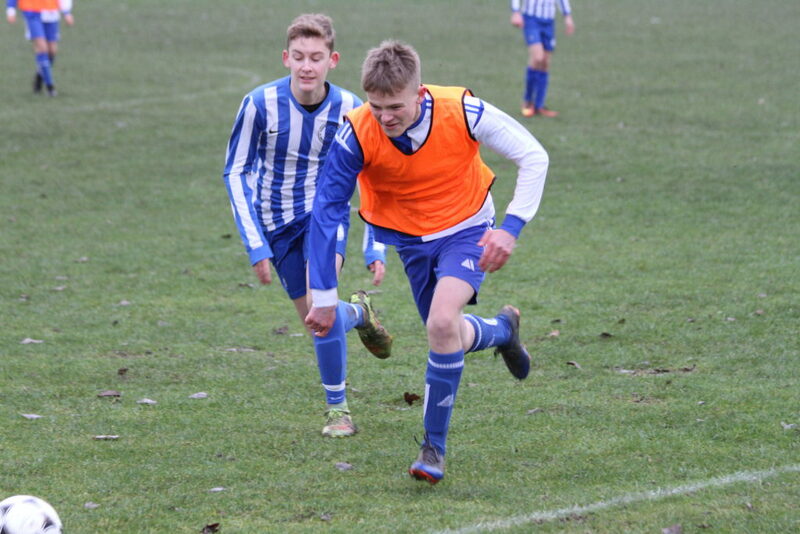 Matthew Hill equalised within 5 minutes, and we went in to the break even at 1-1. 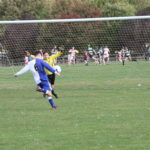 Ten minutes into the second half Odhran O'Duchon scored our second goal. 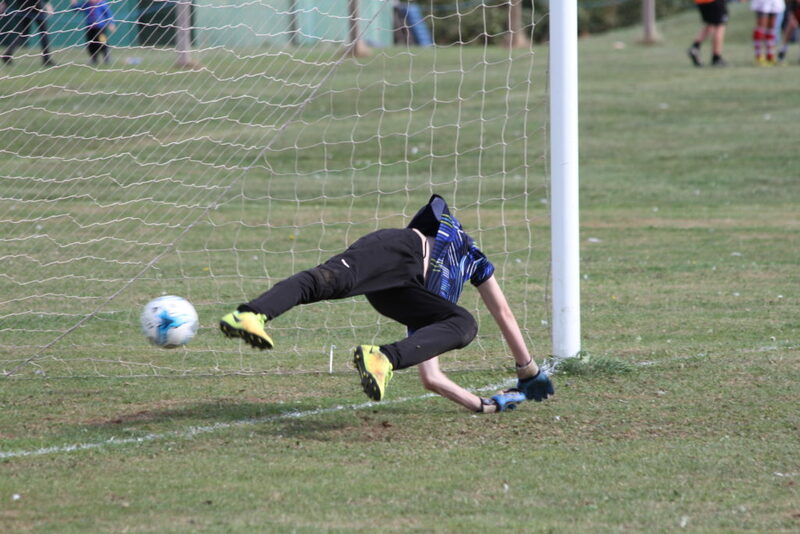 Both teams then missed a number of chances to score, and our goalkeeper Jake Levine pulled off some stunning saves. 2-1 at the end, and fully deserved. 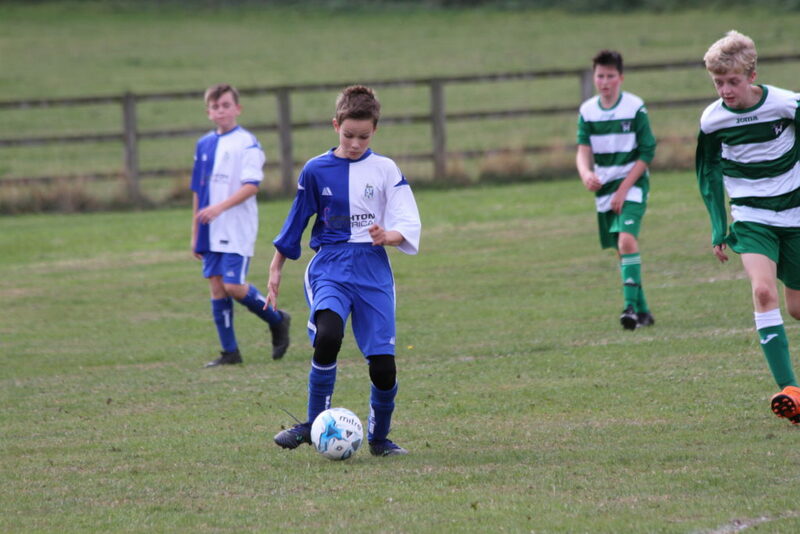 U7s produced an excellent team performance to kick off their season with a win against Beckwithshaw. 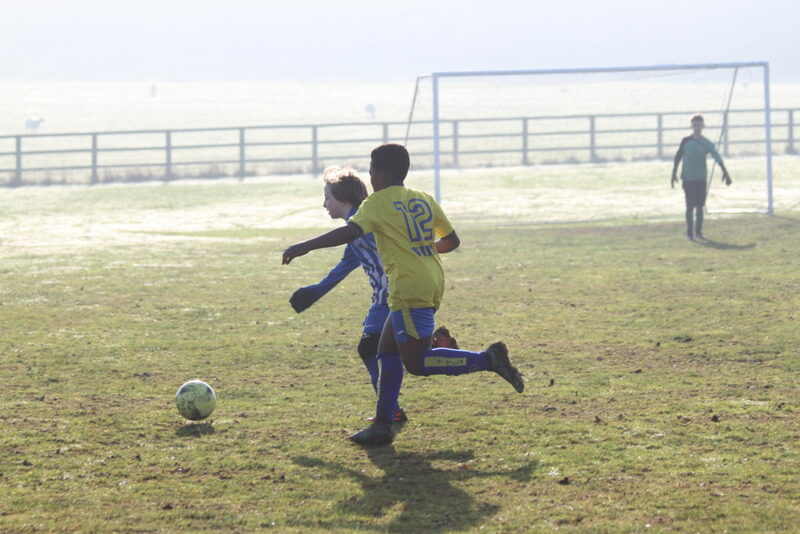 A great start also for the U9s, playing 7 a side matches for the first time. 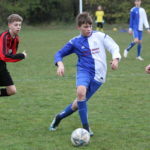 We entertained Ripon at Grange Park, and came away with 2 wins and 2 draws. 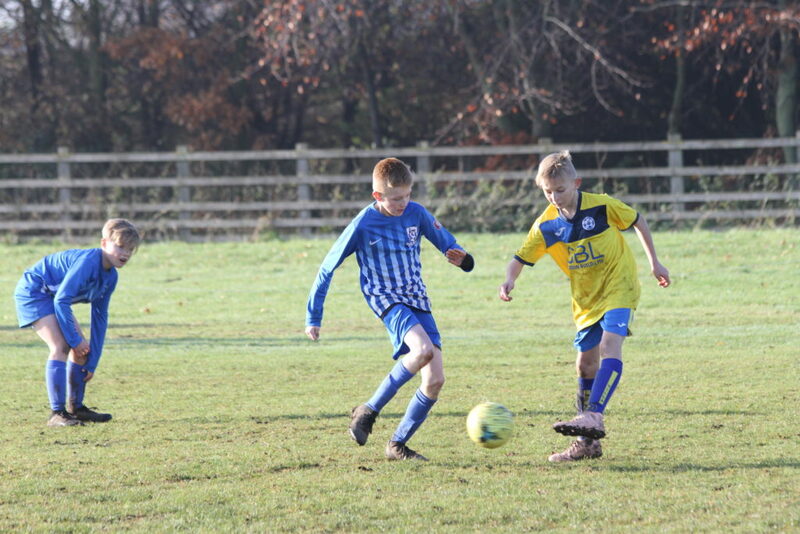 U10s travelled in the opposite direction, in terms of geography and results. 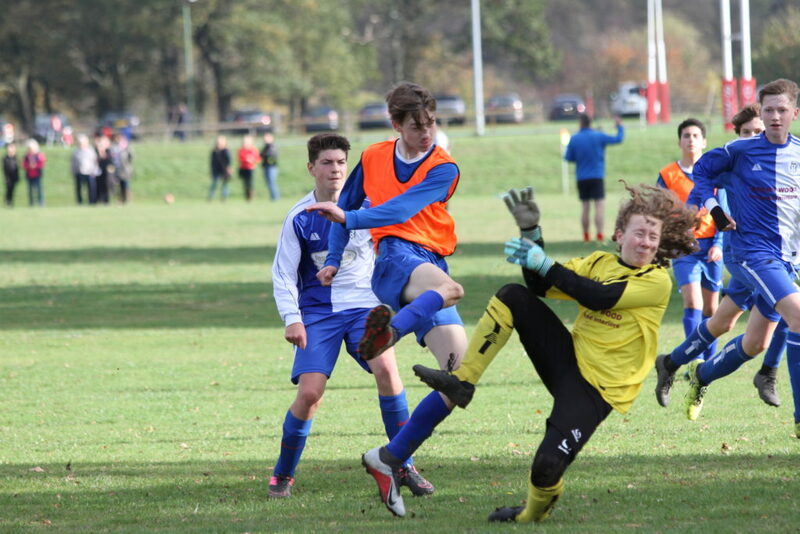 Some early season match rustiness saw us lose twice, but we managed to draw the other 2 games. 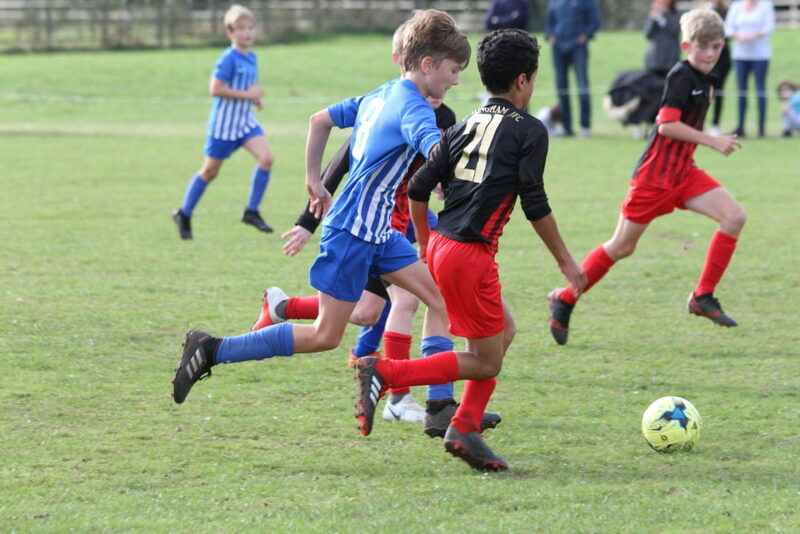 U11s overcame any concerns about first day fitness by winning 4 out of 4 against Pannal Sports at Grange Park, with clean sheets in all four games. 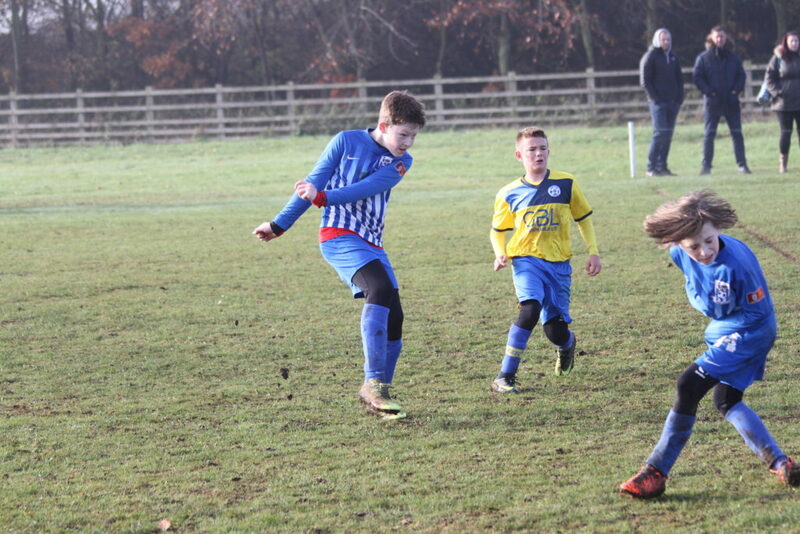 U12s got the season off to a flying start with a 5-2 win away at Pannal Sports Tigers. 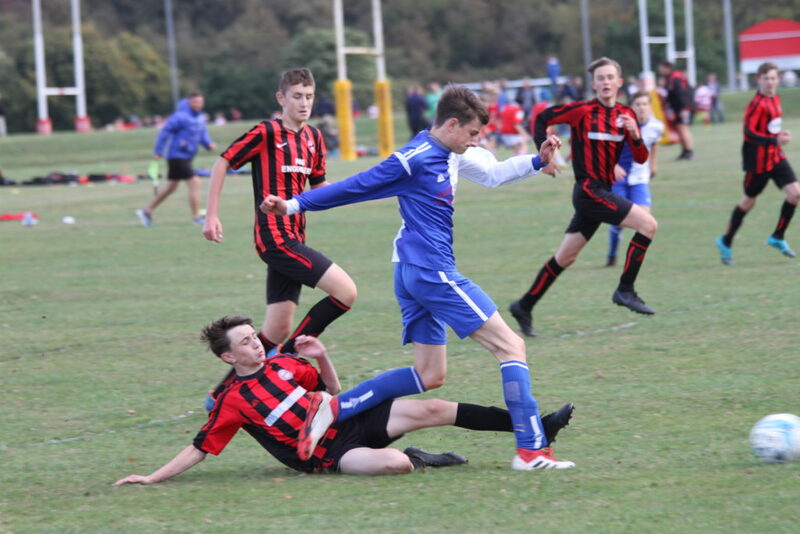 Despite dominating the first half we were only 2-1 up at half time, having missed a hatful of golden opportunities. We found our rhythm in the second half and powered our way to a deserved victory. 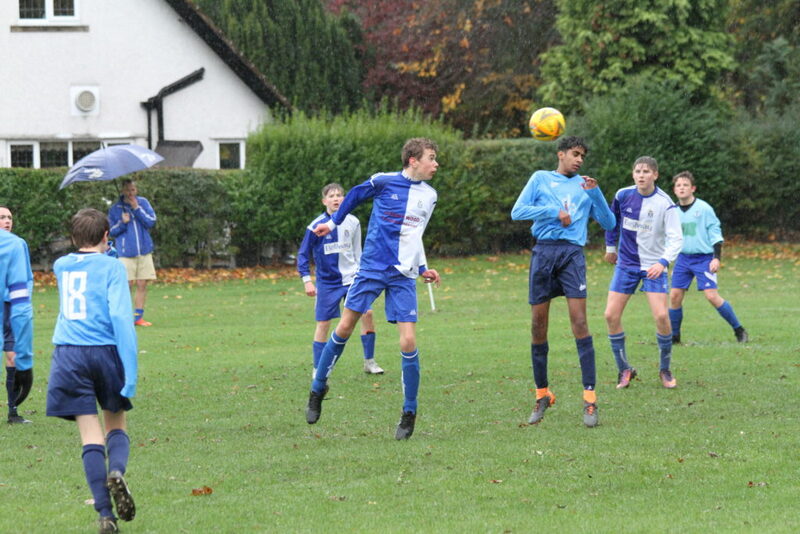 U14s had no problems in their first 11 a side league match, overcoming Pannal Ash 9-3 at Grange Park. 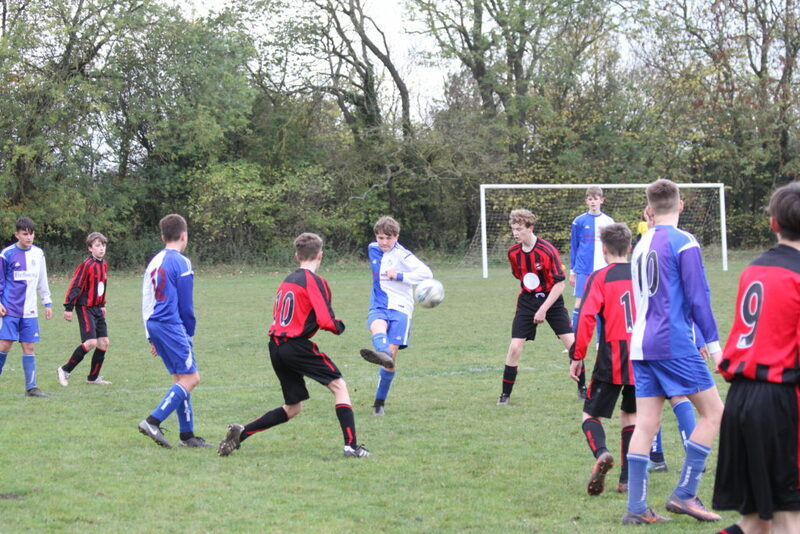 The U15s Sunday team recorded a good opening day 2-1 victory away at Lawnswood. It could have been more. 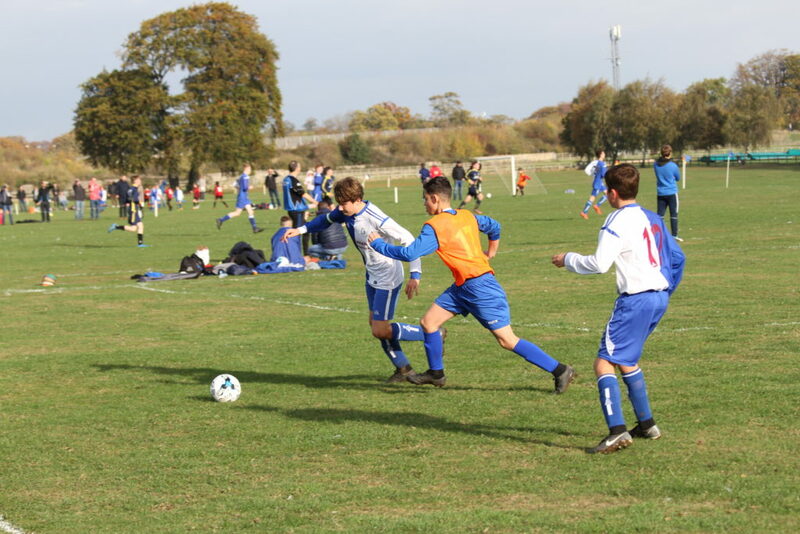 A second friendly in four days for the U14s Girls, this time against Ackworth Juniors at Grange Park. 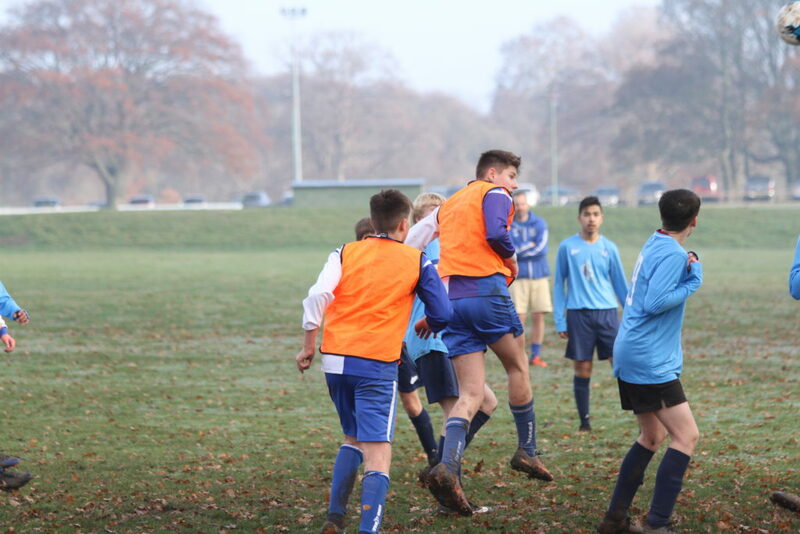 We scored after 30 seconds, were 3-0 up within eight minutes, and ended up 7-2 winners. 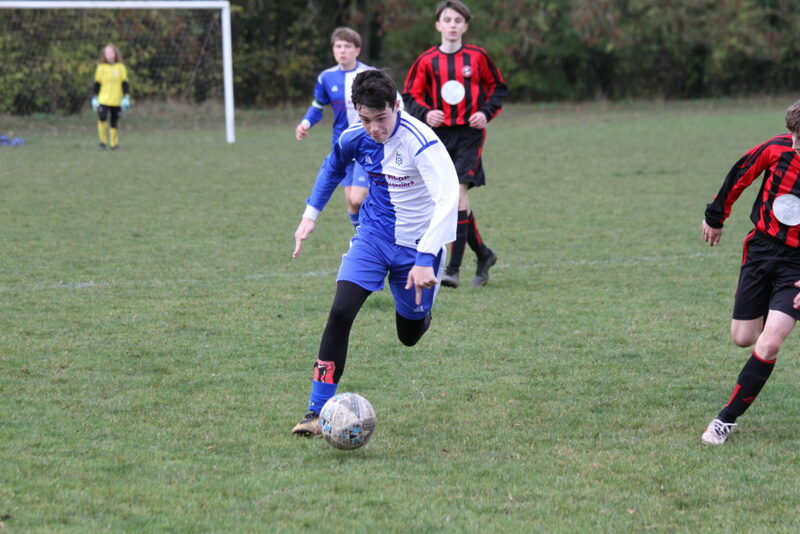 The U15s Saturday team made their debut in the Selby League away at North Duffield. 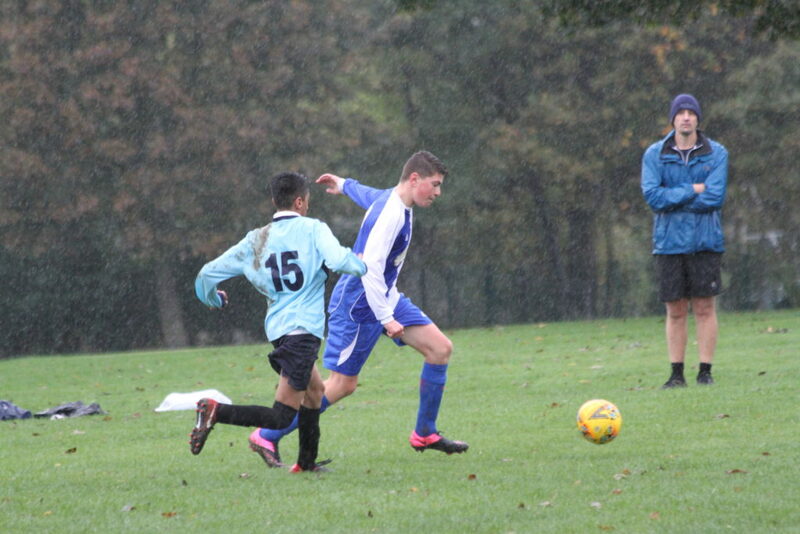 A physically much bigger team overpowered us in the rain. 7-0 down at half time, 14-0 at the end. A tough baptism. 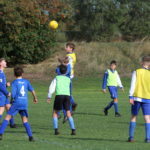 Ahead of their step up to 11 a side football and a move into a much tougher league U14s Girls faced reigning North Riding County Cup champions York RI in a pre-season friendly. 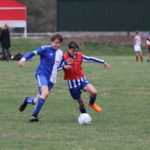 Competing against older, physically stronger girls on a much bigger playing surface than we are used to, we went behind twice, but ultimately outthought, outpassed, outran and outscored our opponents to come away with a very impressive 4-3 win.